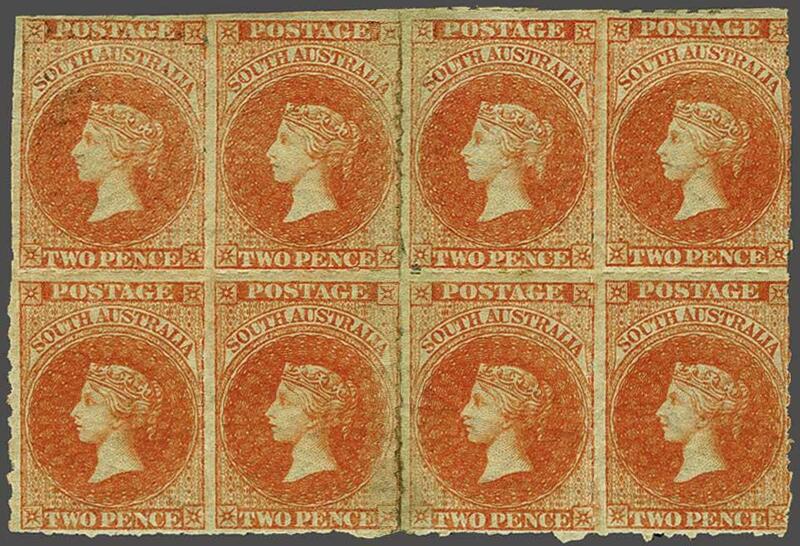 Adelaide printing from Perkins Bacon Plates 1858/59: 2 d. red, wmk. 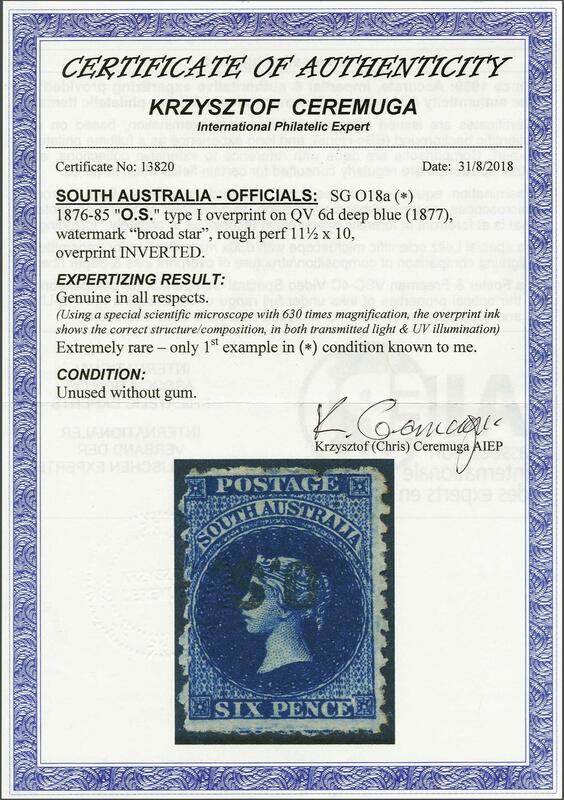 Large Star, rouletted, a fine example used on 1859 entire letter to Gawler Place cancelled by PAID / ADELAIDE S.A. datestamp (Nov 28) in blue. Scarce and very fine. 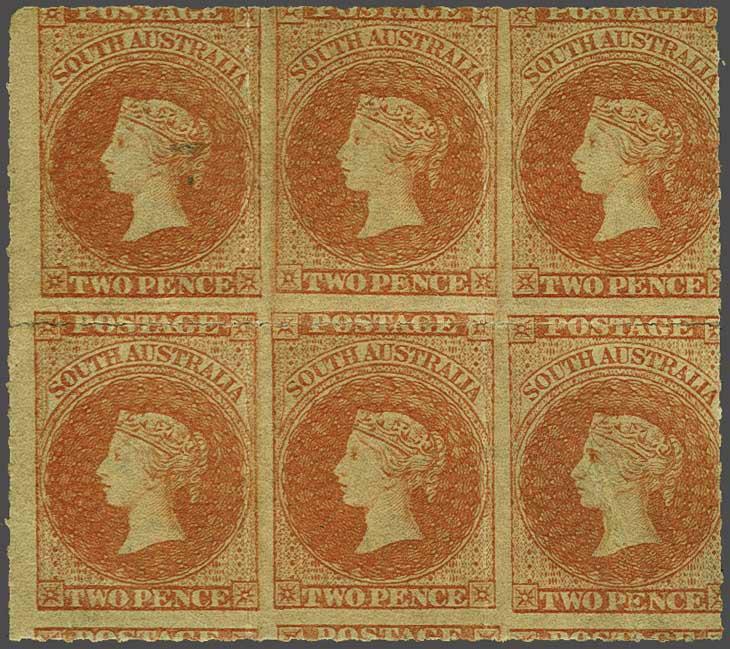 Adelaide printing from Perkins Bacon Plates 1858/59: 2 s. orange, wmk. 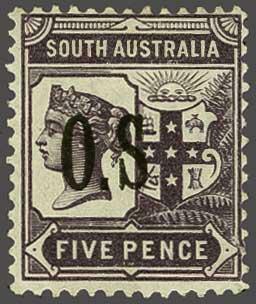 Large Star, rouletted, a fine horizontal strip of four, lightly cancelled by Adelaide obliterators in black. An attractive and scarce multiple Gi = £ 200+. 1860/69: 1 d. dull bluish sage green, wmk. 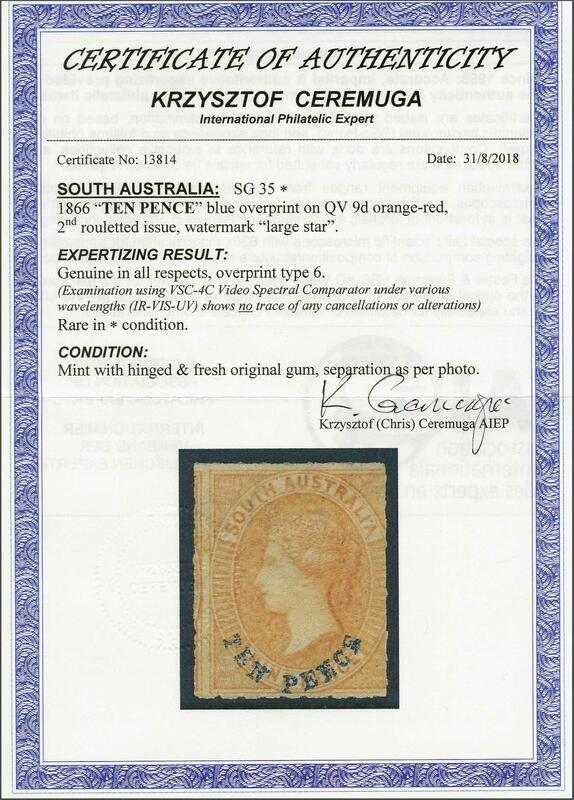 Large Star, rouletted, an unused block of four of rich colour, small surface thin at upper right and tiny tear at base of lower left stamp, despite the two faults an exceedingly rare multiple of delightful appearance, large part og. Ceret. Ceremuga (2018) Gi = £ 600+. 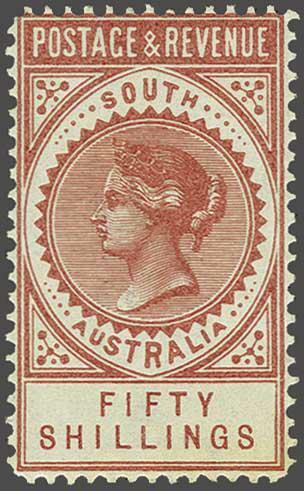 Second Rouletted Issue 1860/69: 1 d. pale red, wmk. 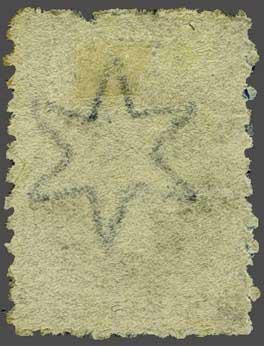 Large Star, rouletted, a fine unused block of six of good colour, minor corner creases not apparent on front, first stamp with slight stain, otherwise fresh and fine, large part og. 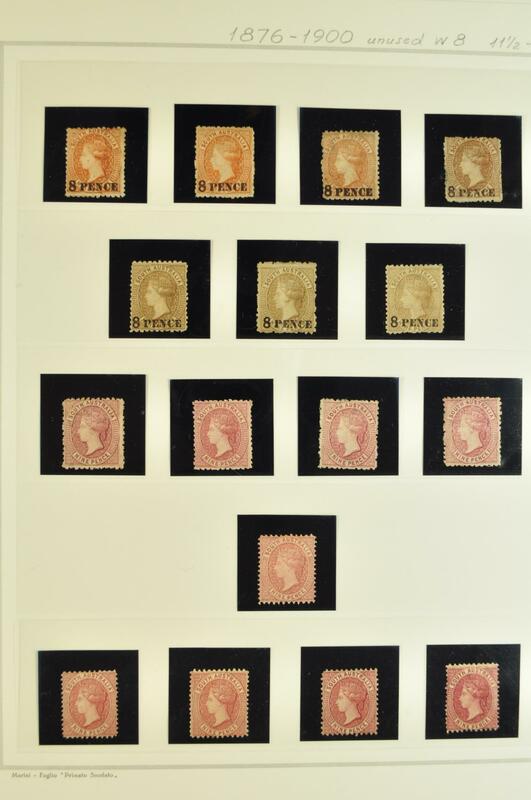 An attractive and scarce multiple Gi = £ 1'250+. 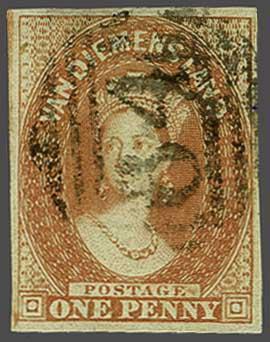 Second Rouletted Issue 1860/69: 1 d. bright vermilion, wmk. Large Star, rouletted, a fine unused block of eight of good colour, slight rusting at base on roulettes, minor gum creasing, fresh and fine, large part og. 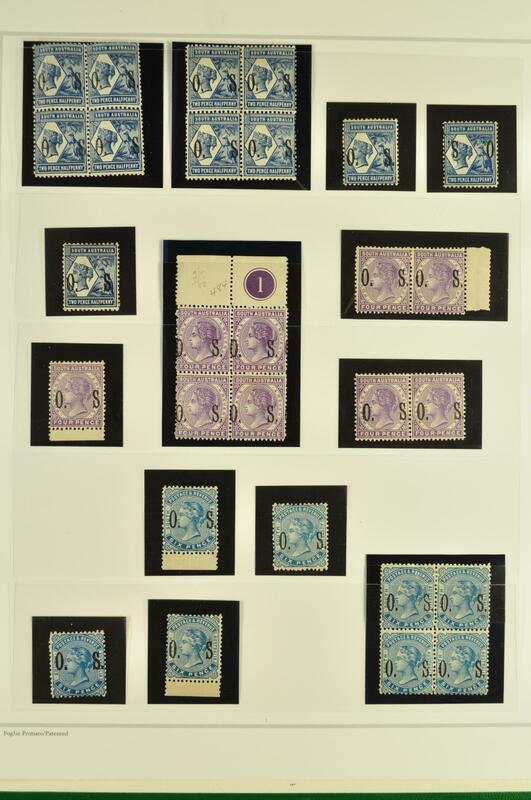 An attractive and scarce multiple Gi = £ 1'200+. 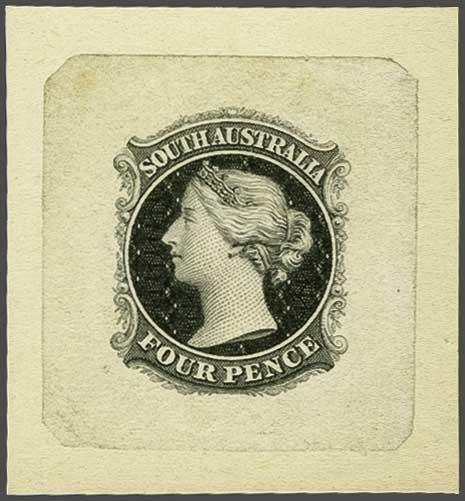 Second Rouletted Issue 1867: Die Proof for the 4 d. value in black on white paper, Plate 1 with dot on the Queen's ear, affixed to card, 38 x 41 mm., superb and very rare.rnrnProvenance: Collection E. R. Slade Slade, Harmers, Sydney, 29 Nov 1979, lot 152. 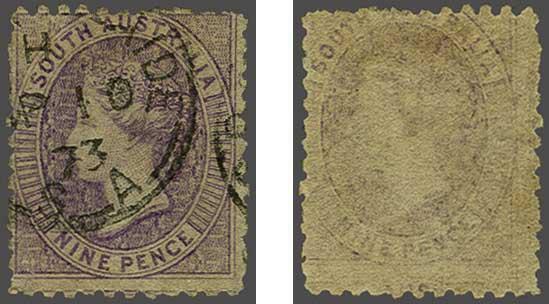 Second Rouletted Issue 1860/69: 4 d. dull violet, wmk. Large Star, rouletted, a fine unused block of four of good rich colour, fresh and very fine, large part og. A scarce and most attractive multiple Gi = £ 640+. 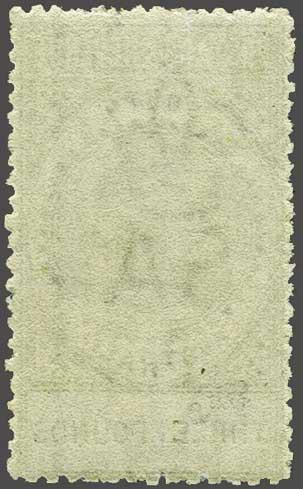 Second Rouletted Issue 1860/69: 9 d. grey-lilac, wmk. 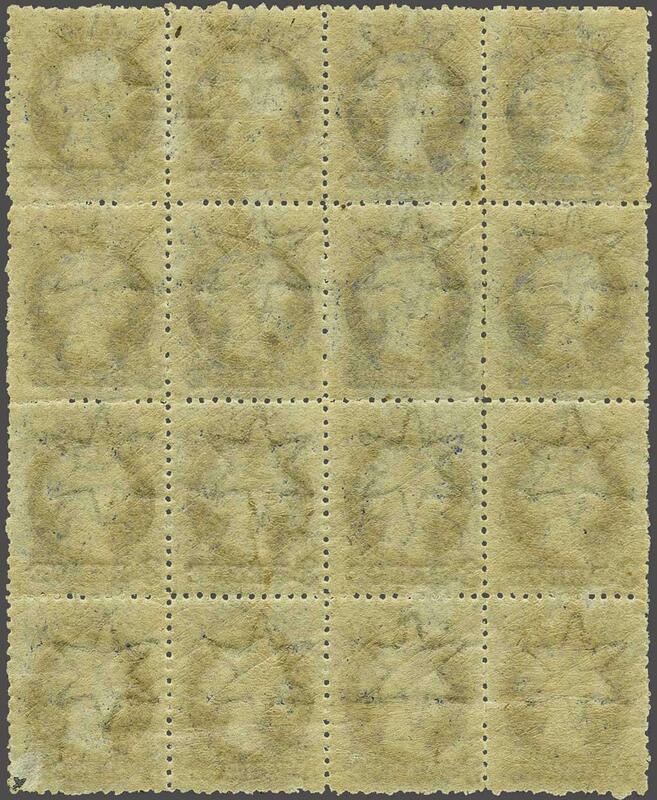 Large Star, rouletted, a fine unused block of six (3 x 2), of fine delicate colour, one small natural gum stain barely affects appearance, superb og. 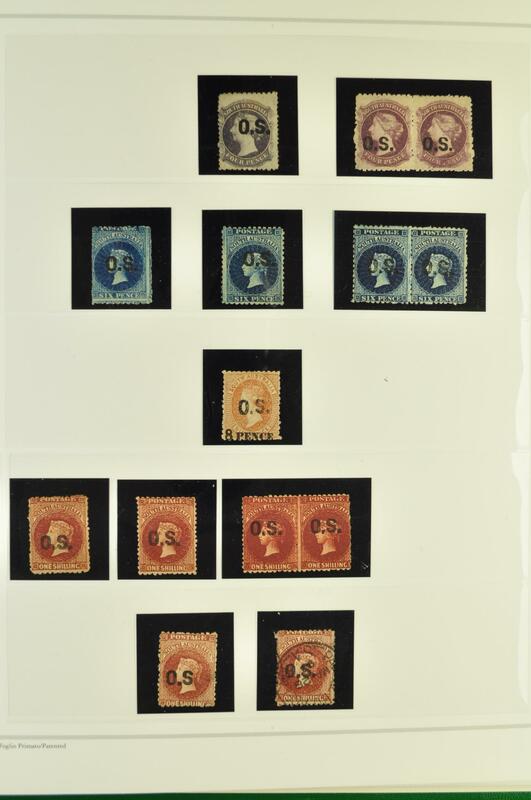 with lower three stamps unmounted og. 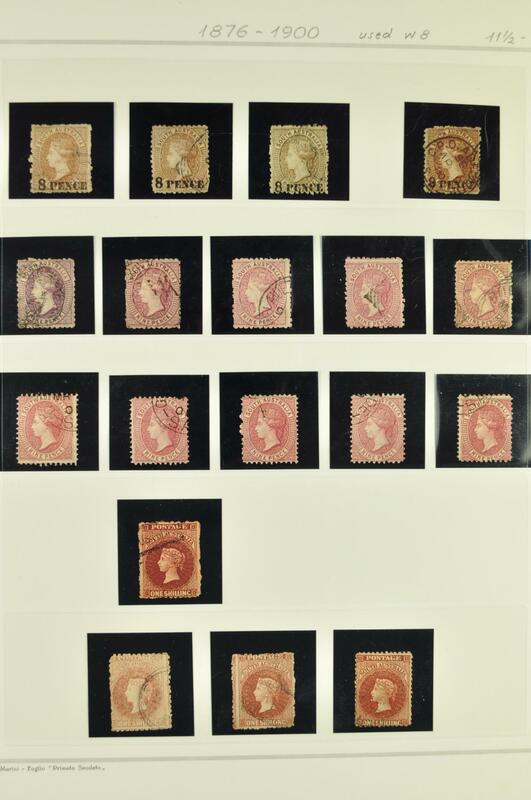 A delightful block, the largest recorded unused multiple Gi = £ 900+.rnrnProvenance: Collection Colonel Napier, RL, London, 11 May 1976, lot 101.rn Collection John O. Griffiths, RL, London 3 June 1992, lot 1150. 1860/69: TEN PENCE in blue on 9 d. orange-red, opt. Type 6, rouletted, a fine unused example of good colour, fresh and fine, large part og. Cert. Ceremuga (2018) Gi = £ 550. 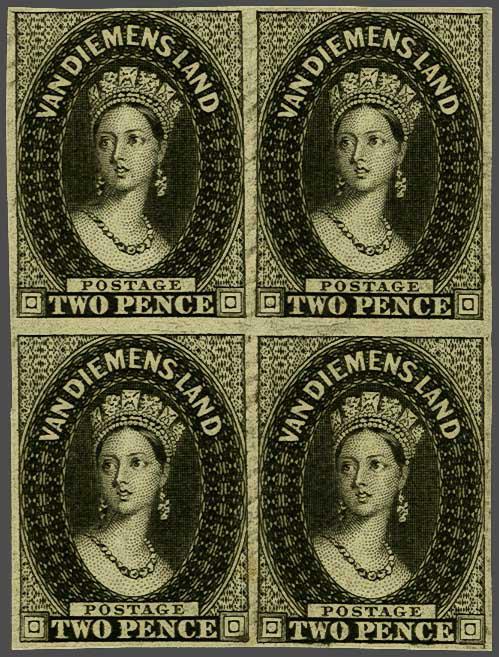 Second Rouletted Issue 1860/69: Plate Proof for the 2 s. value in black, imperforate block of four on thick white wove paper, fresh and very fine. A scarce and attractive block. 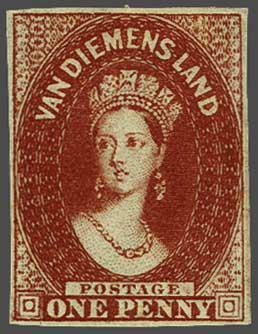 Perforation Experiments / Emergency Issue 1868/71: 2 d. vermilion, wmk. Large Star, perf. 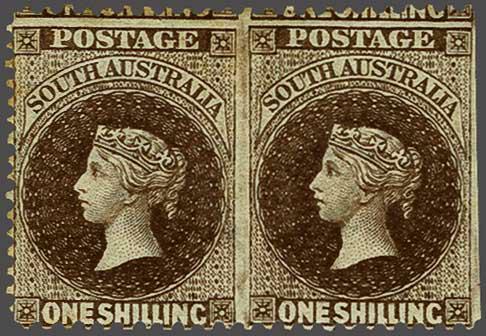 11½-12½ from imperforate issue, a fine used example of this elusive stamp, cancelled by fine strikes of "108" numeral obliterator of Callington in black. 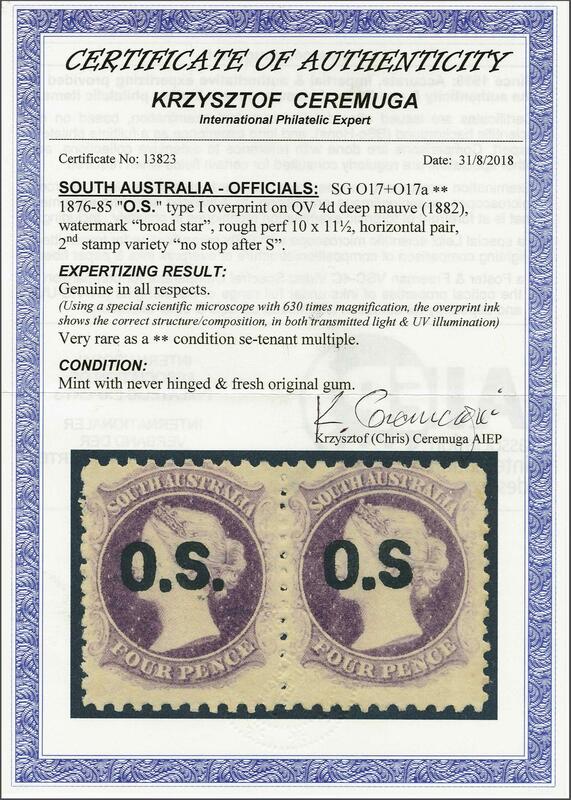 Superb example of a very rare stamp. Signed Houtzamer. Cert. BPA (2001) Gi = £ 1'400. 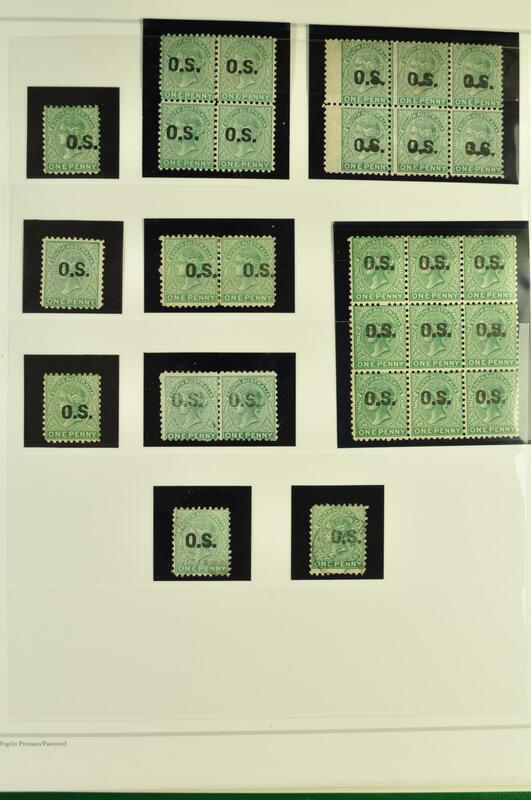 1867/70: 2 d. blue-green, perf. 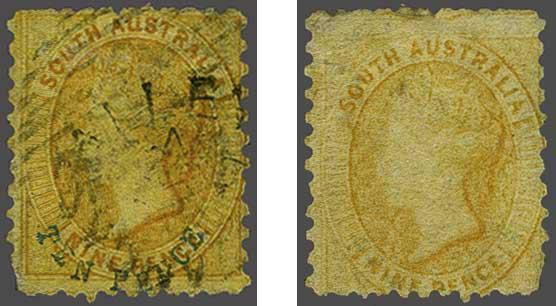 11-12½ x roulette, an unused horizontal pair of good colour, watermark and slight iron in gum showing through, minor thin, large part og. 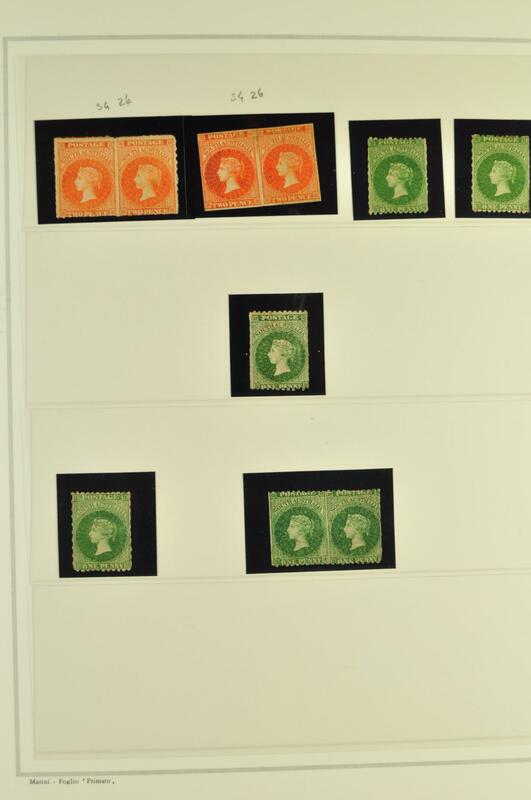 A scarce multiple Gi = £ 1'100+. 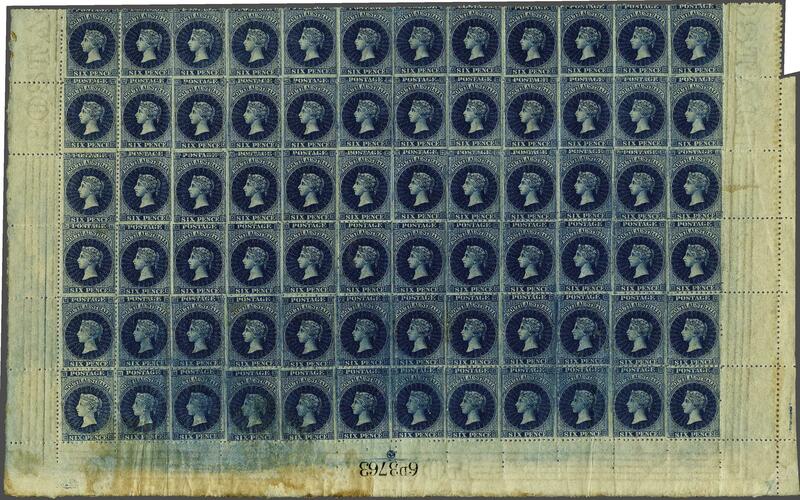 Perforation Experiments / Emergency Issue 1868/71: 6 d. pale bright blue, wmk. 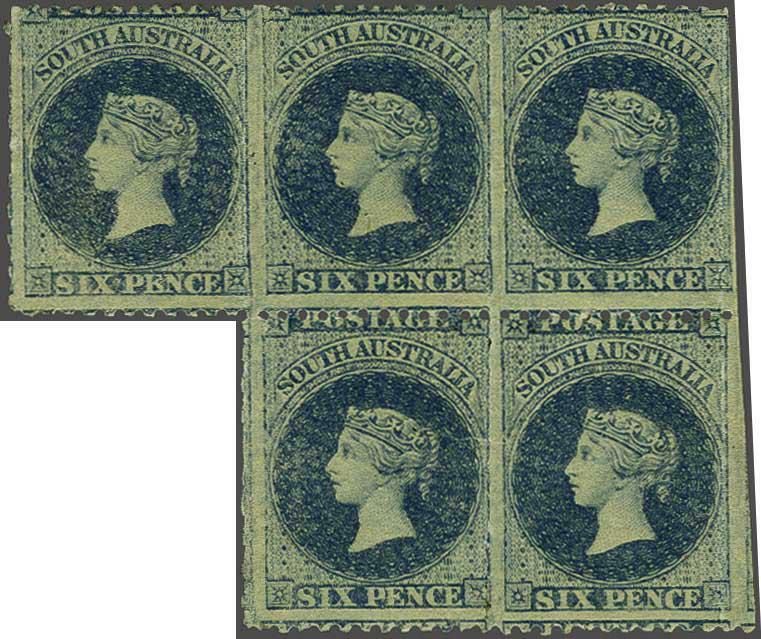 Large Star, rouletted issue perforated 11½-12½, a fine unused block of five, of excellent colour and generally very fine large part og. 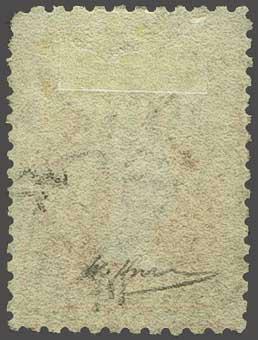 An exceedingly scarce stamp in a large multiple Gi = £ 4'500+.rnrnProvenance: Collection Alfred J. Caspary, Harmers, London, 8 Oct 1958, lot 445. 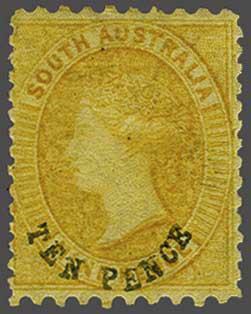 1869: TEN PENCE in blue on 9 d. yellow, opt. Type 3, perf. 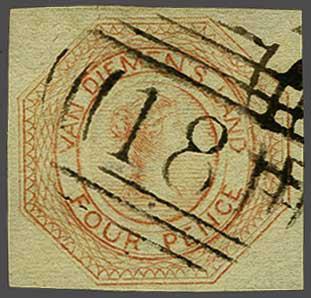 11½ x reperforated 10 at sides, a used example variety "Printed Both Sides", cancelled by 'Eden Valley' cds and part barred numeral handstamp in black. Reverse with weaker but fine impression. A rare variety, only known used. Cert. Ceremuga Gi = £ 1'200. 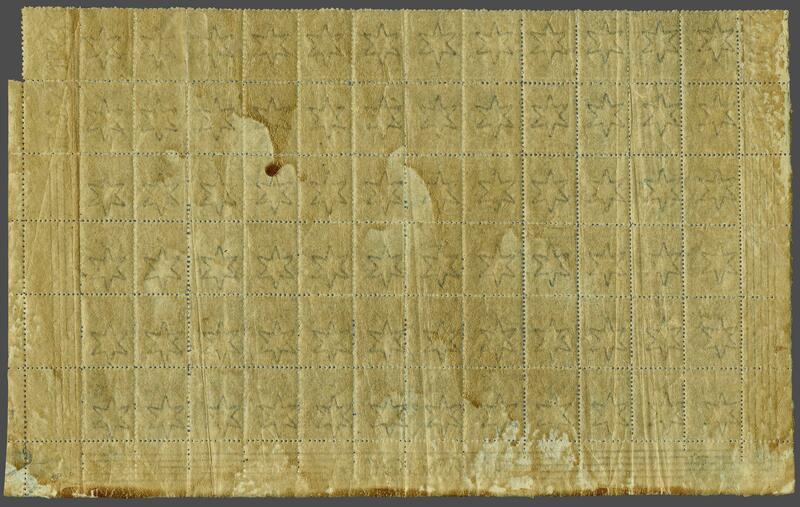 Perforation Experiments / Emergency Issue 1868/71: 1 s. chestnut red-brown, wmk. 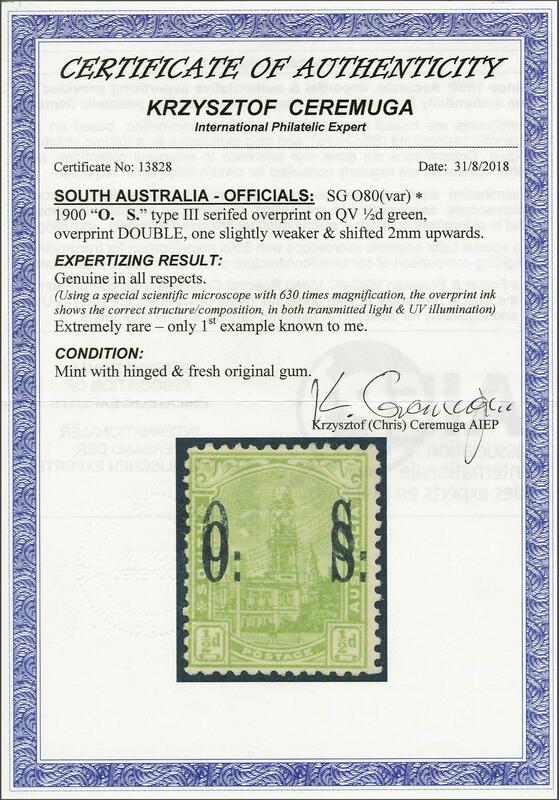 Large Star, rouletted issue perforated 11½-12½, lightly used example showing significant 'Double Impression' variety, especially prominent on the SOUTH AUSTRALIA tablet, cancellation leaving the variety very clear. Scarce. 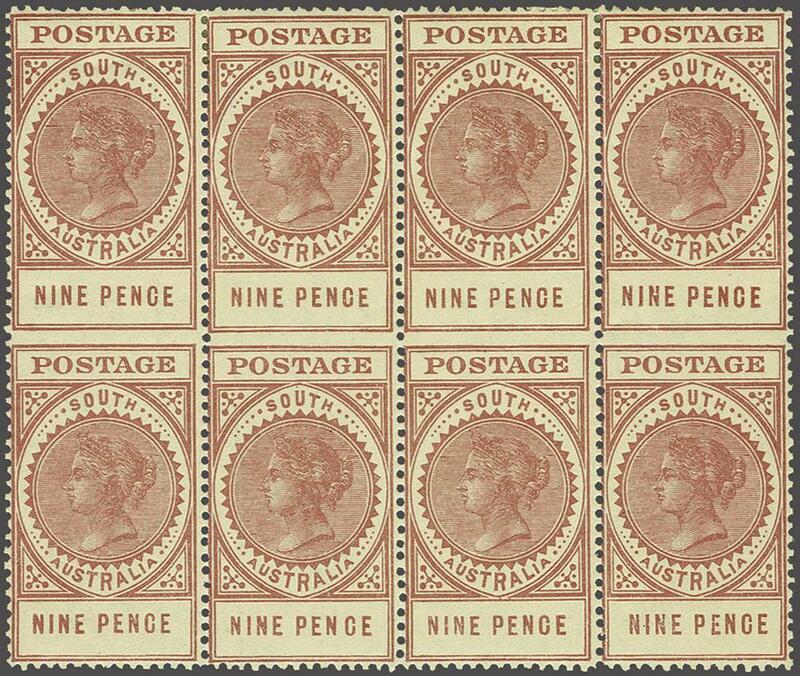 1868/79: 9 d. bright mauve, wmk. Large Star, perf. 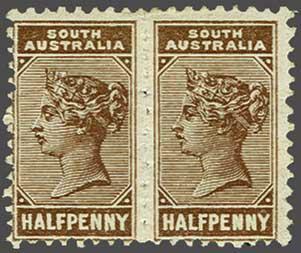 11½-12½, a fine used example with variety 'Printed on Both Sides', cancelled neatly by 'Port Adelaide' cds dated SP.10.73 in black. 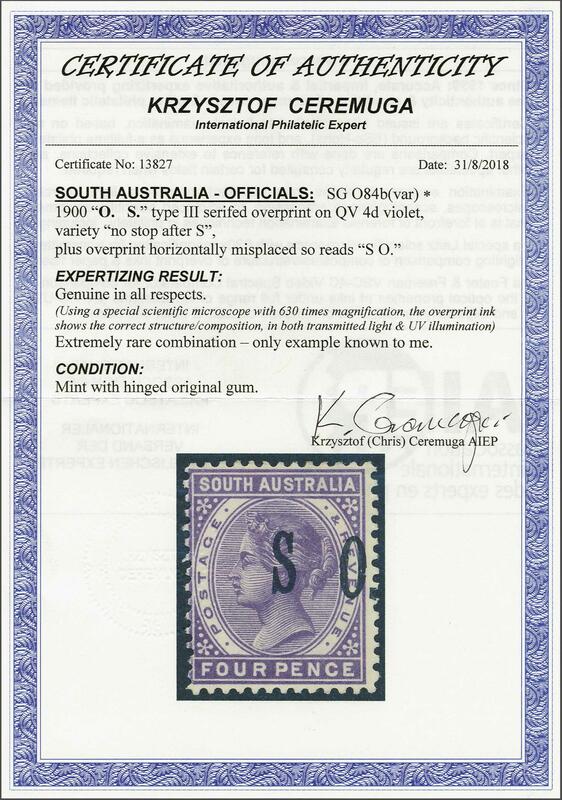 A fine example of this rare stamp. Cert. BPA (2007) Gi = £ 900. 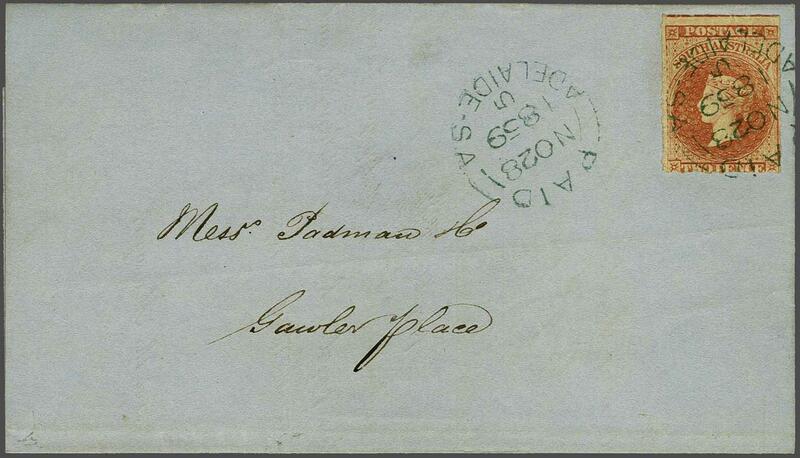 Incoming Mail 1870 (Oct 31): Cover franked by Great Britain 1867/80 6 d. mauve pl. 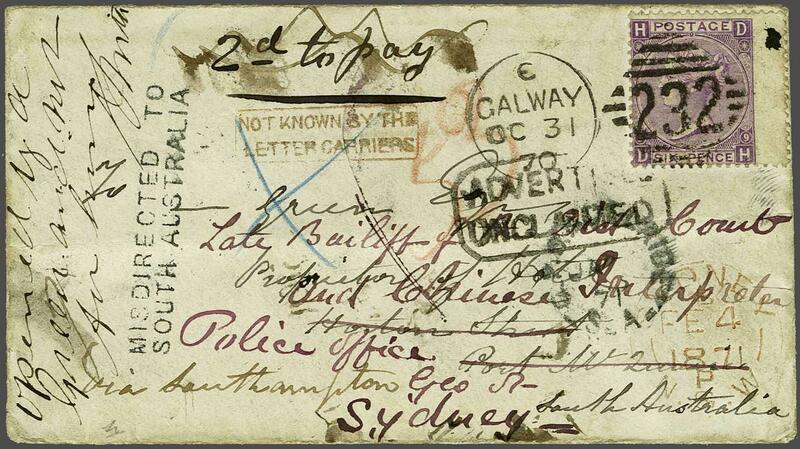 9 tied by 'Galway / 232' duplex in black, originally addressed 'via Southampton' to 'Green, Proprietor of Hotel, Port McQueen, South Australia', with Port Adelaide arrival cds (Jan 17, 1871) on reverse. 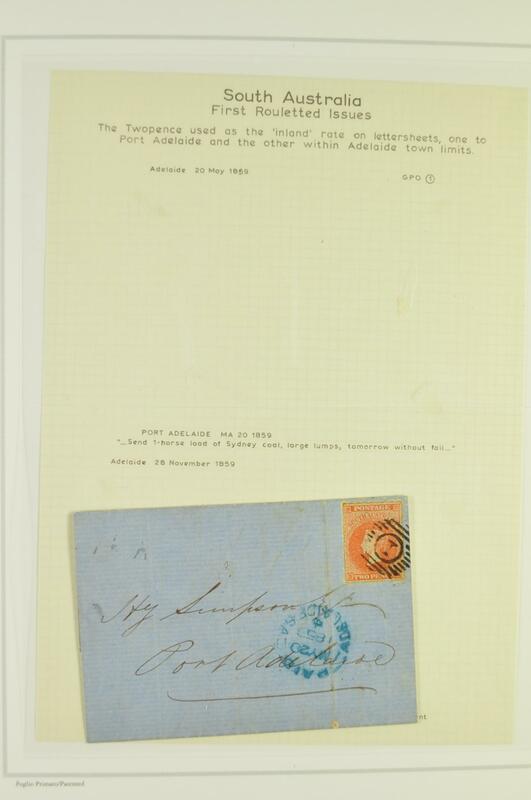 The addressee unfound (framed ADVERTISED / UNCLAIMED) and the cover struck with MISDIRECTED TO / SOUTH AUSTRALIA in black and the cover sent on to Sydney (Jan 26) and thence to 'Port Macquarie / NSW' (Jan 30) where marked 'Opened by A. Green and not for him' in manuscript. 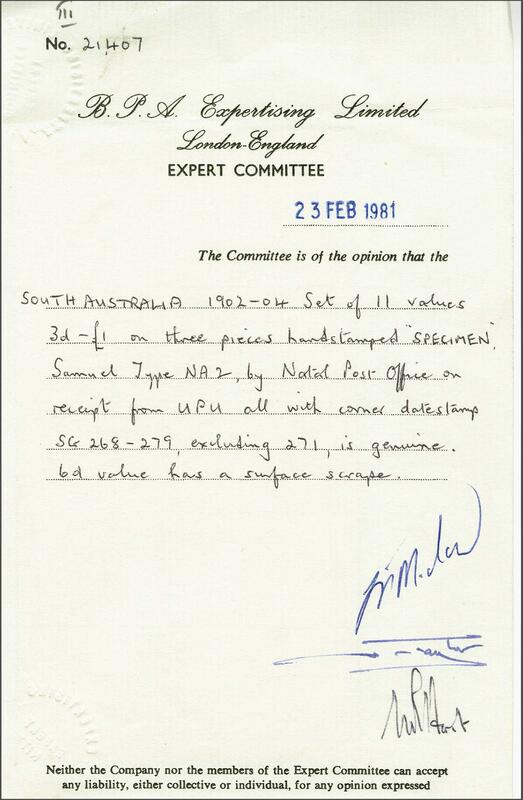 Framed NOT KNOWN BY THE / LETTER CARRIERS and 'Sydney' cds (Feb 4) in red also on front and eventually mailed on to the 'Chinese Interpreter, Police Office, George St, Sydney'. A most unusual and fascinating cover. 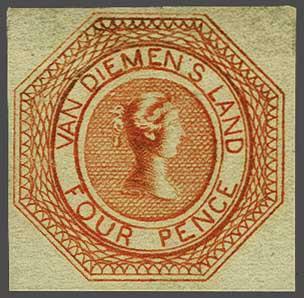 1870/71: 3-PENCE in red on 4 d. dull ultramarine, wmk. Large Star, perf. 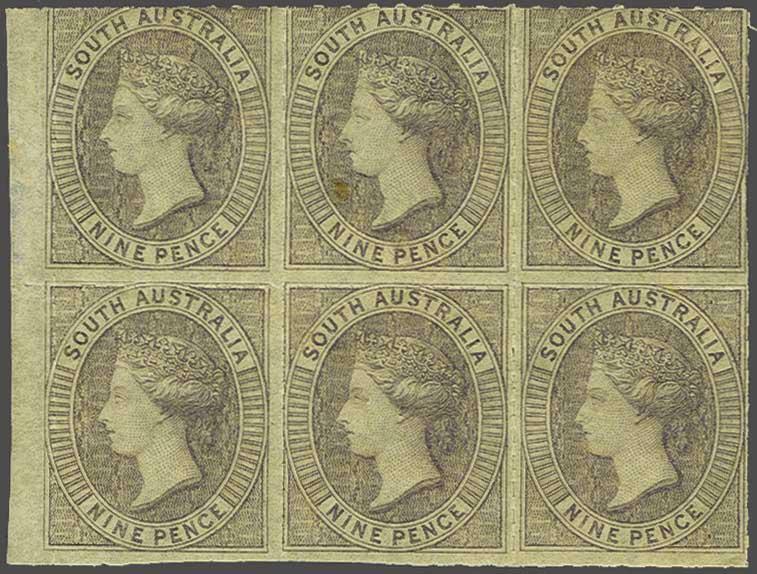 10, a fine unused example of good colour and perforations, redistributed large part og. A very rare stamp. Cert. Ceremuga (2018) Gi = £ 1'500. 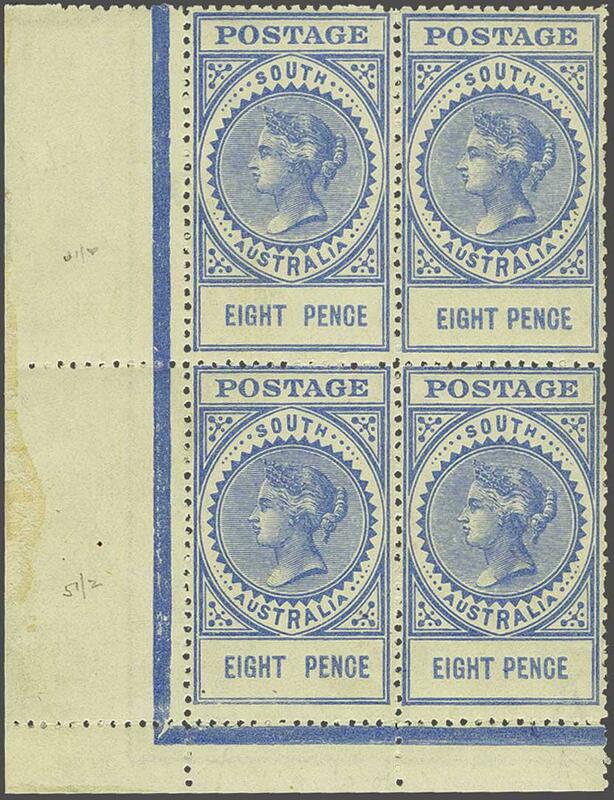 1870/71: 3-PENCE on 4 d. ultramarine, wmk. Large Star, perf. 10, overprinted in black, a fine unused example of good colour, fresh and very fine with just a couple of tiny gum skips,, large part og. Scarce Gi = £ 500. 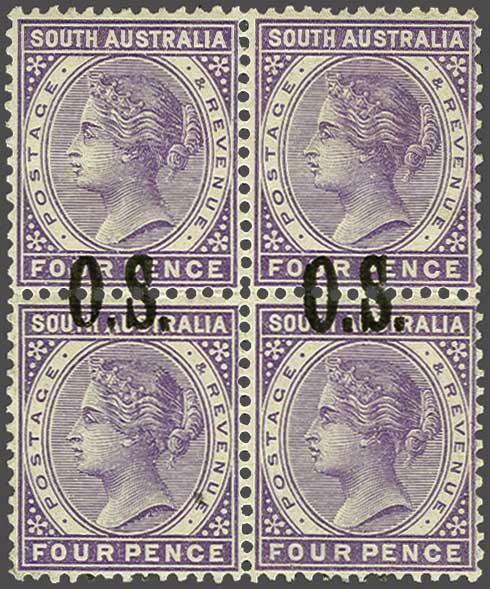 Compound Perforation Issue 1870/73: 4 d. dull lilac, compound perf. 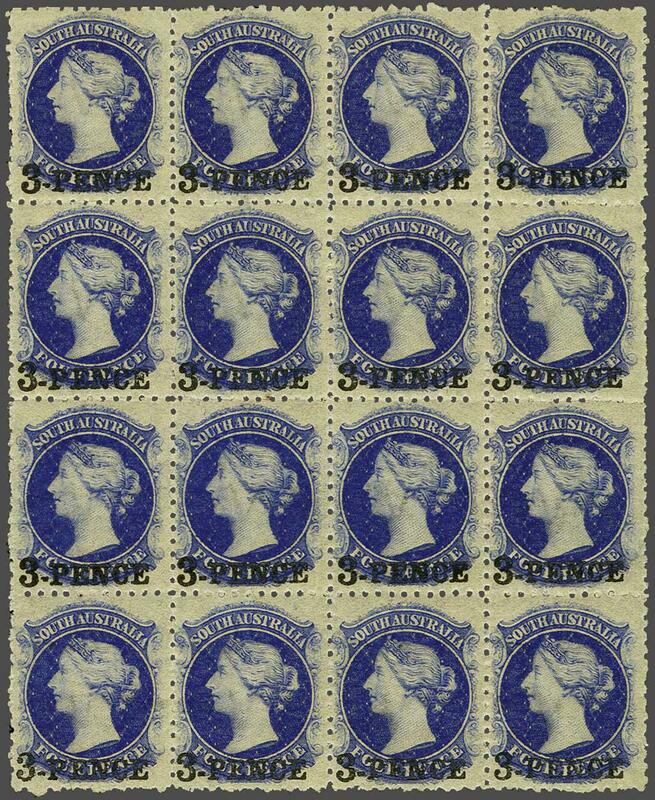 11½ x 10, a very fine unused horizontal pair in this rare shade, exceptional correct colour without any of the blue tinge found in the slate-lilac shade, fresh and very fine, large part og. Rare. Gi = unpriced.rnrnProvenance: Colonel Napier. 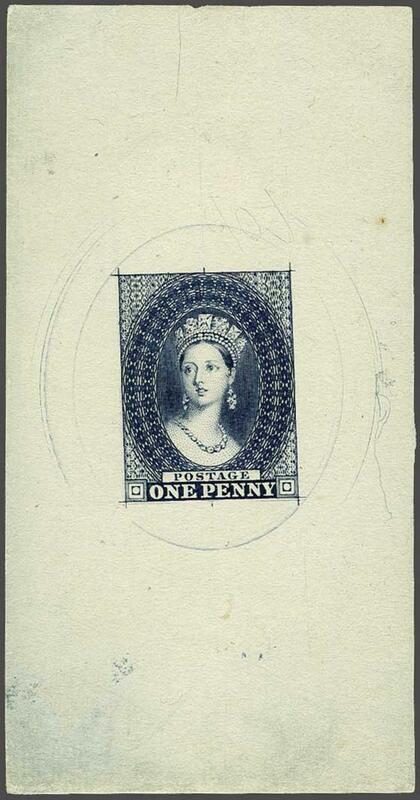 1868/79: 3-PENCE on 4 d. Prussian blue, perf. 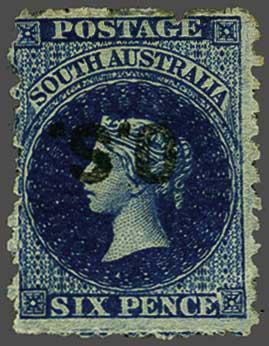 11½-12, used on the famous 1871 cover to London endorsed 'via Brindisi' with 1870/73 6 d. bright Prussian blue, tied by 'Port Augusta' datestamps (Oct 5) in black. 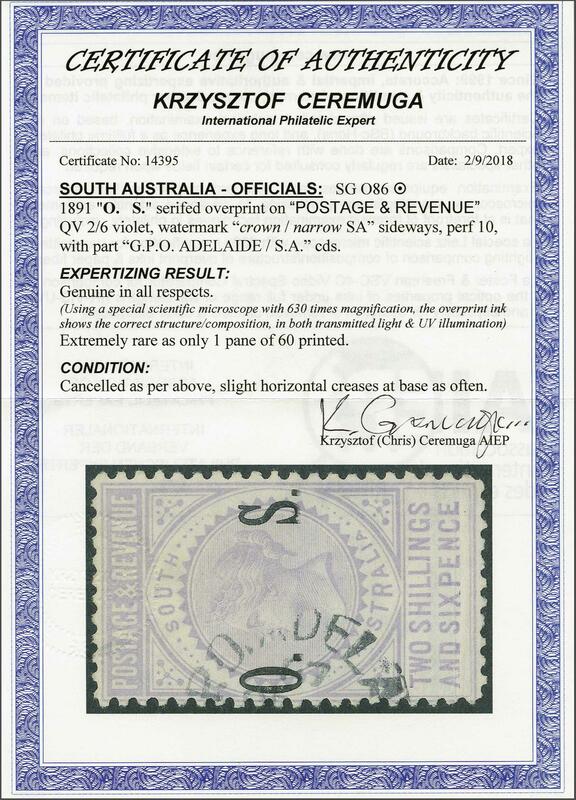 Reverse with 'P-O / Railway' cds (Oct 7) and 'GPO Adelaide' transit cds (Oct 7). 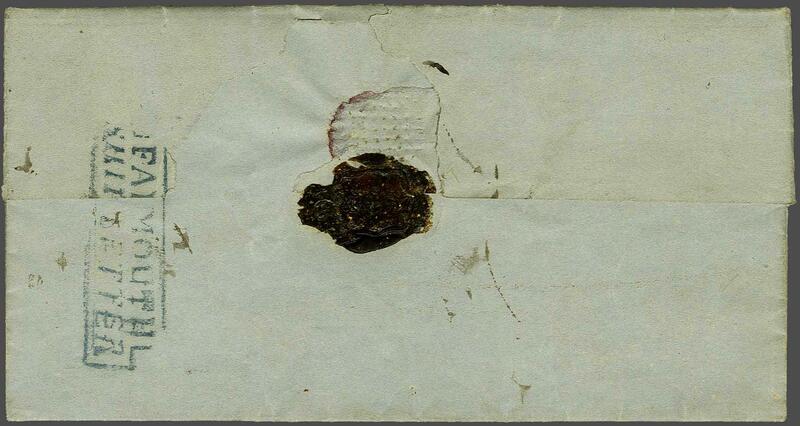 The envelope with insignificant tears at top away from the adhesives. 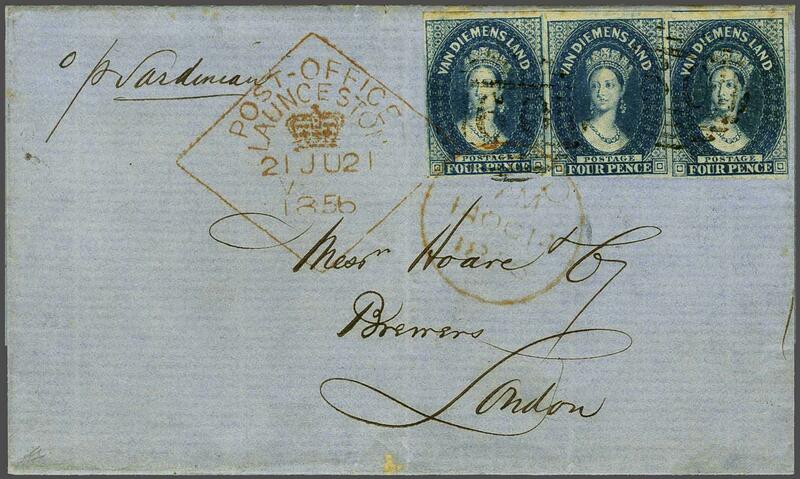 Wonderful and of great rarity - the sole recorded usage of the overprinted 3 d. on 4 d. Prussian Blue on letter. Cert. 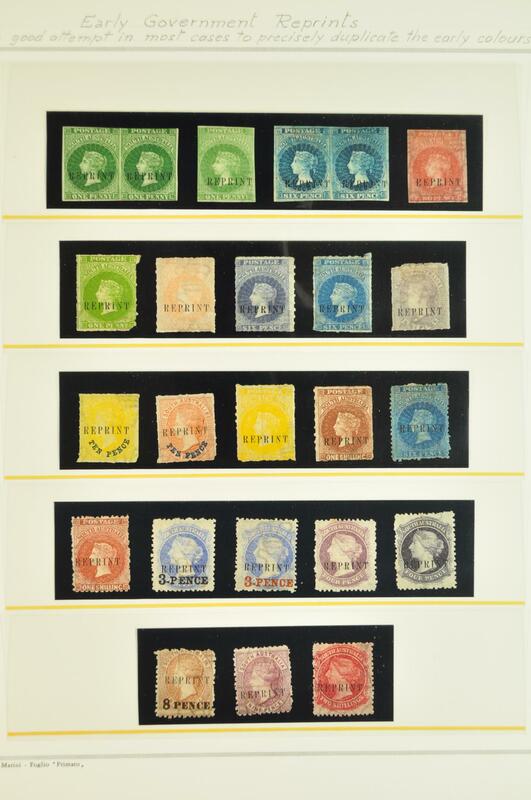 RPS (1958).rnrnProvenance: Collection Julius Beresford, RL, London, 5 Feb 1958, lot 436. 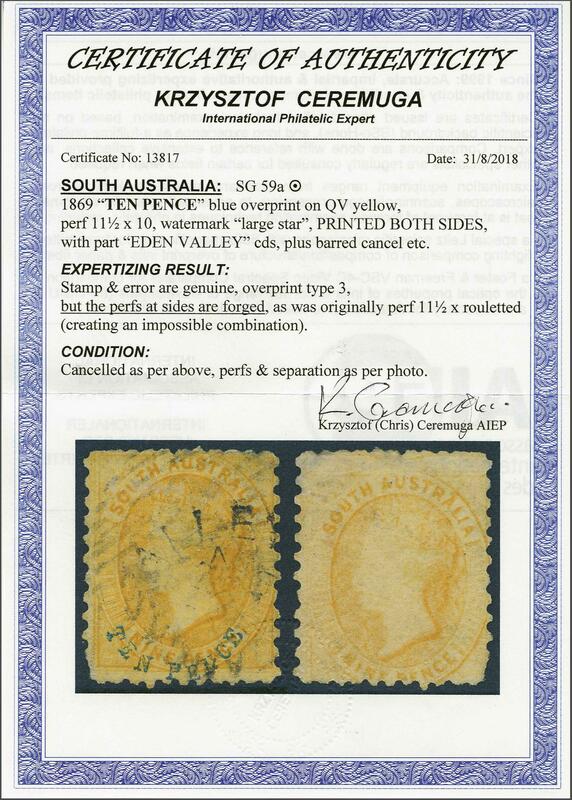 Compound Perforation Issue 1870/73: 10 d. in black on 9 d. yellow, compound perf. 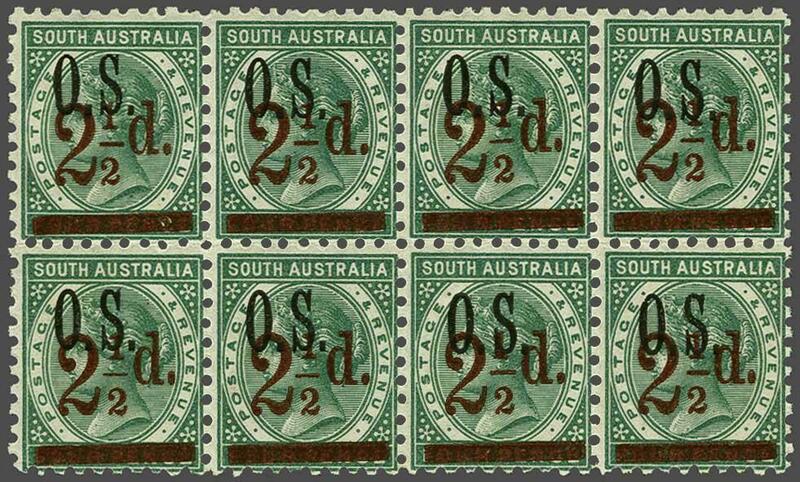 10 x 11½, a fine unused example of excellent centering for this stamp, fresh and fine, large part og. Gi = £ 300. 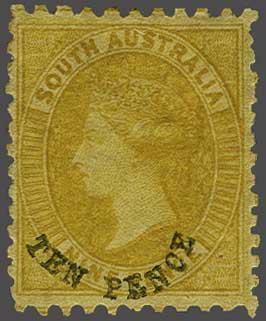 1870/73: TEN PENCE in black on 9 d. yellow, opt. Type 3, perf. 10 x 12½, a fine unused example of good colour, fresh and fine, large part og. Cert. Ceremuga (2018) Gi = £ 325. 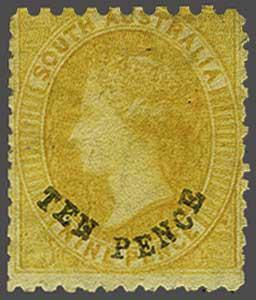 1870/73: TEN PENCE in black on 9 d. yellow, opt. Type 5, perf. 10 x 12½ x 11½ x 12½, a fine unused example of good colour, fresh and fine, large part og. Cert. Ceremuga (2018) Gi = £ 325+. 1871 (July 17): 4 d. dull lilac, wmk. V over Crown, perf. 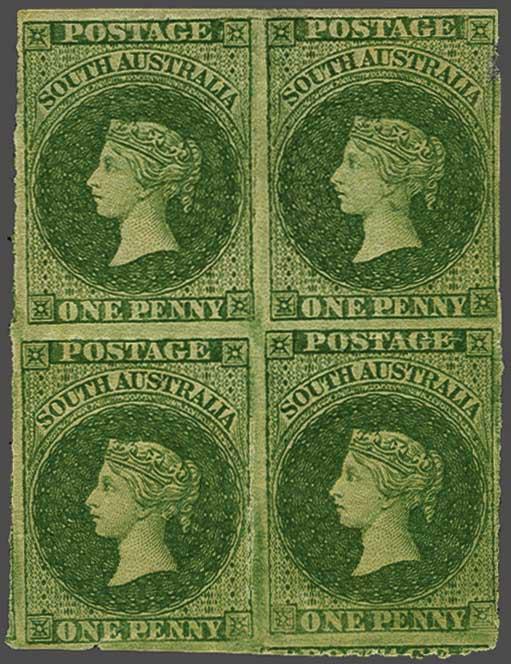 10, a fine used horizontal strip of three (a marginal strip showing POSTAGE watermark), centred to left, of good colour with central stamp showing vertical pre-printing paper fold, lightly cancelled in black (April 12, 1872). 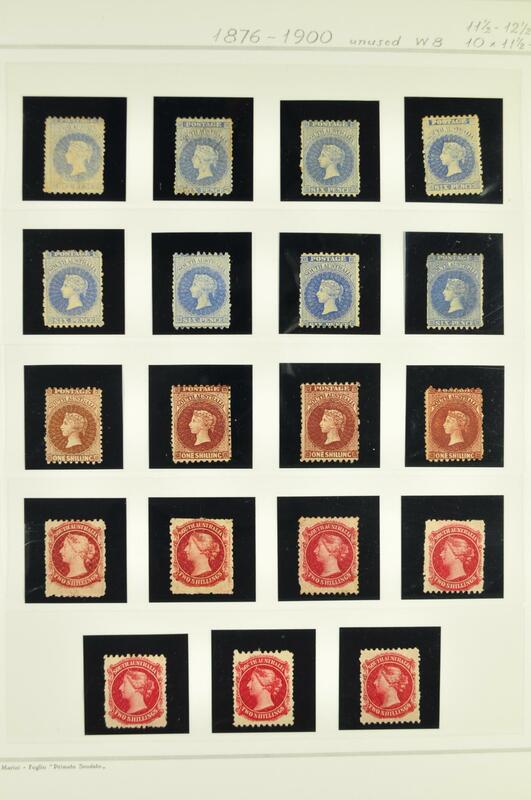 A scarce and most unusual multiple of this rare stamp Gi = £ 975. 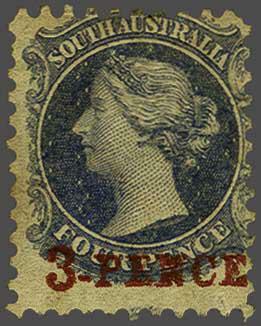 1876/1900: "3-PENCE" on 4 d. ultramarine, wmk. Broad Star, perf. 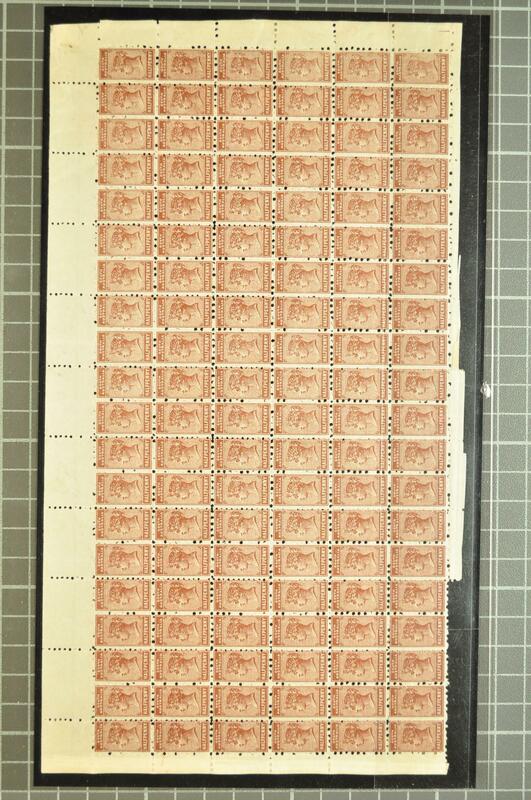 11½-12, a superb unused block of sixteen (4 x 4), in a lovely fresh shade with large part or unmounted og. 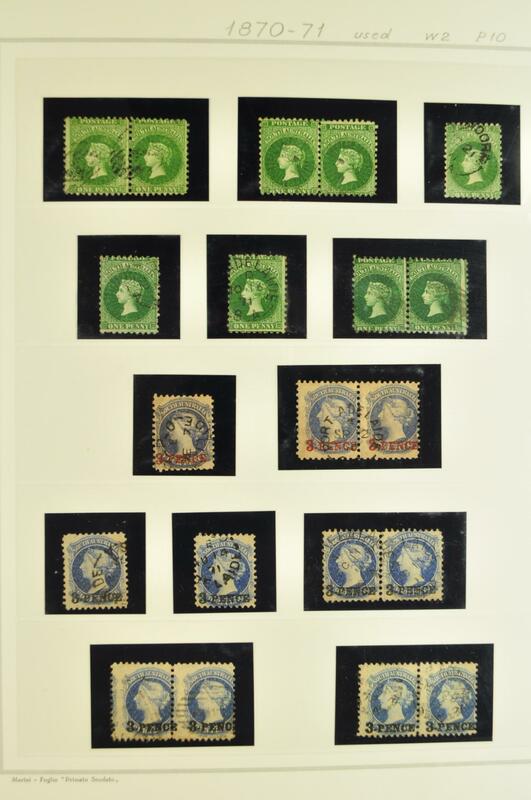 A magnificent and rare multiple Gi = £ 2'500+. 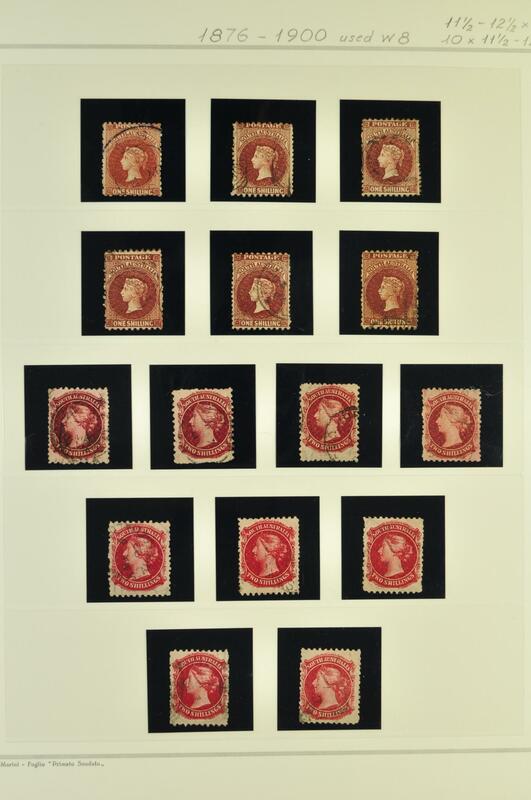 1876/1900: 1 s. red-brown, wmk. Broad Star, perf. 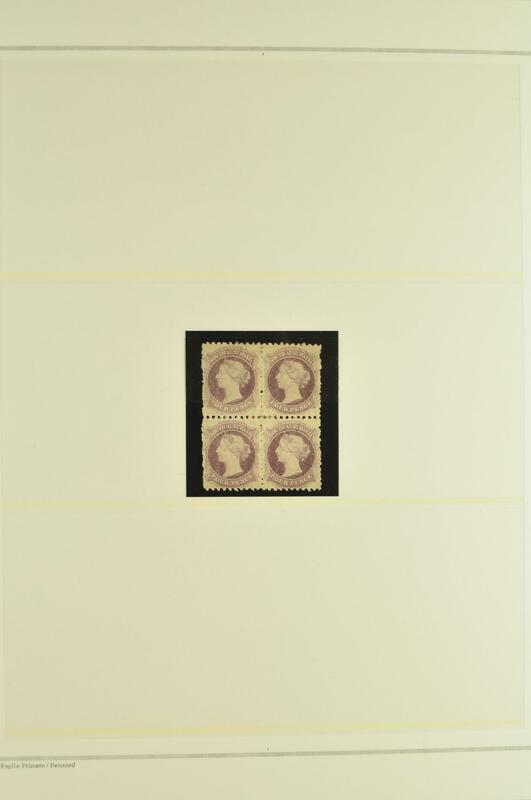 11½-12 (large holes), a fine unused horizontal pair, variety "Imperforate Vertically Between", fresh colour, slight diagonal bend, unused without gum. Scarce Gi = £ 450. 1901/02: 1 s. dark reddish brown, wmk. Crown SA, perf. 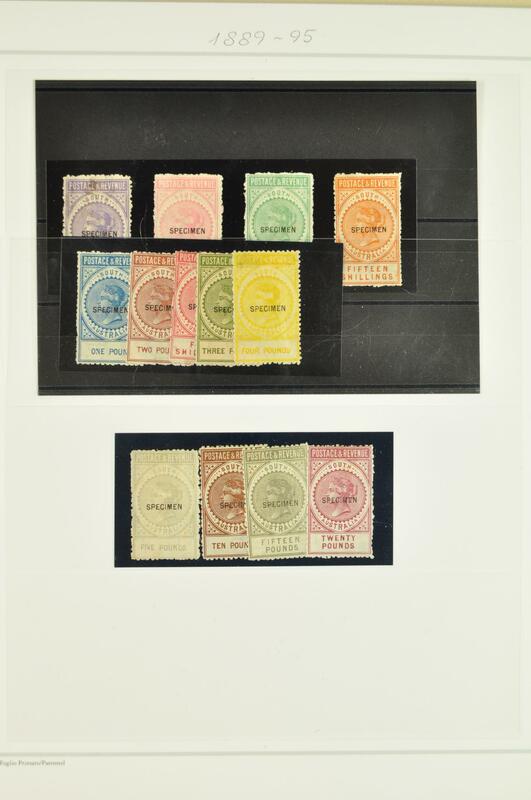 11½-12, a fine unused block of sixteen (4 x 4), of fresh colour and superb large part or unmounted og. A scarce and most attractive multiple Gi = £ 400+.rnrnProvenance: Colonel Napier. 1901/02: 2 s. carmine, wmk. Crown SA, perf. 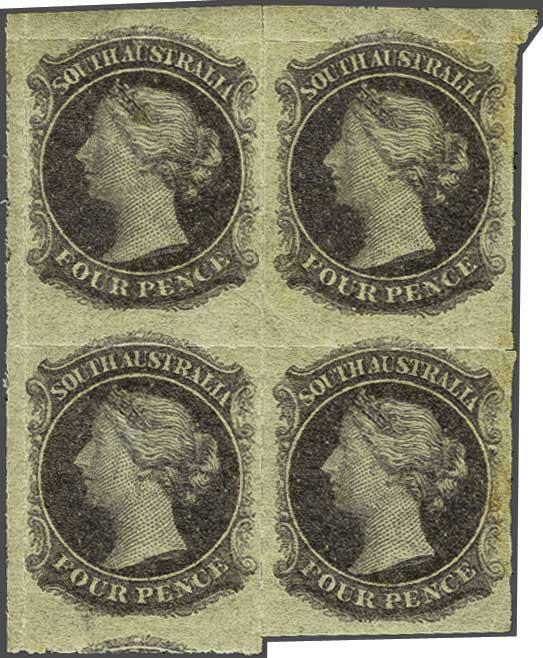 11½ x 12, (small holes), a fine unused vertical strip of five in a deep shade, each stamp overprinted SPECIMEN in black, fresh and fine multiple with large part og. Signed Holcombe. 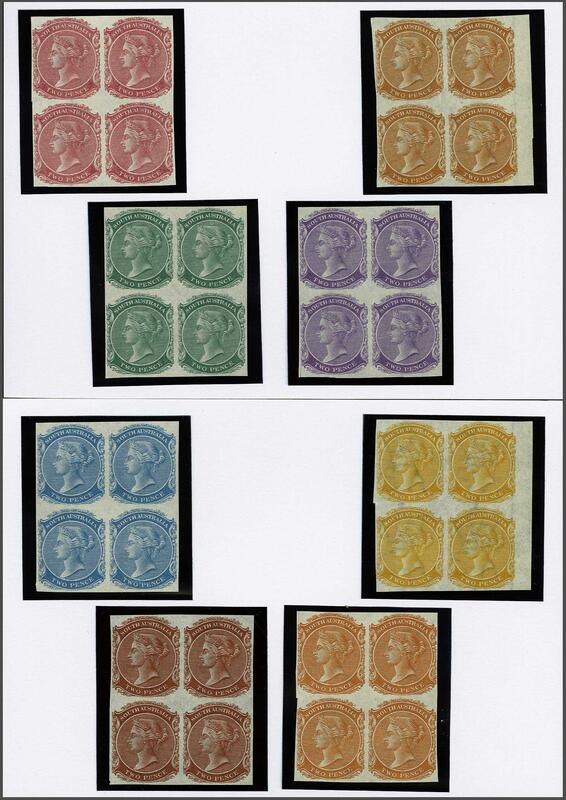 1877/80: Trial Colour Plate Proofs for the 2 d. value, all on thin white wove paper, watermarked 'Crown over SA' (wide), in eight blocks of four in a range of eight different shades: pale blue, green, violet, orange-yellow, orange-brown, dull orange, pale rose and deep brown-rose. Generally superb, a lovely group. 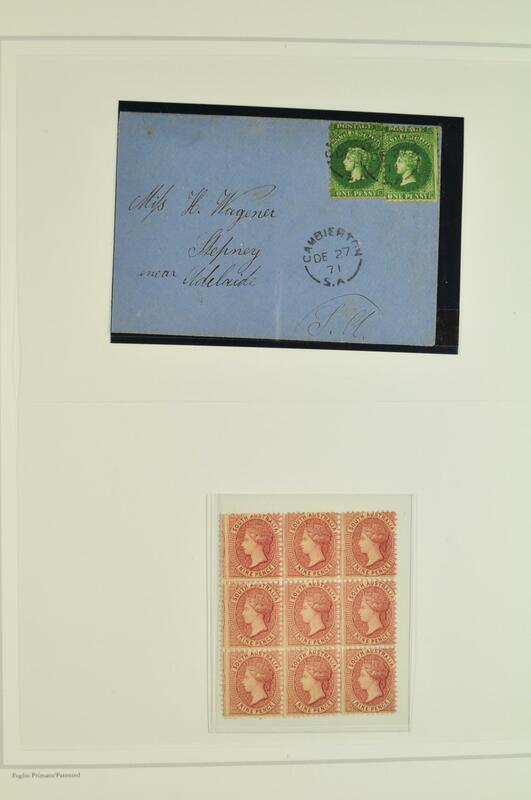 Surface Printed Issues 1868/76: 2 d. pale orange-red, wmk. Crown SA, perf. 10 x rouletted, a fresh unused example, large part og. 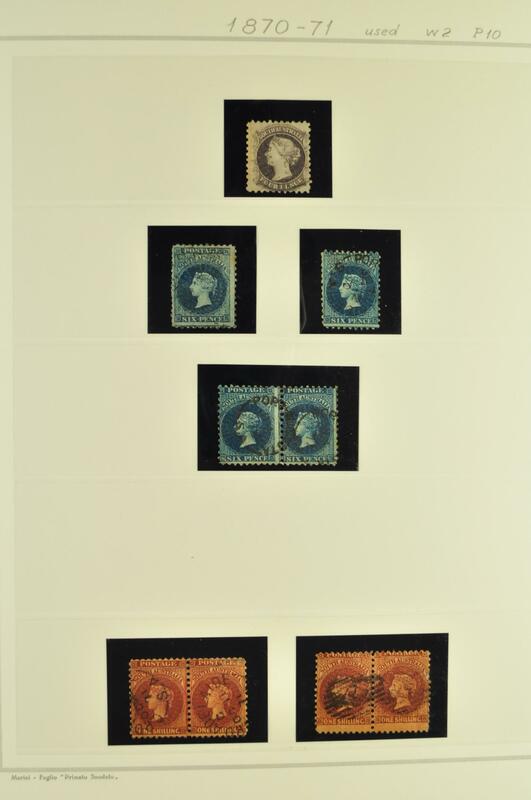 A very scarce stamp Gi = £ 500. 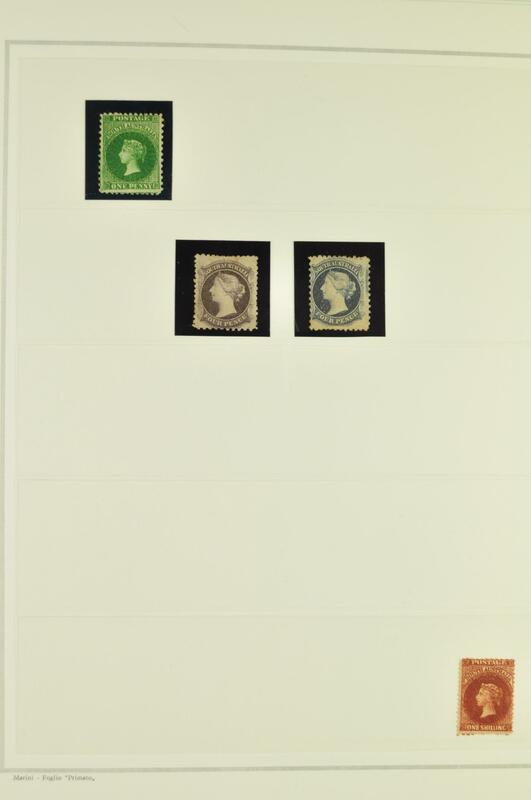 1876/1904: 1 d. deep green, wmk. Crown SA, perf. 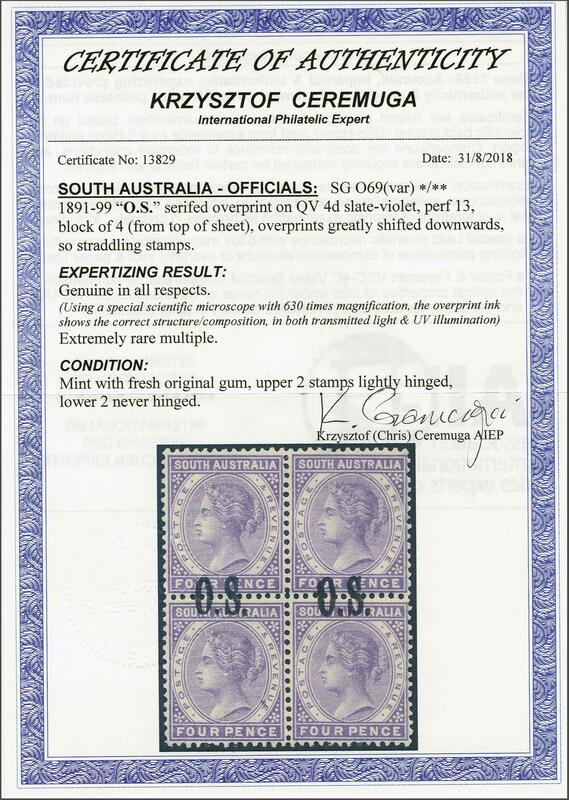 10, a used example with variety "Double Impression", with slight central stain of no significance as this example is the discovery copy which resulted in the Stanley Gibbons listing. Matched with an unused normal example for comparison. 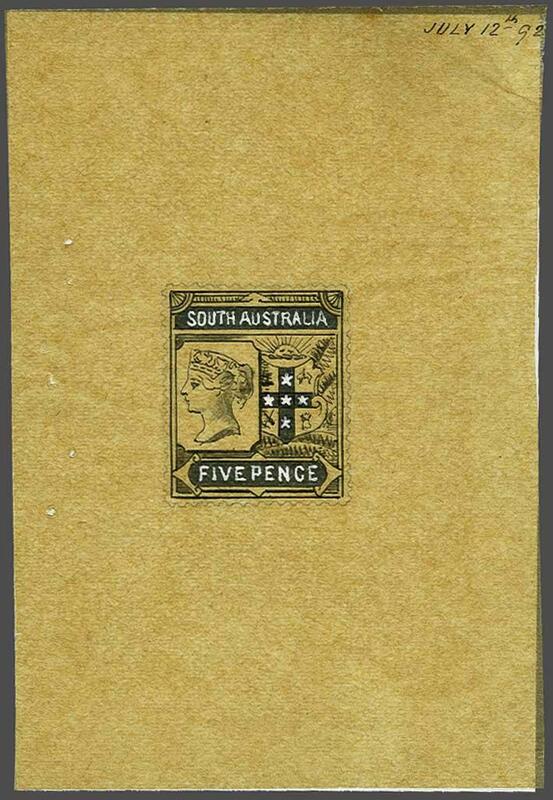 A very scarce stamp. Cert. 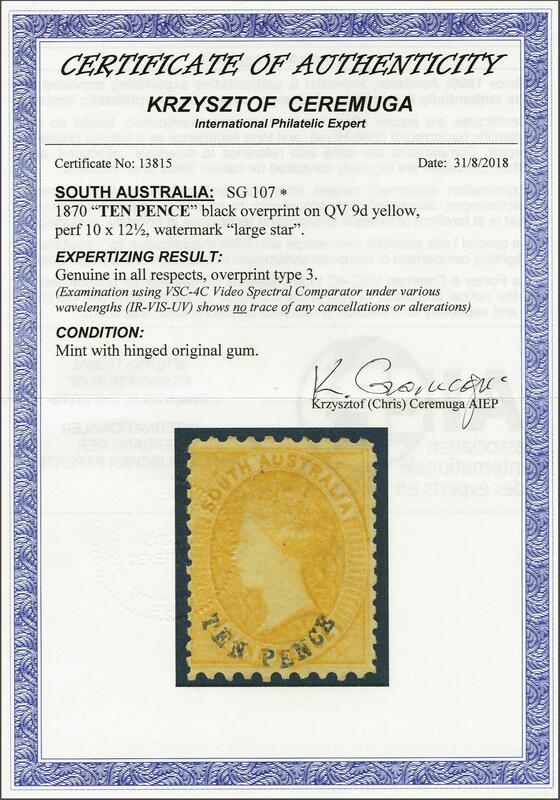 BPA (1993) Gi = listed but unpriced.rnNote: Since the Stanley Gibbons listing we are aware of further examples being found. 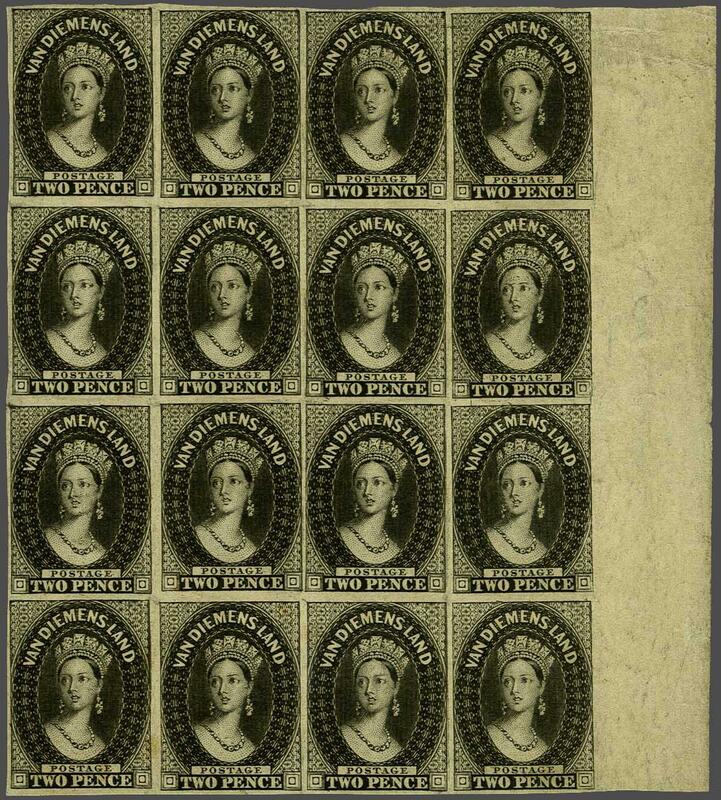 1876/1904: Plate Proof for the 2 d. value, an imperforate block of 42 (6 x 7), printed in black on thick card paper, from the top right corner of the sheet with Plate Number "2" in margin. 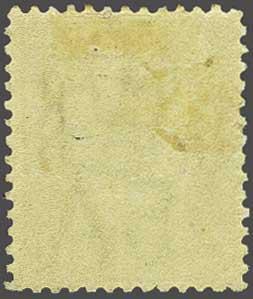 Fresh and very fine, a superb large multiple and very rare thus.rnrnNote: The new plate was invoiced on February 26, 1880. 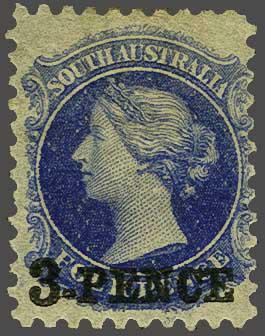 1882: De La Rue Die Proof for ½ d. value in black on glazed white card, showing the 'Double Die' method, handstamped '13 JAN 82' at top in blue. 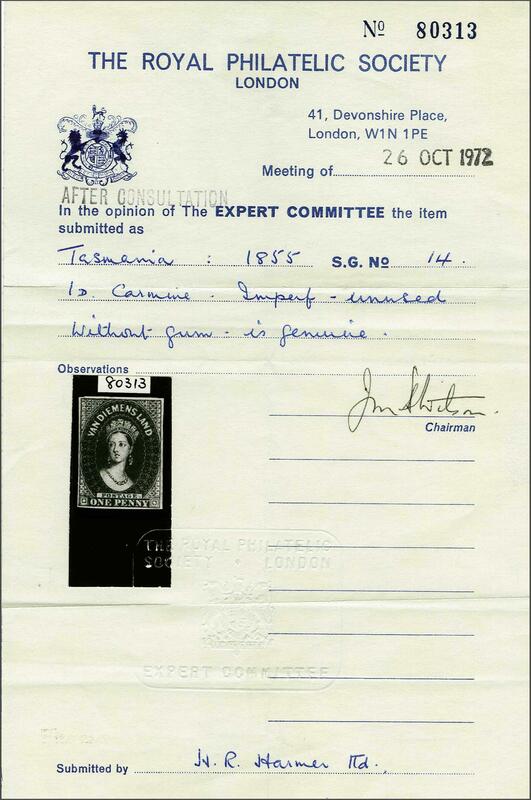 A fine and scarce Proof. 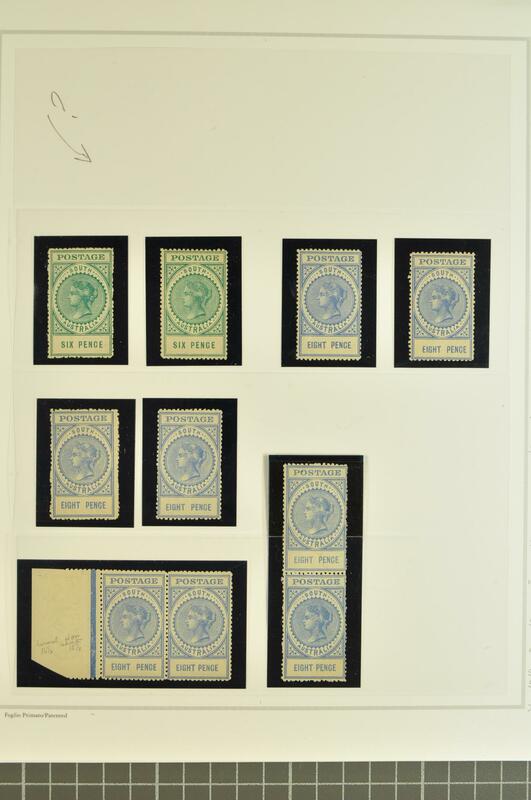 1882: De La Rue Die Proof for ½ d. value in black on glazed white card, showing the 'Double Die' method, handstamped '1 FEB 82' at top in blue with AFTER HARDENING in black. 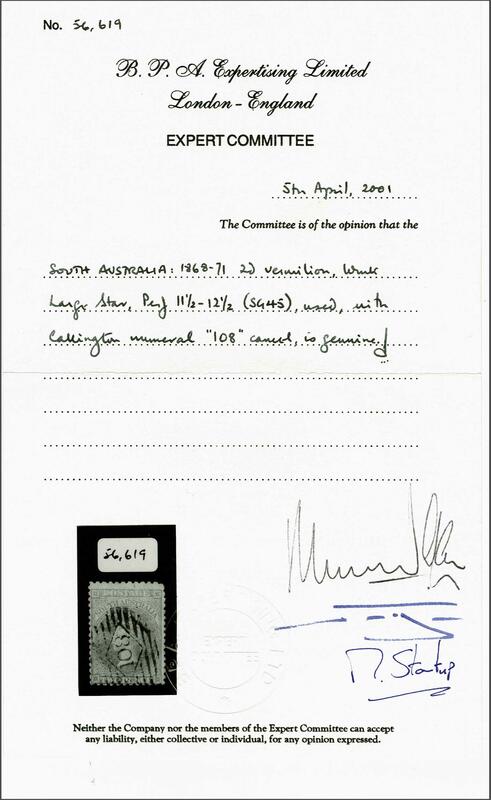 A fine and scarce Proof. 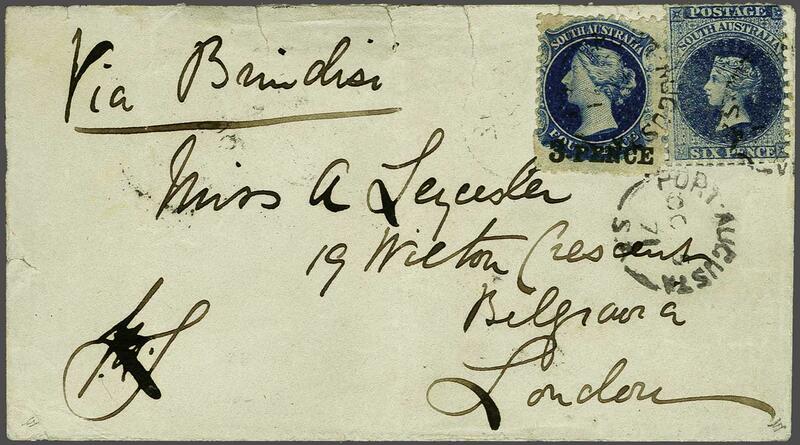 1891 (Sept 25): Bantam ½ d. red-brown, wmk. 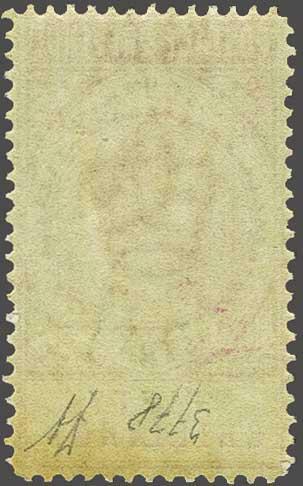 Crown over SA, a complete unused pane of 120 stamps (20 x 6), complete margins on three sides and most of margin at base, showing the compound perf. 10 x 11½ affecting the alternate vertical rows, a few wrinkles as to be expected on a multiple this size, fresh and very fine, large part or unmounted og. Rare and splendid piece Gi = £ 3'500+. 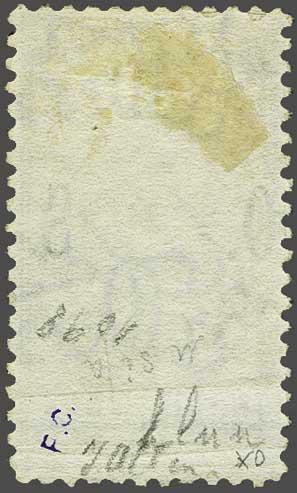 1893 (Jan): Bantam ½ d. chocolate, wmk. Crown SA, perf. 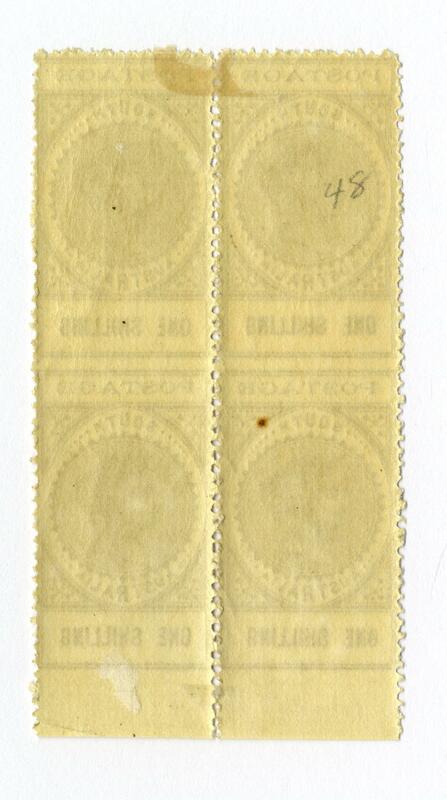 15, a fine unused pair, variety "Perforated 12½ Between', fresh and fine, large part og.Gi = £ 325. 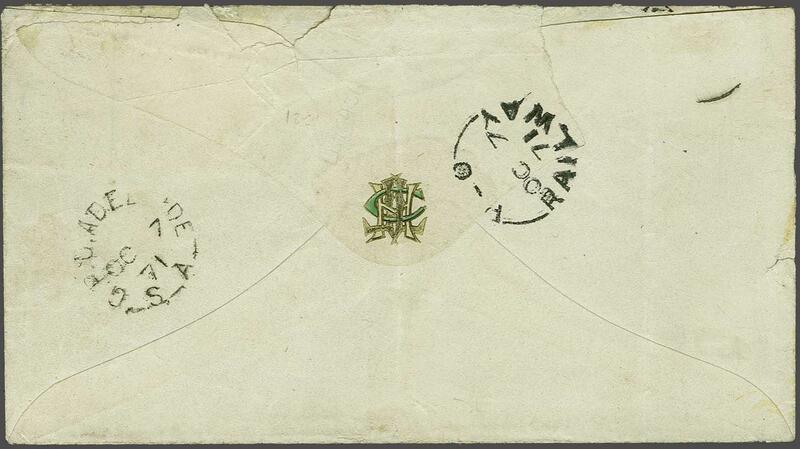 1883: Essay for proposed ½ d. value, eventually adopted and used for the Postal Stationery wrapper (see 'De La Rue Collection' edited by Frank Walton RDP, plate 7021) hand-painted in stamp size on tissue paper, 154 x 125 mm., the design for the head-plate in flesh with background of vignette in deep brown, the surround picked out in Chinese white on black; with handstamp date "13 APR 83" above. A stunning, unique and absolutely beautiful Essay.rnProvenance: Collection Henry Frenkle, RL, London, 26 Sept 1979, lot 1306. 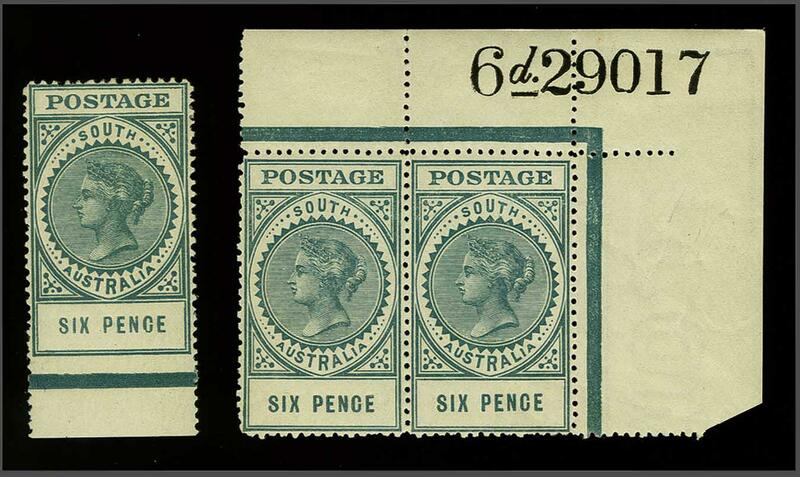 The 'Long' Stamps 1886/96: £ 3 sage-green, wmk. Crown over SA upright, perf. 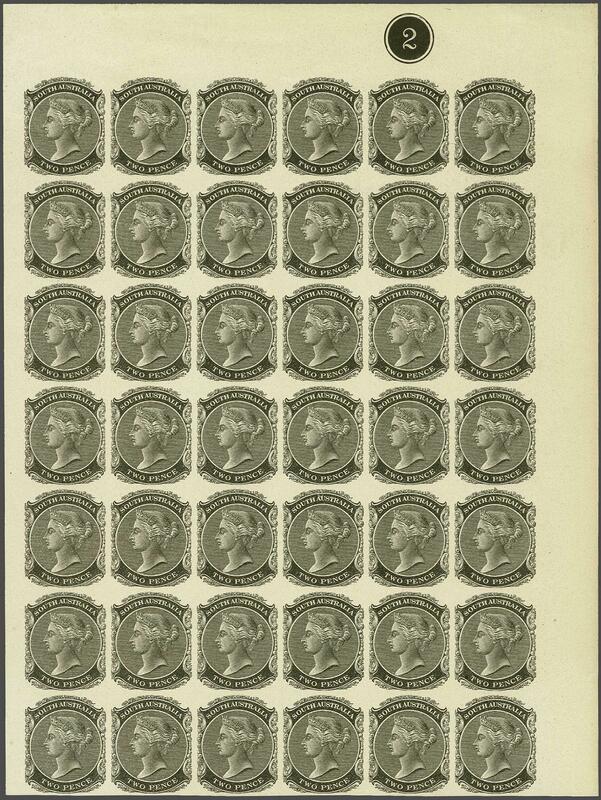 11½-12 small holes, a fine unused example, of brilliant freshness, usual somewhat blunted perforations, superb og. 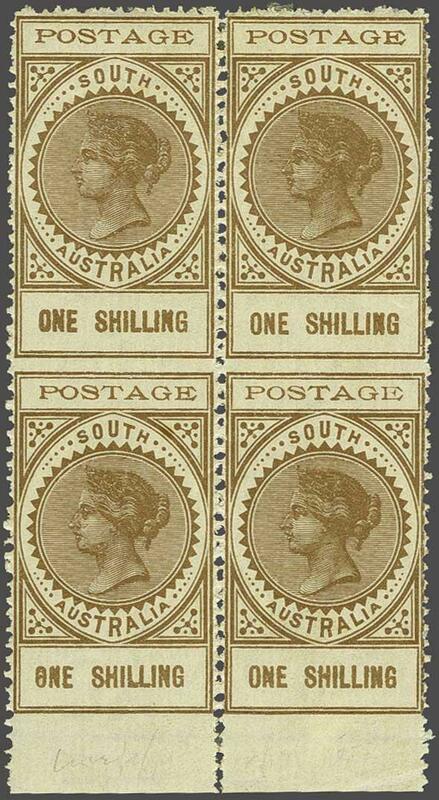 A lovely stamp of great scarcity. Cert. Ceremuga (2018) Gi = £ 5'250.rnrnProvenance: Collection William Frazer, Spink, London, 18 Sept 2003, lot 362. 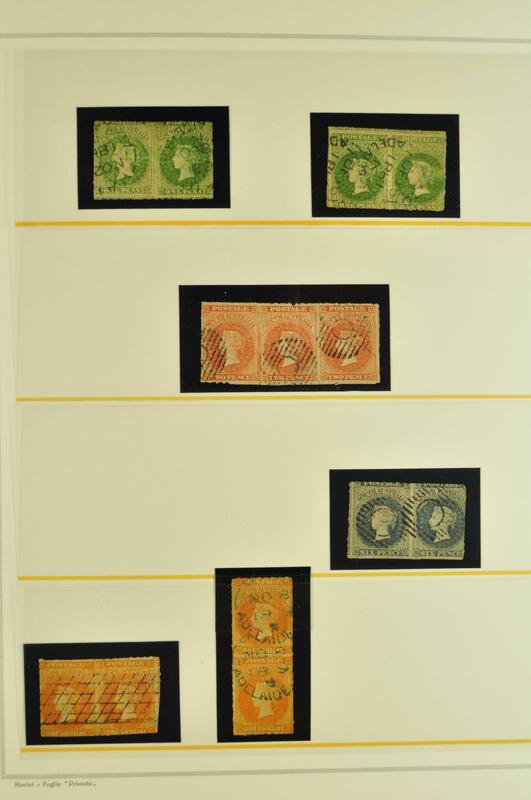 The 'Long' Stamps 1886/96: £ 15 silver, wmk. Crown over SA upright, perf. 11½-12, a fine c.t.o. 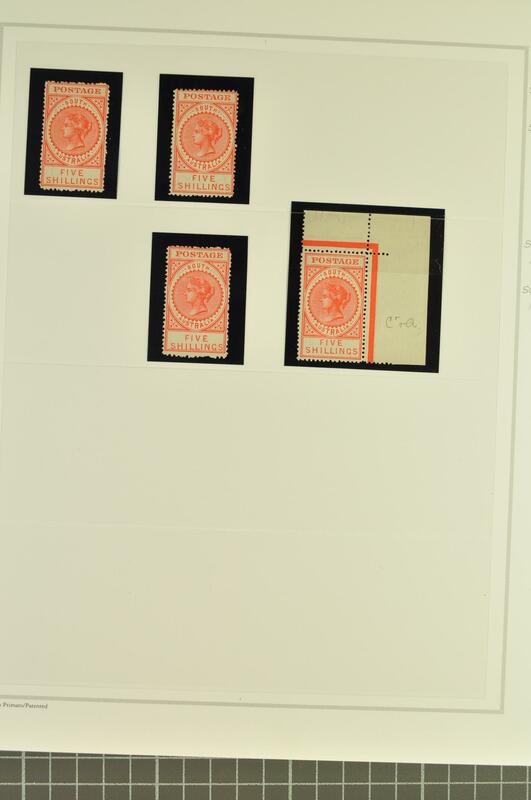 used block of four, marginal from base of sheet, of brilliant freshness, well centred and superb unmounted og. 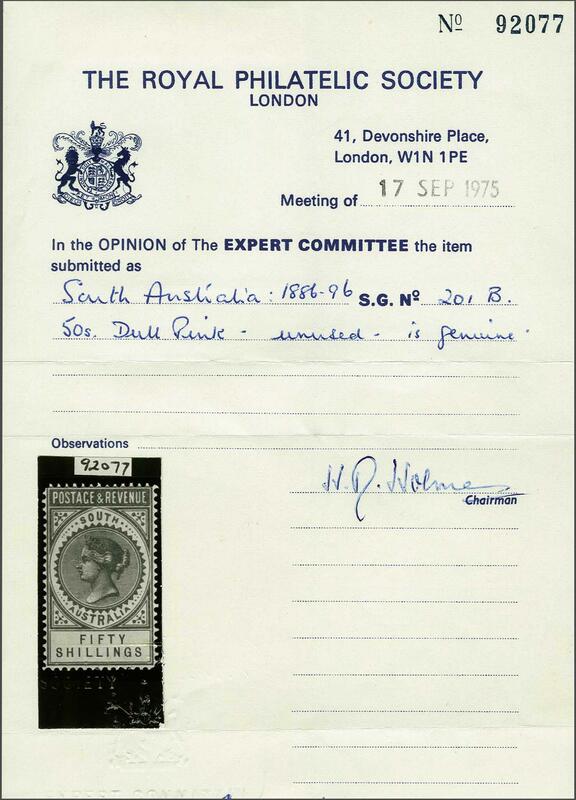 Extremely scarce, a lovely block.rnrnProvenance: Australia Post Philatelic Archive, 1979.rn Spink, London, 18 Sept 2003, lot 351. 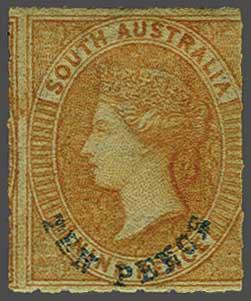 1892 (July 12): De La Rue Essay for the proposed 5 d. design as accepted, hand-painted on tracing paper, 56 x 84 mm., with the Shield & Arms in black ink and in pencil, Queen's head in ink and the tablets SOUTH AUSTRALIA and FIVE PENCE picked out in Chinese white with perforations drawn in pencil, dated at top "July 12, 92". 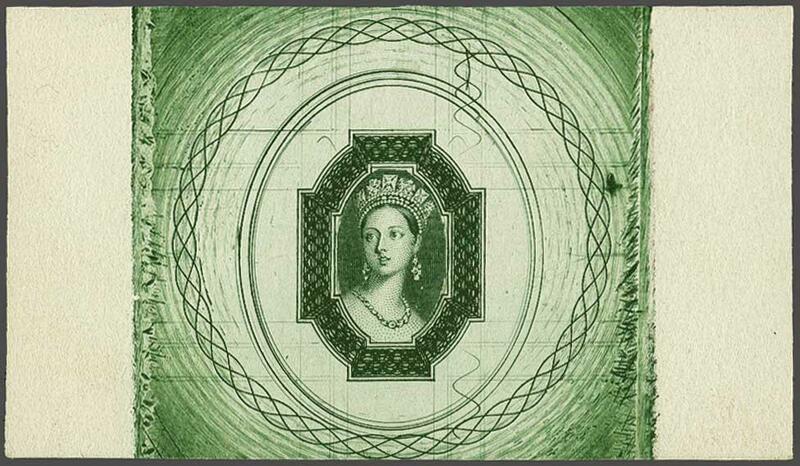 See 'De La Rue Collection' edited by Frank Walton RDP plate 7011. Exquisite and wonderful Essay. 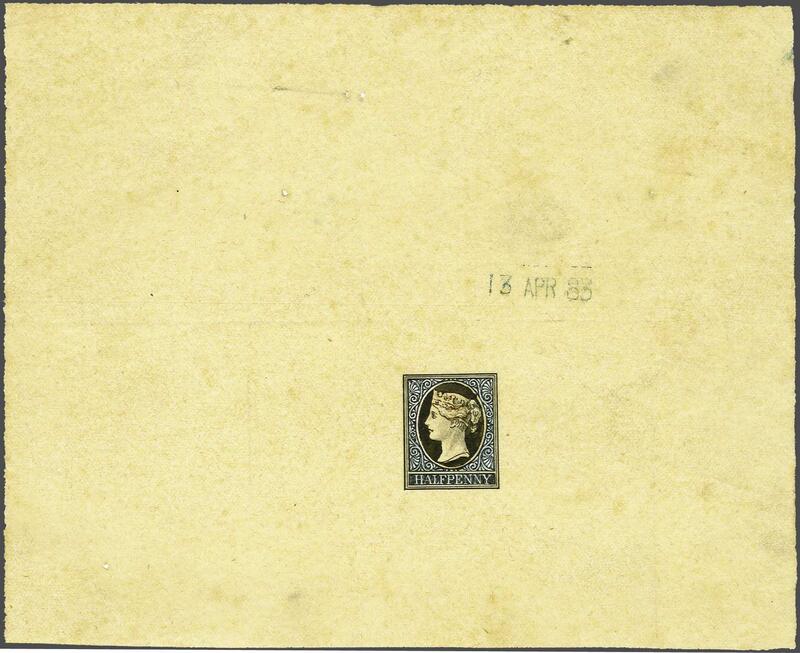 The 'Long' Stamps / Thin Postage 1902/04: 8 d. ultramarine, wmk. Crown over SA, perf. 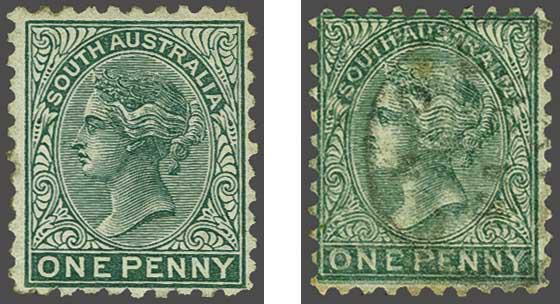 11½-12½, a horizontal pair on small piece used in conjunction with 3 d. olive-green, the 8 d. pair with left hand stamp showing variety "EIGNT" for EIGHT, all tied by 'Adelaide' squared circle datestamps in black, leaving the variety clear. 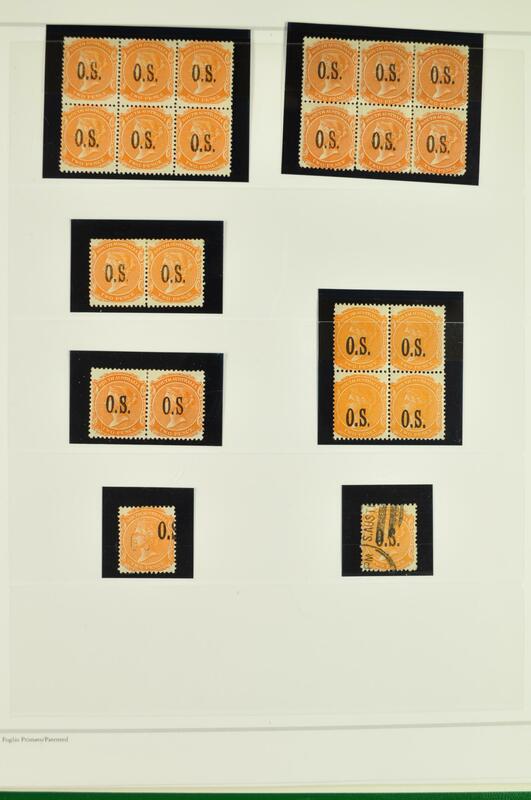 Minor imperfections of no significance, a rare and famous piece Gi = £ 3'000+.rnrnProvenance: Collection Julius Beresford, RL, London, 5 Feb 1958, lot 507.rn Collection Henry Frenkle, RL, London, 26 Sept 1979, lot 1284. 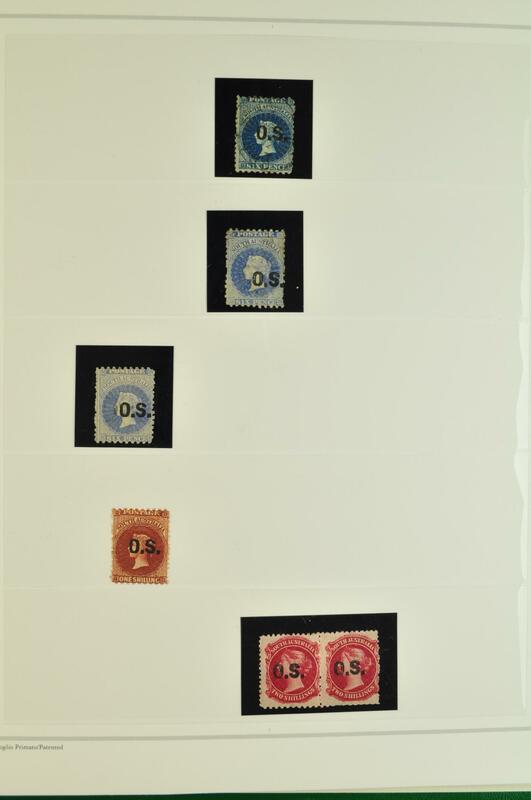 The 'Long' Stamps / Thin Postage 1902/04: 1 s. brown, wmk. Crown over SA upright, perf. 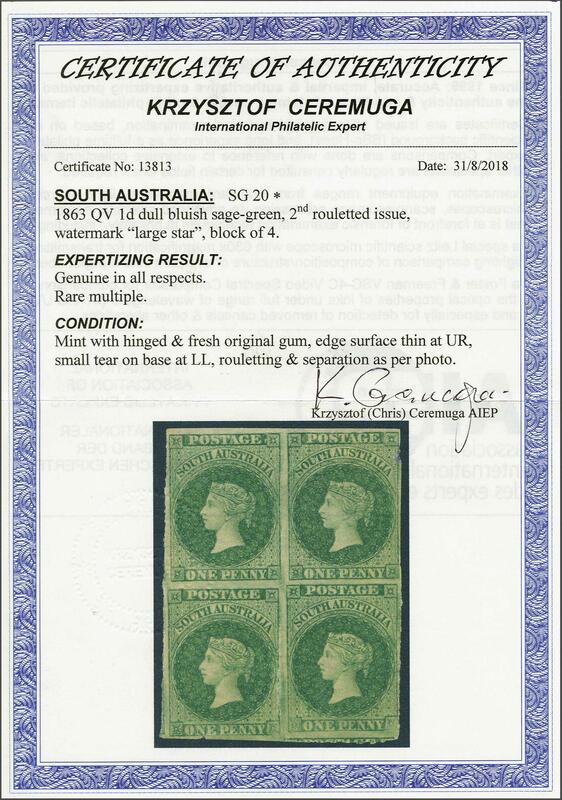 11½-12½, a superb unused block of four of good colour and centering, variety "Imperforate Between Horizontally", marginal from base of sheet and imperforate between stamp and margin, one tone spot on gum otherwise exceptionally fine, large part og. 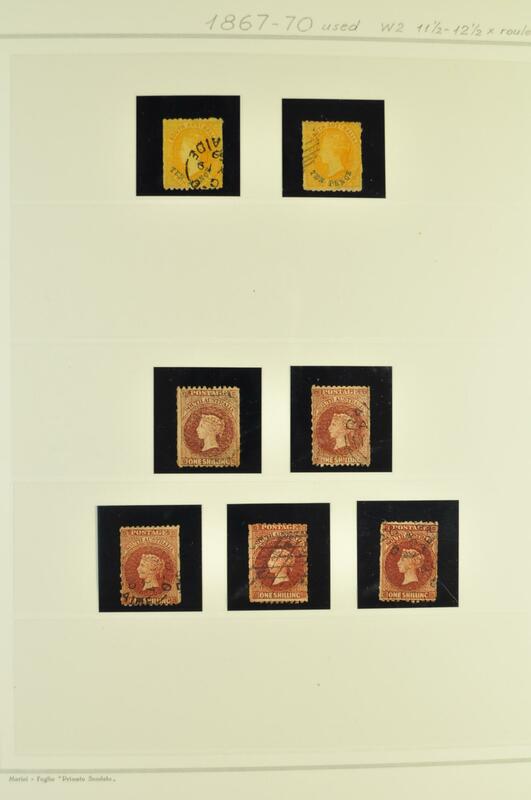 Extremely rare Gi = £ 5'000+. 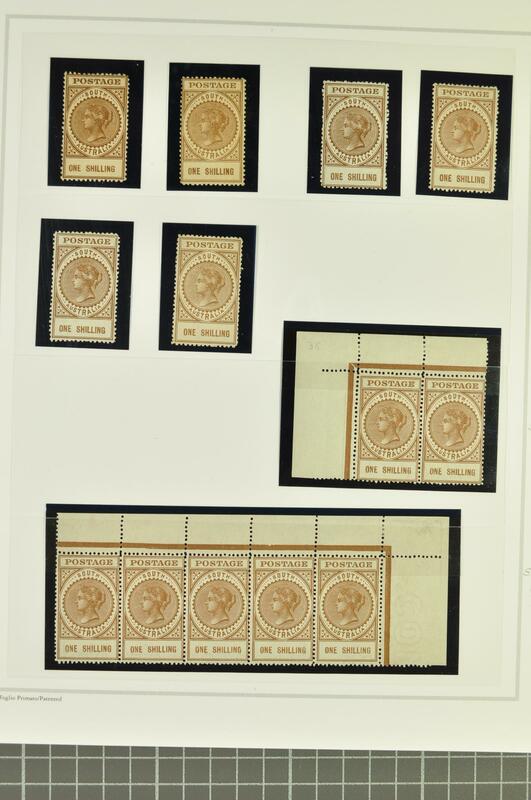 The 'Long' Stamps / Thin Postage 1902/04: The set of eleven values , wmk. Crown over SA upright, perf. 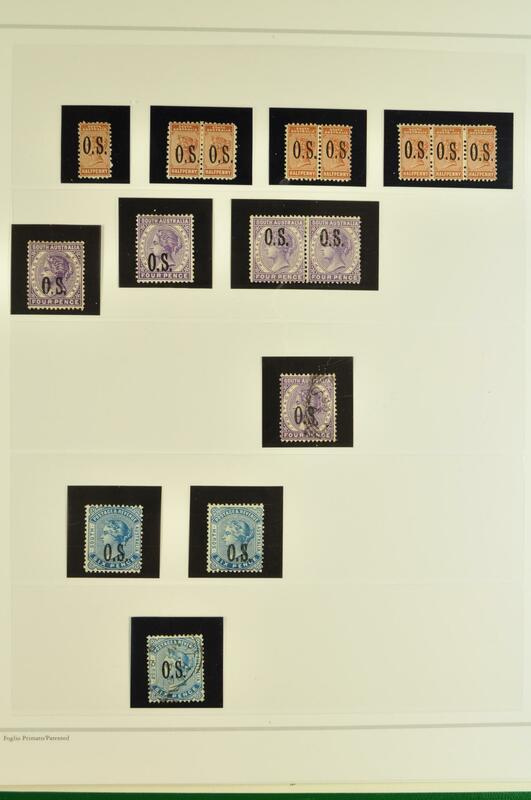 11½-12½, all on three pieces and pre-cancelled, (6 d. with surface scuff but the £ 1 blue showing damaged "N" in "ONE" flaw), all struck upon receipt from the UPU with "SPECIMEN." 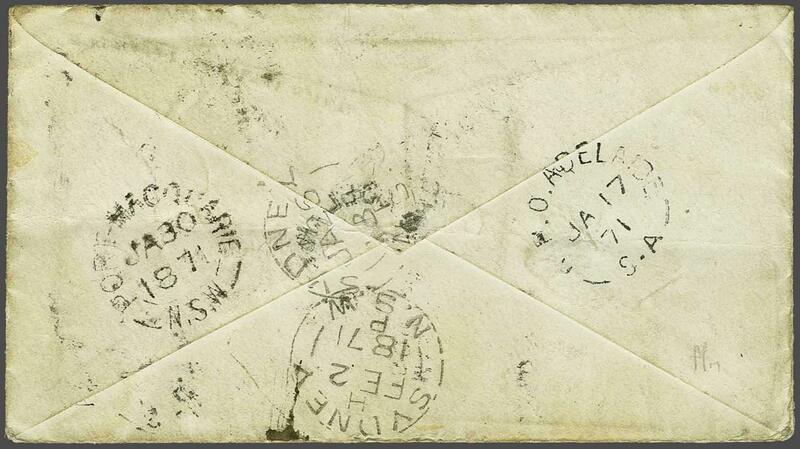 handstamps in violet (Samuel NA2) by the Natal Post Office. An attractive and unique set. Cert. BPA (1981). 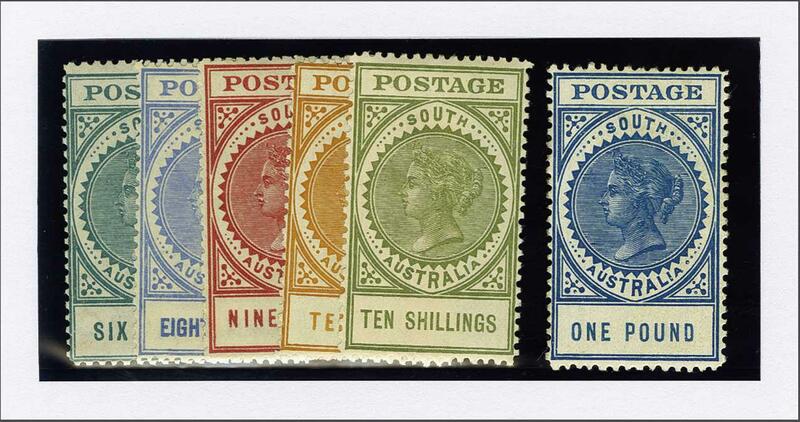 1904/11: Thick POSTAGE, the unused range with 6 d. blue-green, 8 d. ultramarine, 9 d. rose-lake, 10 d. dull yellow, 10 s. green and £ 1 blue, fresh and fine, large part og. Gi = £ 600+. 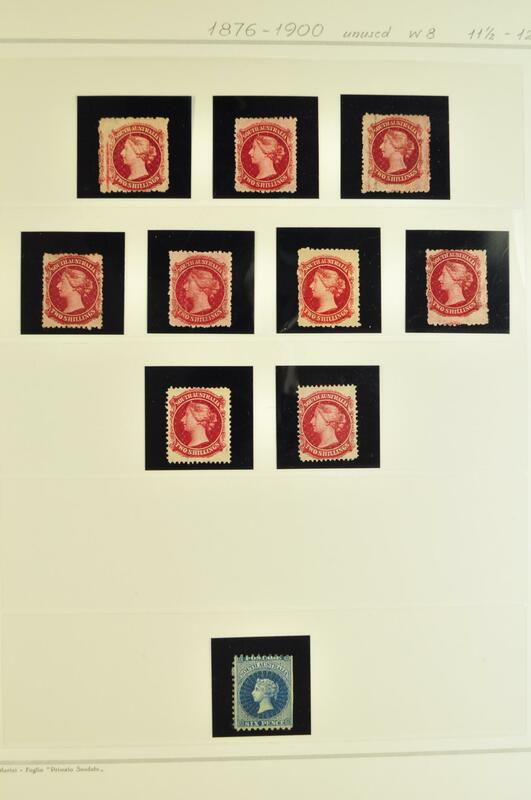 The 'Long' Stamps / Thick Postage 1904/11: The set of nine values to £ 1, wmk. Crown over SA upright, perf. 12, fresh and fine, large part og. A fine set Gi = £ 800+. 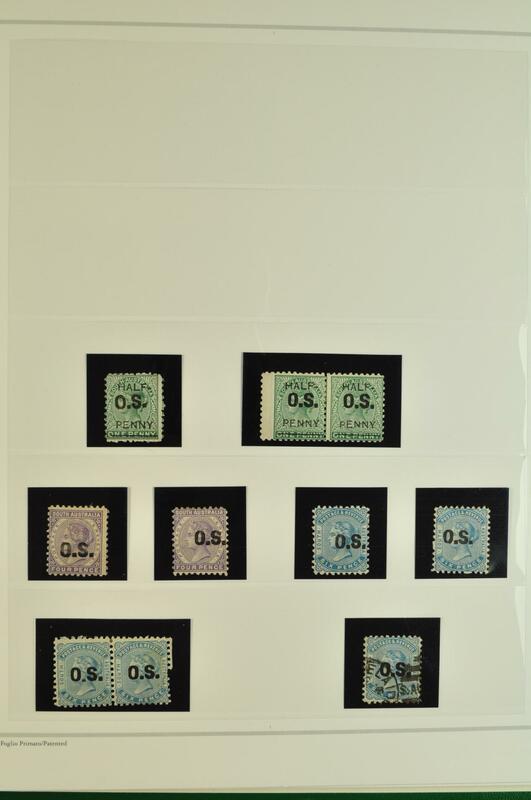 1906/12: 6 d. blue-green, perf. 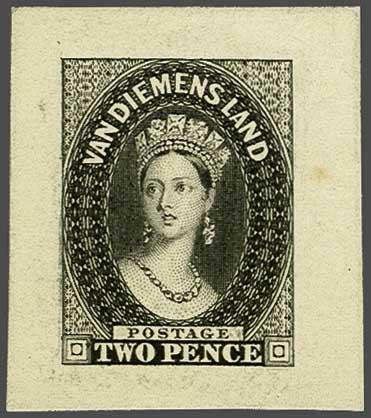 12, a fine unused example showing the rare variety "Imperforate between Stamp and Margin at base", fresh and very fine with large part og., matched with an attractive perf. 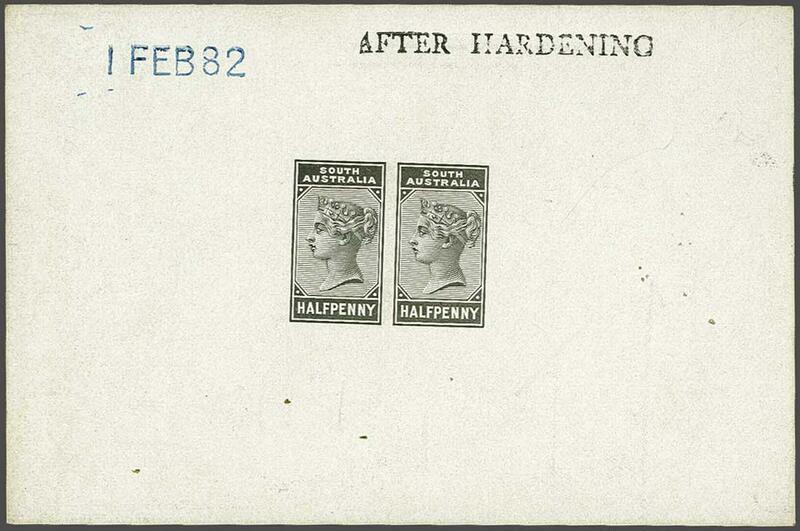 12½ corner marginal pair from top right of sheet with requisition number "6d. 29017" in black, fresh and fine, large part og. 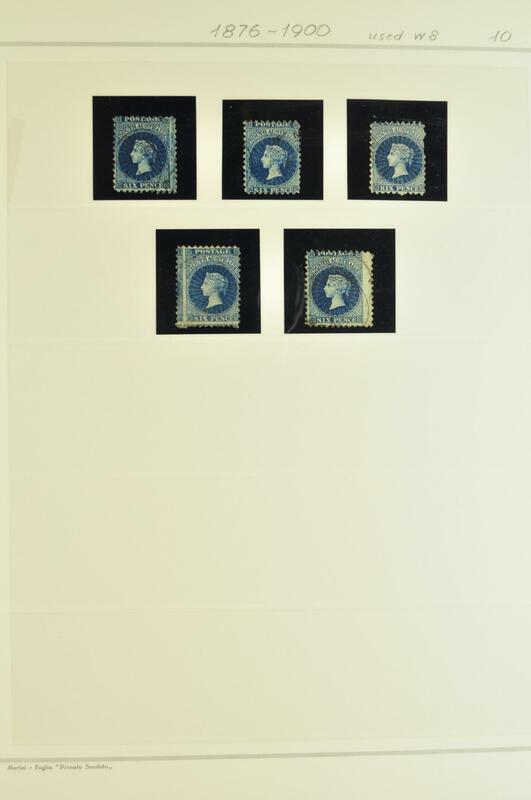 The 'Long' Stamps / Thick Postage 1906/12: 8 d. bright ultramarine, wmk. Crown over A upright, perf. 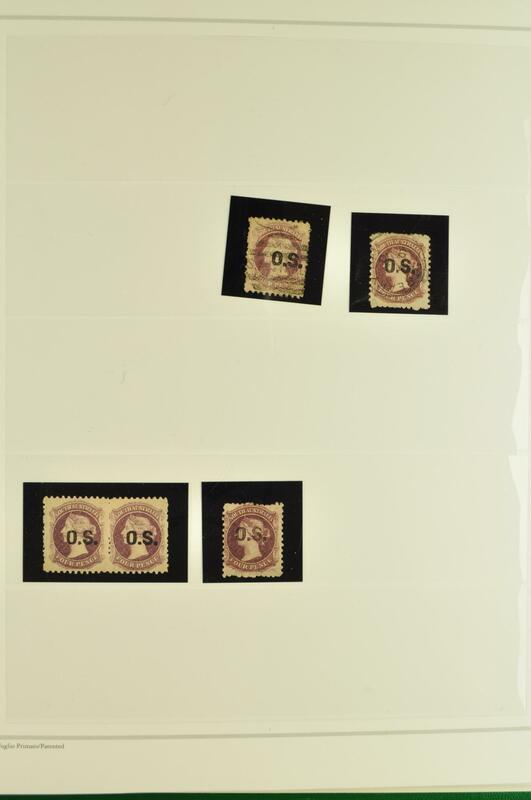 12½, an unused block of four from lower left, positions 42 and 52 each showing the variety "Value Closer Together", fresh and fine, unmounted og. Slight stain in margin only, a most attractive positional multiple Gi = £ 100+. 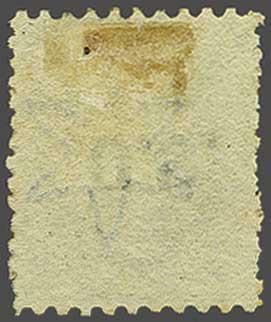 The 'Long' Stamps / Thick Postage 1906/12: 9 d. deep lake on thin paper, wmk. Crown over A upright, perf. 12½, Type C with 2½ mm. spacing, a magnificent unused block of sixteen (8 x 2) corner marginal from left of the sheet, of brilliant fresh colour and full unmounted og. Gi = £ 600+. 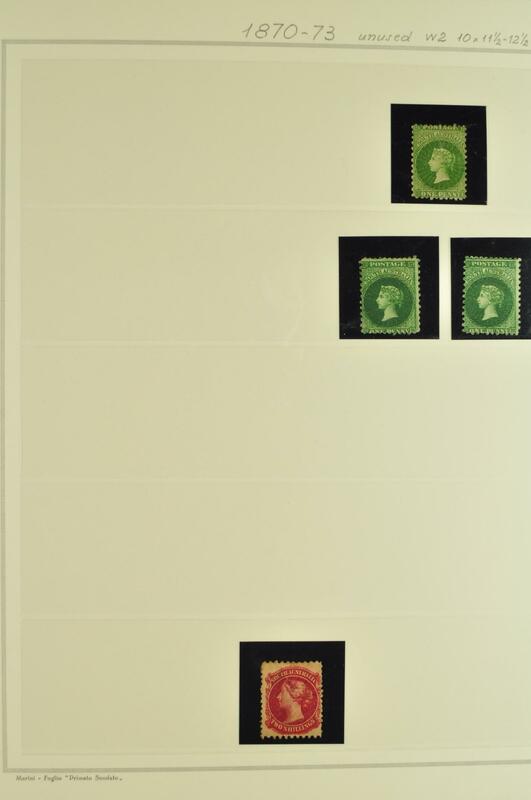 The 'Long' Stamps / Thick Postage 1906/12: 9 d. brown-lake, wmk. Crown over A upright, perf. 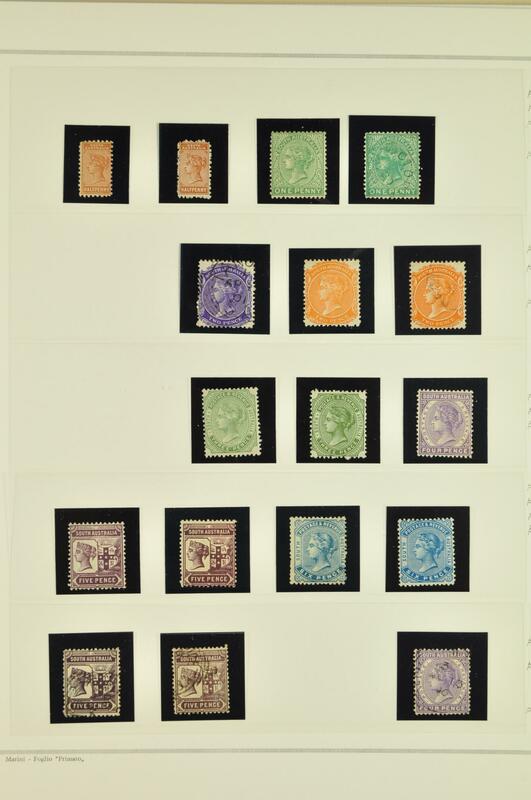 12, a superb unused block of eight of good colour and centering, variety "Imperforate Between Horizontally", exceedingly fine and very fresh multiple, superb og. 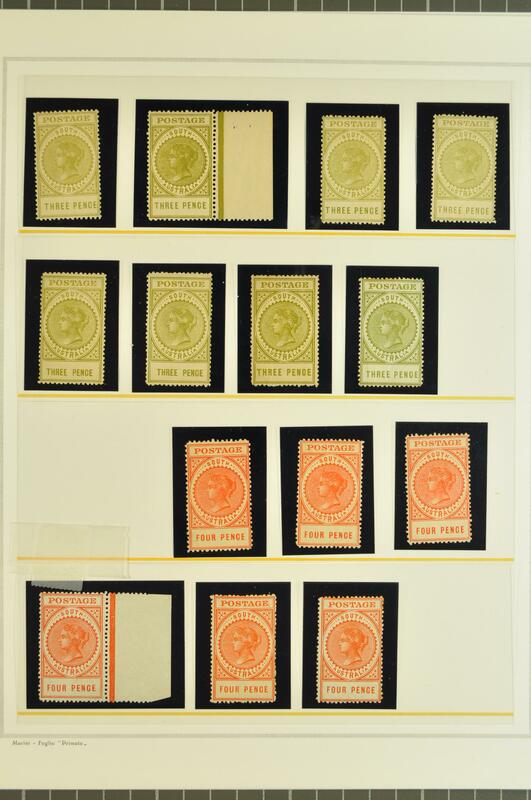 with all lower stamps unmounted og. 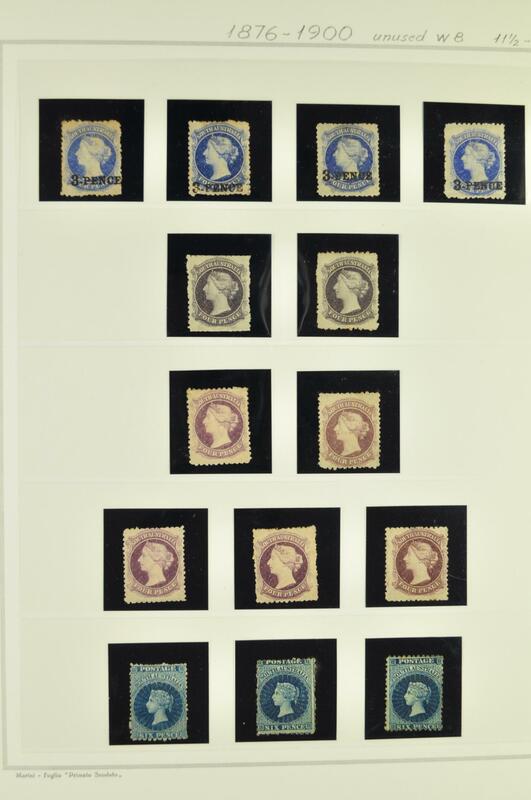 A very rare and most attractive multiple (probably the largest known) in the foremost quality Gi = £ 8'000+. 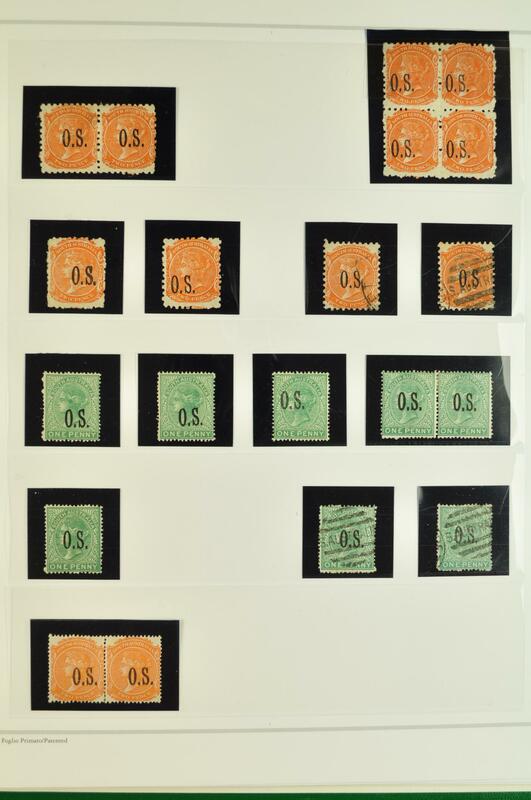 1906/12: Thick POSTAGE, second wmk., the unused set of eight values with duplication and perforation varieties, with 3 d. sage-green (8), 4 d. orange (6), 6 d. blue-green (2), 8 d. ultramarine (8, including two pairs), 9 d. lake (7), 1 s. brown (15, including a corner marginal strip of five), 2 s. 6 d. bright violet (10) and 5 s. bright rose (4), largely fresh and fine, large part or unmounted og. Gi = £ 1'500+. 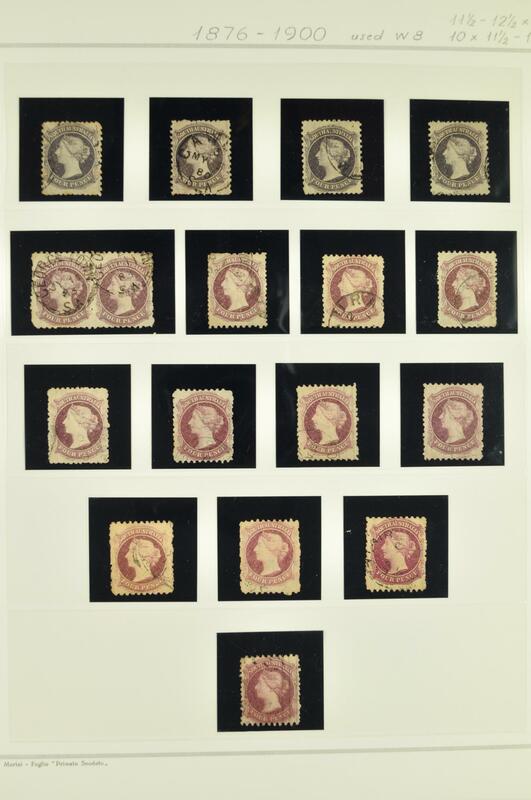 General Officials 1876/85: 4 d. deep mauve, wmk. Large Star, perf. 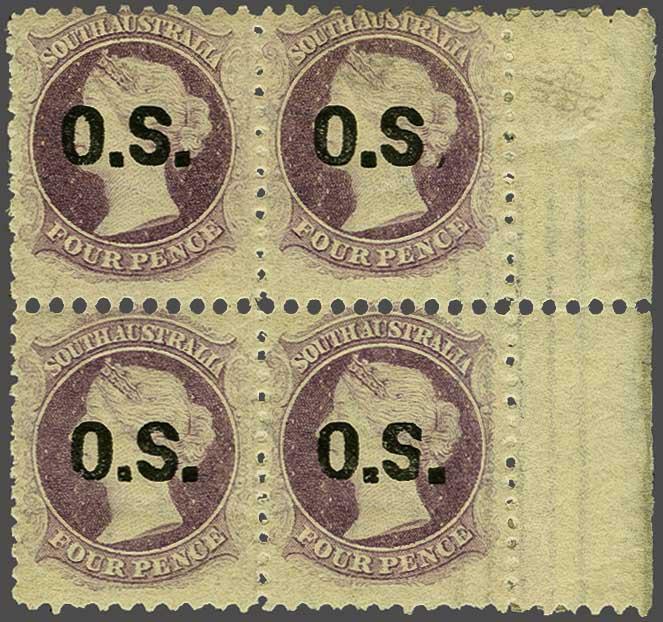 10, overprinted O. S. in black, a fine unused block of four, marginal from right of sheet, second stamp showing "Comma for Stop" with stop mostly missing, of good colour and large part og. Scarce Gi = £ 280+. 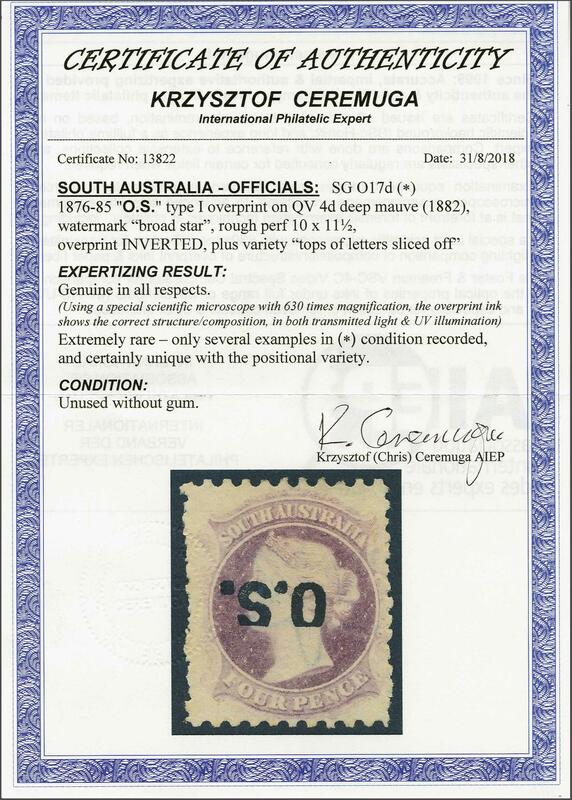 1876/85: 4 d. deep mauve, optd. 'O.S.' in black, perf. 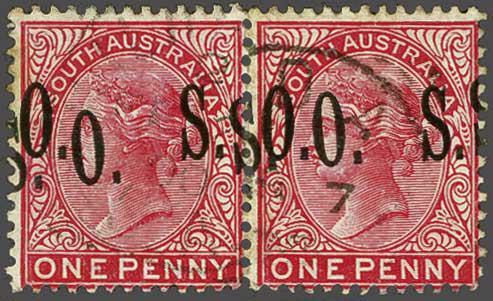 10 x 11½, a magnificent unused horizontal pair of rich colour, right hand stamp with variety: "No Stop after S", fresh and fine, unmounted og. Scarce and attractive multiple. Cert. Ceremuga (2018) Gi = £ 295+. 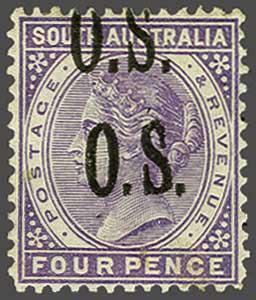 1876/85: 4 d. deep mauve, optd. 'O.S.' in black, perf. 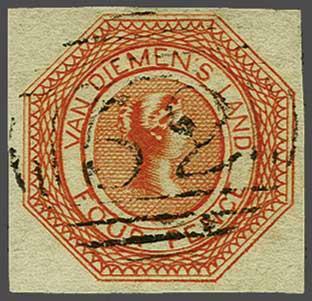 10 x 11½, a fine unused example with variety "Overprint Inverted" and positional variety "Tops of Letters Sliced Off", of good colour, blunted perfs. 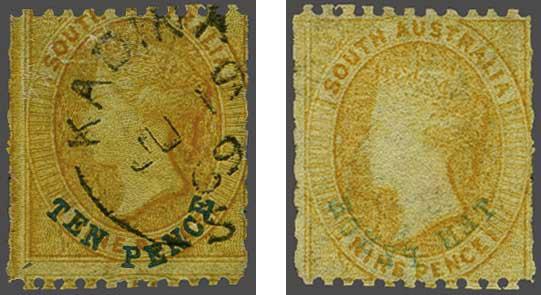 at left and without gum but extremely scarce and possibly unique. Cert. Ceremuga (2018) Gi = unpriced unused, £ 275 for 'normal' used. 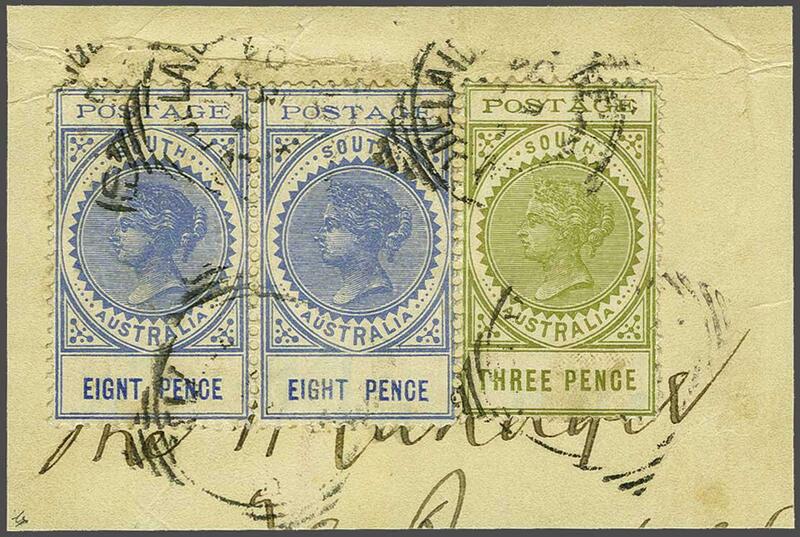 1876/85: 6 d. bright blue, optd. 'O.S.' in black, wmk. Broad Star, perf. 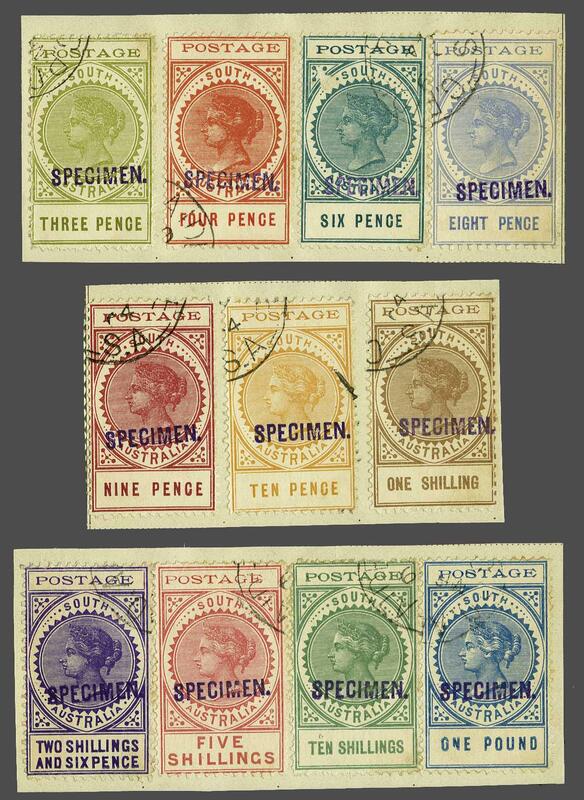 11½ x 10, a fine unused example of deep colour, vareity "OS Overprint Inverted", a few nibbed perfs, fresh and fine, unused without gum. Rare. Cert. 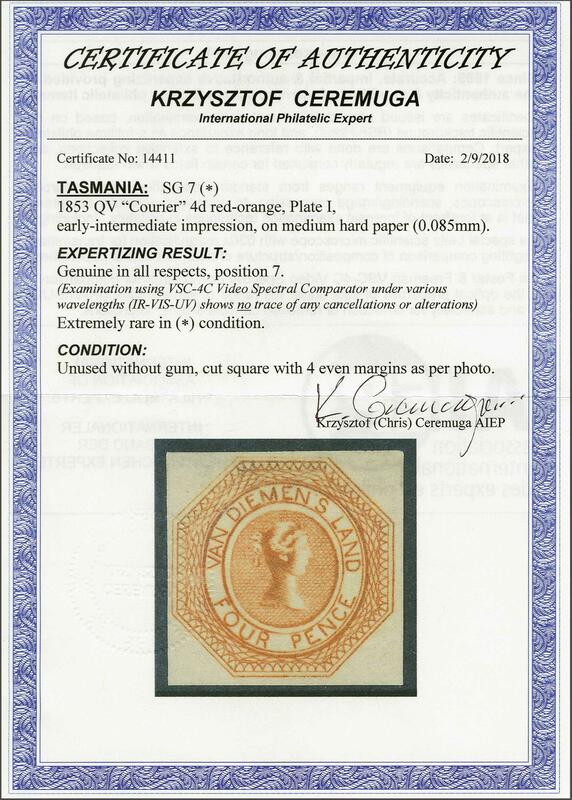 Ceremuga (2018) Gi = listed but unpriced.rnrnNote: Ceremuga: "Extremely rare - the first example in unused condition known to me". 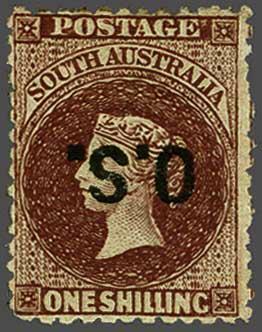 1876/85: 1 s. red-brown, optd. 'O.S.' in black, wmk. Broad Star, perf. 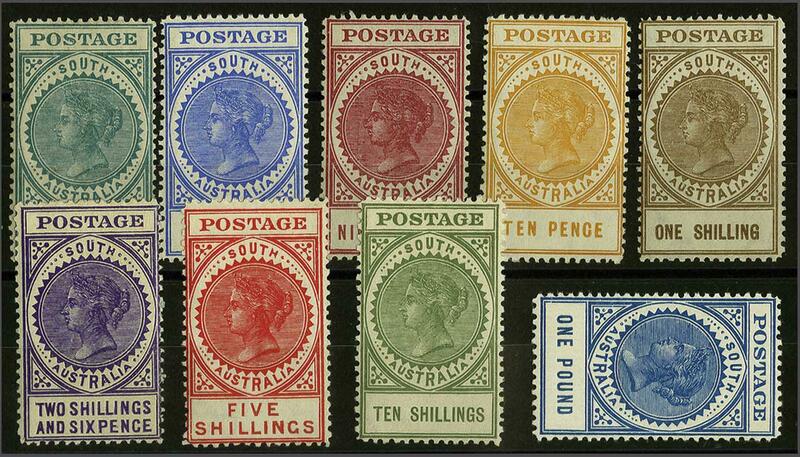 11½ x 12½, a fine unused example of good colour, variety "Overprint Inverted", large part og. A very rare stamp. Cert. Ceremuga (2018) Gi = £ 700. 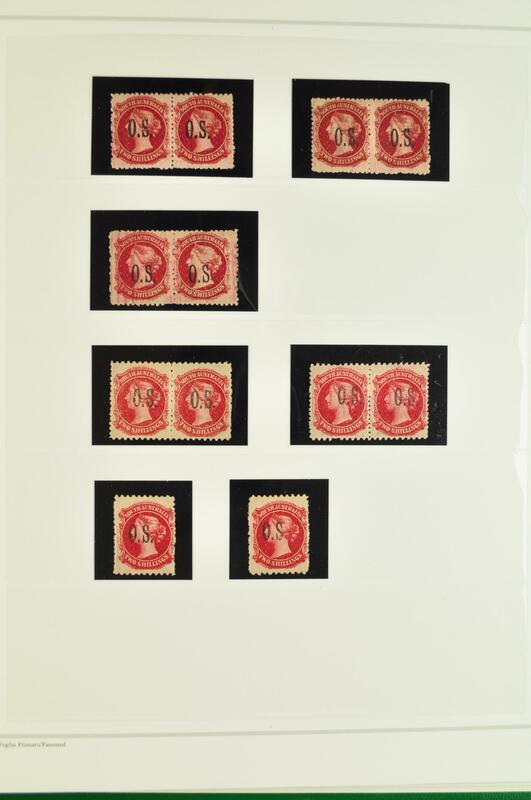 General Officials 1876/80: 4 d. brick-red, wmk. Crown over SA, perf. 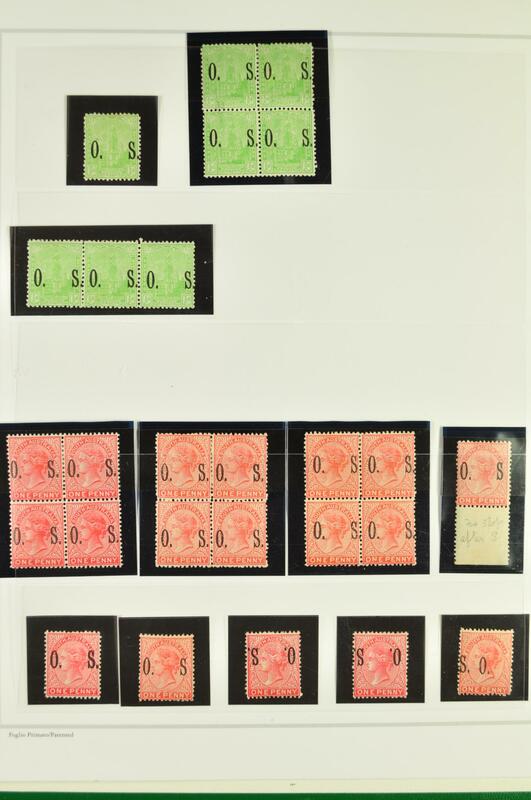 10, overprinted O. S. in black, an unused block of eight with margin at base, two affected by vertical crease but of good colour and superb large part og. A scarce multiple Gi = £ 600+. 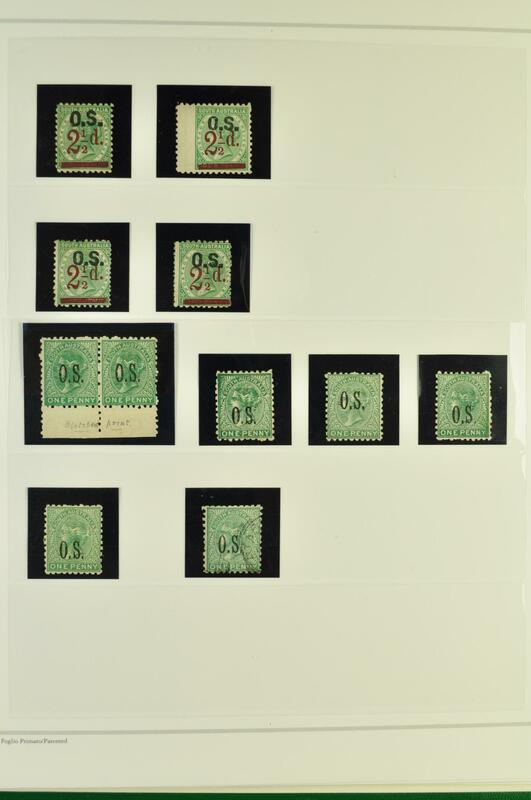 General Officials 1891/96: 1 d. deep green, wmk. Crown over SA, perf. 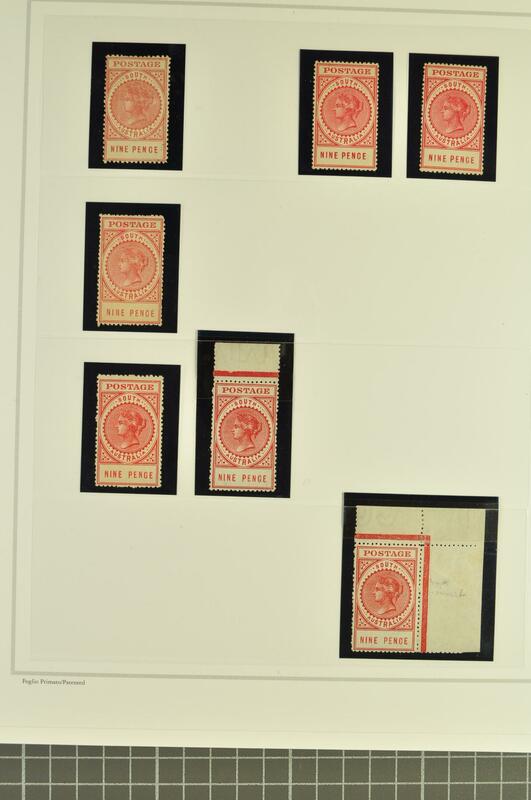 10, overprinted O. S. in black, a fine unused block of four, first stamp with variety "Missing Stop after S", fresh and fine, large part og. Gi = £ 320+. 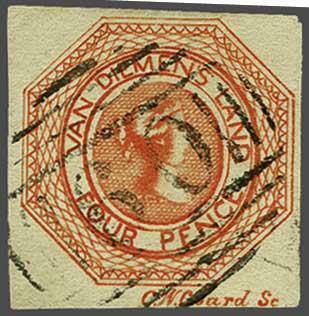 1891/96: 2 d. orange-red, wmk. Crown / wide SA, perf. 15, optd. 'O.S.' 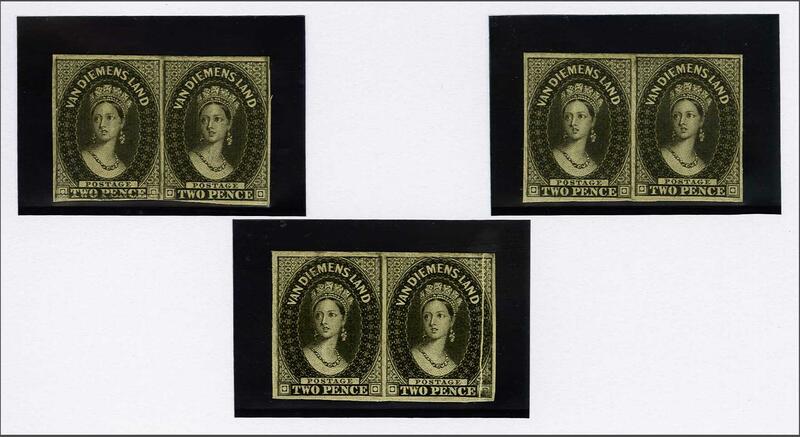 in black, a fine unused horizontal pair, variety "Overprint Double", second overprint diagonally struck, fresh and fine, large part og. Extremely rare on unused (unpriced thus in Gibbons). Cert. Ceremuga (2018) Gi = £ 180+ for used. 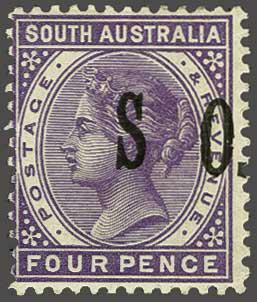 General Officials 1891/99: 4 d. pale violet, wmk. Crown over SA, perf. 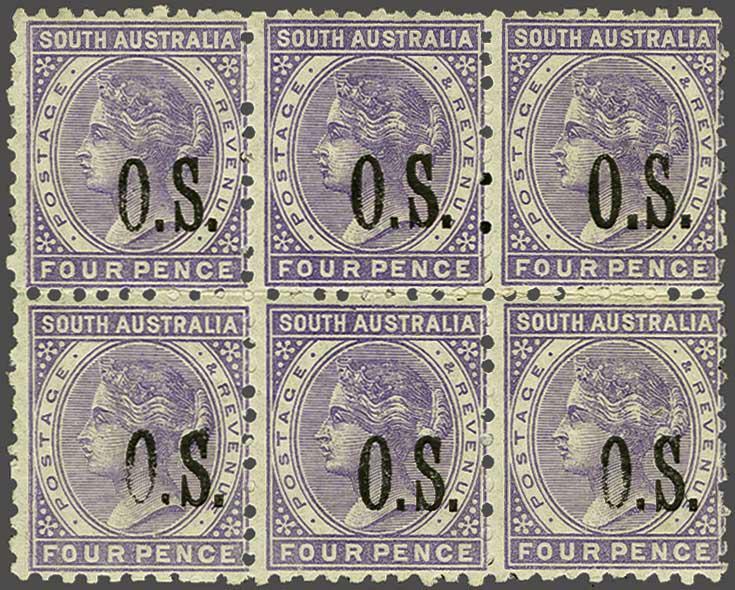 10, overprinted O. S. in black, a fine unused block of six, of good colour with large part og. A fresh and fine multiple Gi = £ 420+. 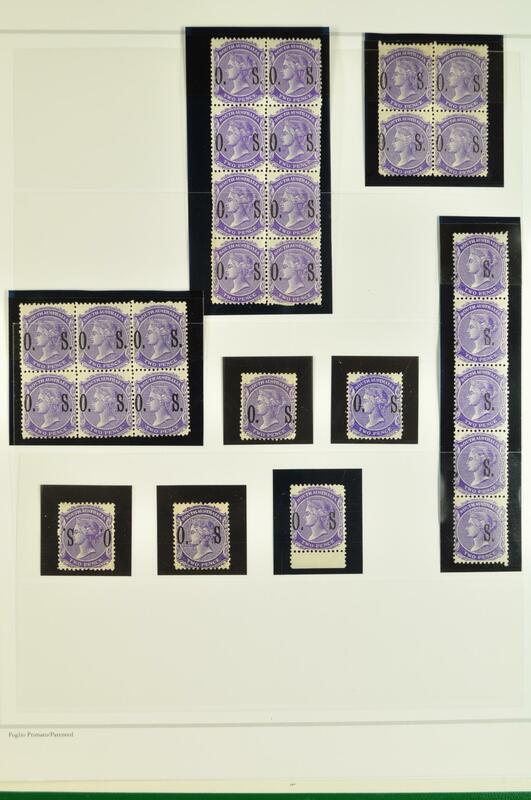 General Officials 1891/99: 4 d. slate-violet, wmk. Crown over SA, perf. 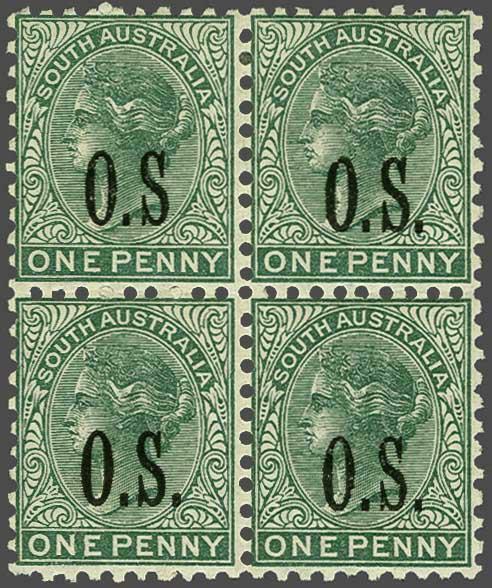 13, overprinted O. S. in black, a fine unused example with variety "O. S. Overprint Double", fresh and fine, large part og. Gi = £ 450. 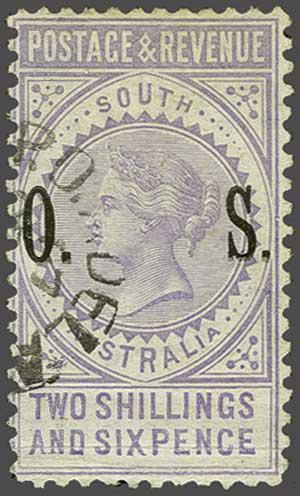 1891/99: 4 d. violet optd. 'OS' in black, perf. 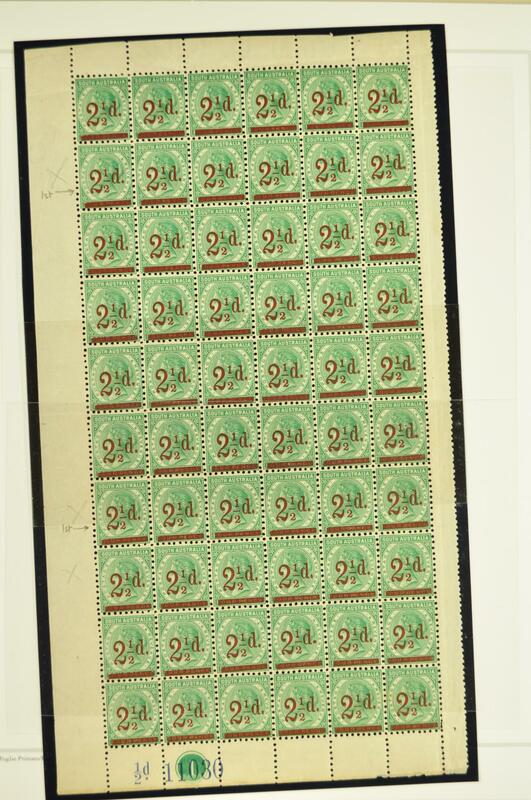 13, overprint shifted downwards, leaving one strike of the 'OS' on each vertical pair, upper pair with horizontal crease not affecting the appearance, fresh and fine, large part or unmmounted og. Cert. Ceremuga (2018) Gi = £ 480+. 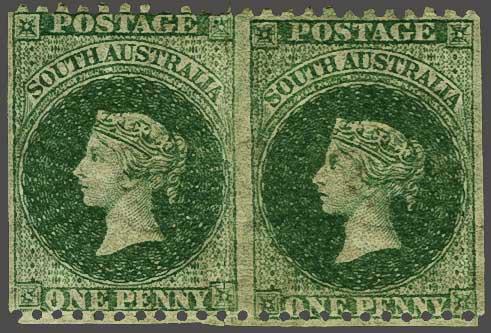 General Officials 1891/95: 2½ d. on 4 d. deep green, wmk. Crown over SA, perf. 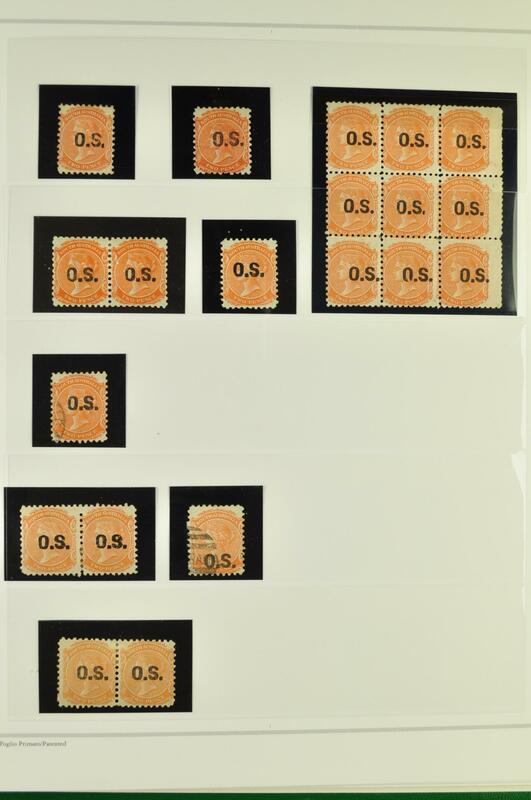 10, overprinted O. S. in black, a fine unused block of eight, upper left stamp with variety "2 and ½ Closer Together", fresh and fine, large part og., left hand block unmounted og. Gi = £ 470+. 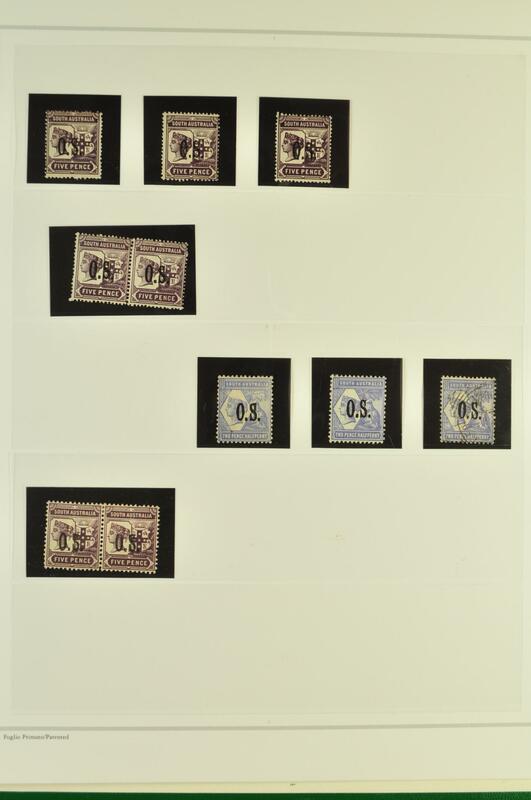 General Officials 1897/1901: 5 d. brown-purple, perf. 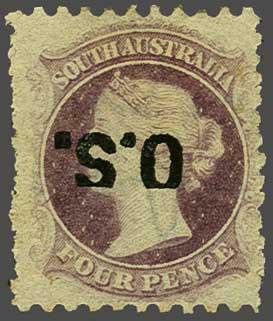 13, overprinted O. S. in black, a fine unused example of good colour, centred to right, variety "No Stop after S", large part og. 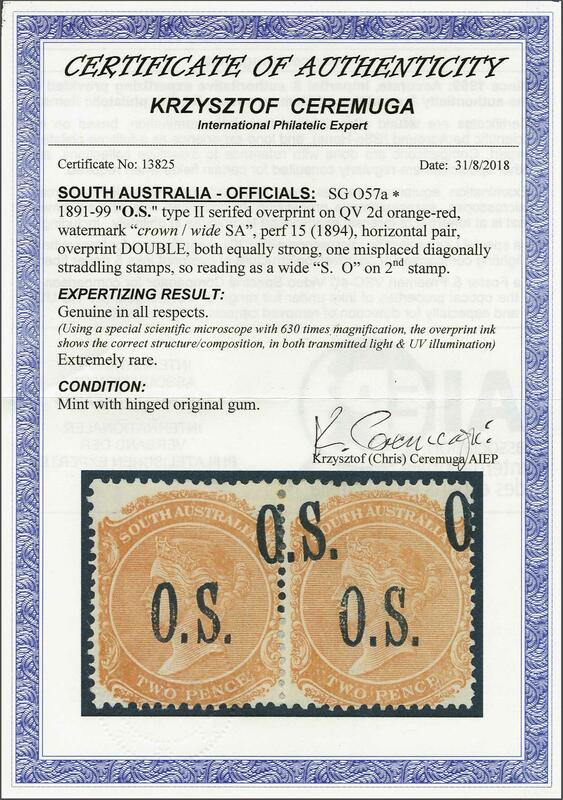 A very rare stamp Gi = Listed but unpriced. 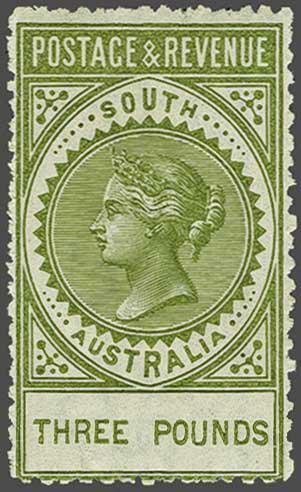 1899/1901: ½ d. yellow-green, optd. wide 'O.S.' 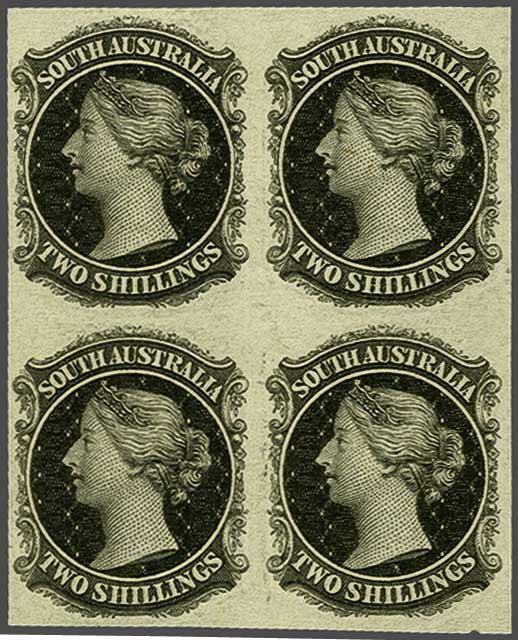 in black, a fine unused example with unlisted variety "Overprint Double" with second overprint shifted slightly upwards and with slightly less inking, fresh and very fine, large part og. Cert. Ceremuga (2018) Gi = unlisted.rnrnNote: Ceremuga: "Extremely rare - the first example known to me". 1899/1901: 1 d. rosine, optd. wide 'O.S.' 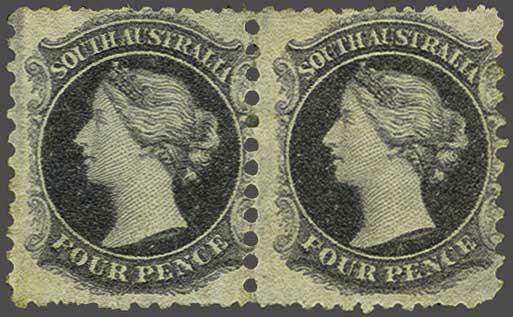 in black, two rejoined used examples, showing variety "Overprint Double", one normal, one diagonally misplaced, each stamp lightly cancelled in black (used seperately and rejoined). 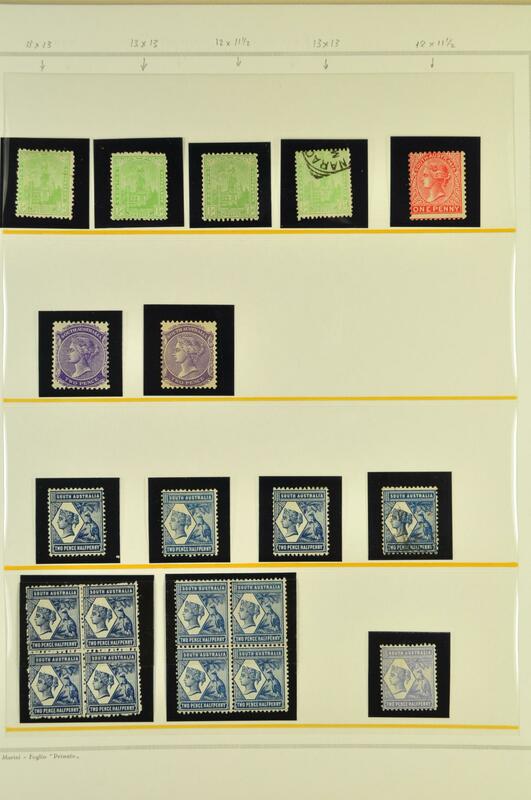 The stamps with minor aging on perfs. but remarkable and rare. Cert. Ceremuga (2018) Gi = £ 950+. 1899/1901: 4 d. violet, optd. wide 'O.S.' in black, variety "No Stop after S" and the entire overprint shifted and thus reading "S O. ", fresh colour and fine, large part og. An extremely rare variety. Cert. Ceremuga (2018) Gi = £ 250+.rnrnNote: Ceremuga: "Extremely rare combination - the only example known to me". 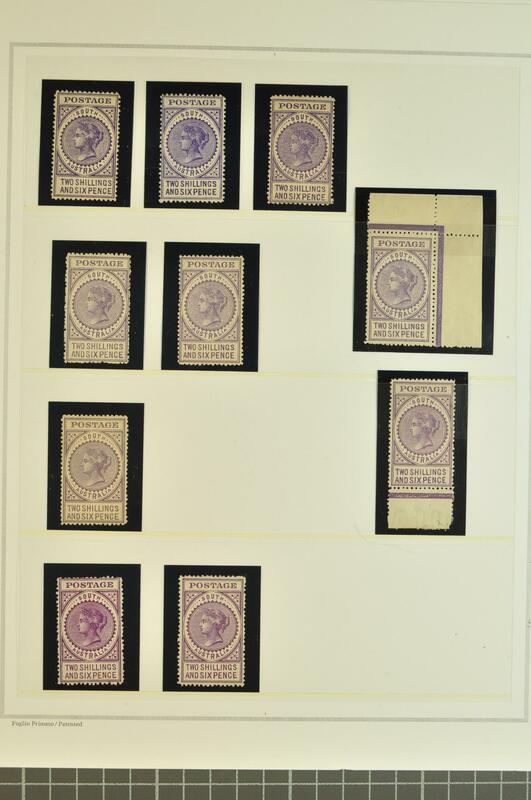 General Officials 'Long' Stamps 1891 (May): 2 s. 6 d. pale violet, wmk. Crown over SA sideways, perf. 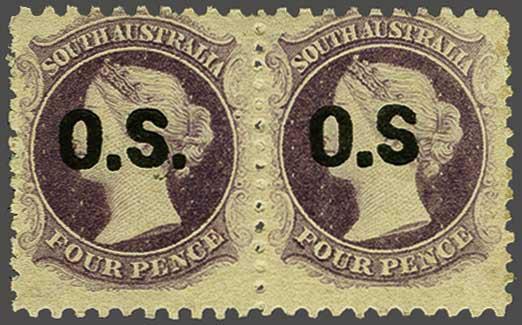 10, overprinted O. S. in black, a fine used example cancelled by part 'Adelaide GPO' cds in black (not c.t.o. 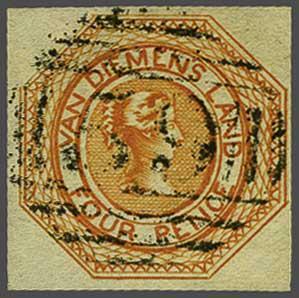 ), minor bend at base otherwise fresh and very fine, a very rare stamp with just 60 printed. Signed Tommy Allen. Cert. Ceremuga (2018) Gi = £ 5'500. 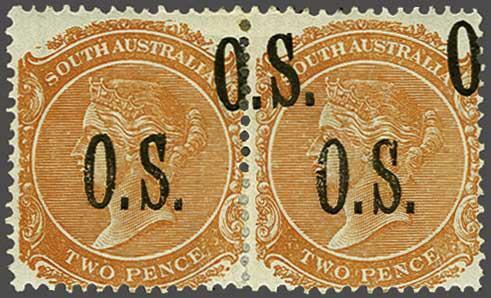 Official 1891 (Aug): 5 s. pale rose, overprinted "O.S." in block type in black (with large wide letters and round 'O'), made from the 'Postal Stationery' overprint typeface; wmk. Crown / narrow SA, perf. 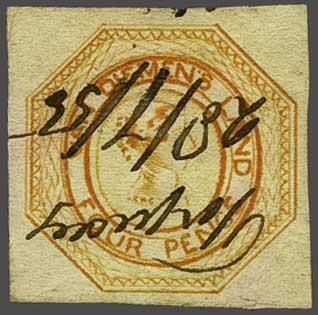 10, a used example cancelled by 'Parcel P.O. Adelaide' cds in black (1891, probably August). 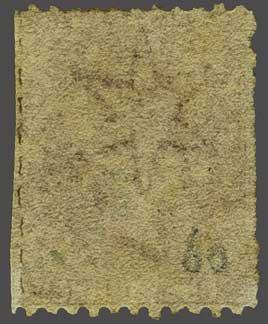 Minor wrinkles on partially remaining gum on reverse. 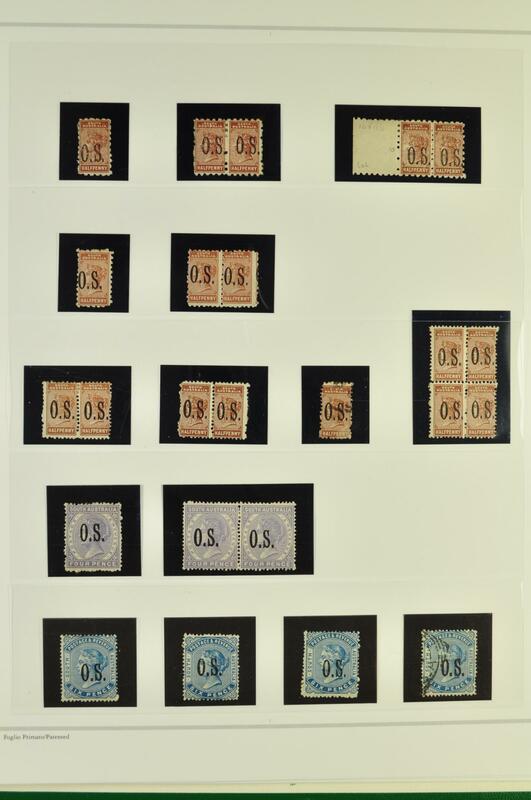 Just 20 examples are believed to have been overprinted: two were recorded in the Robson Lowe Encyclopædia (page 146), there are now just four examples known. An extraordinary rarity. Cert. 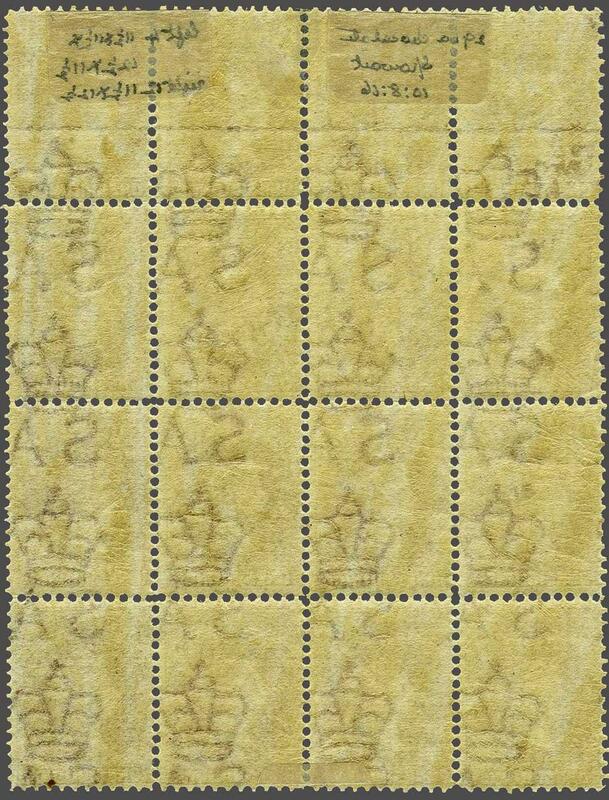 Ceremuga (2018).rnrnNote: Priced in RL Encyclopædia at £ 30 (RL 101), the same as for SG O87, currently catalogued at £ 6'000. 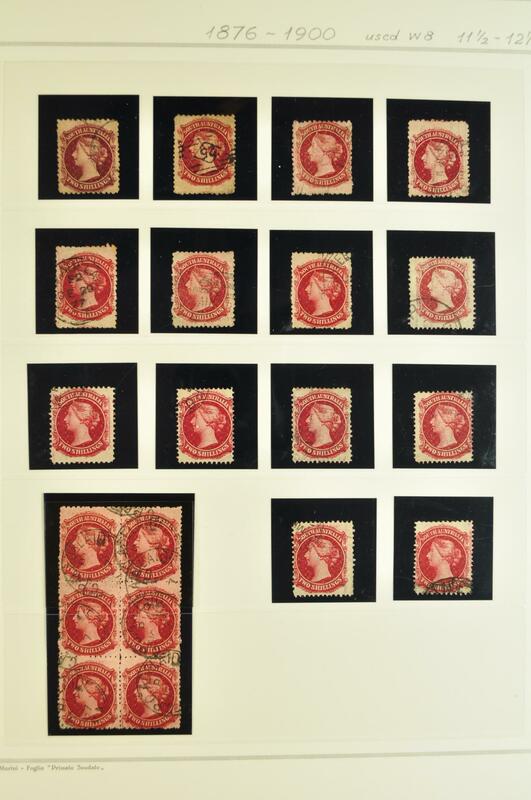 1874/1891: The collection, predominantly unused, with 1874/77 values including fine 2 s. crimson-carmine, 1876/85 values with perf. 10 2 s. carmine in a horizontal pair; perf. 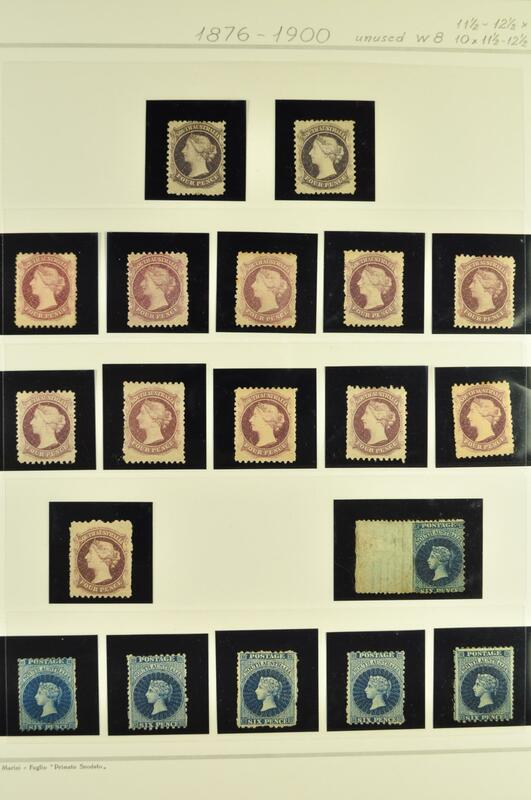 11½-12½ 4 d. violet-slate, 4 d. mauve in a pair, 6 d. blue in a pair, 1 s. red-brown in a pair and a block of four; 2 s. carmine in a pair; 1891/92 (surcharge Type 2) with multiples of the 1 s. value in various shades, similar range for the 2 s. value; 1876/80 issue with 1 d. blue-green in a range of multiples including a perf. 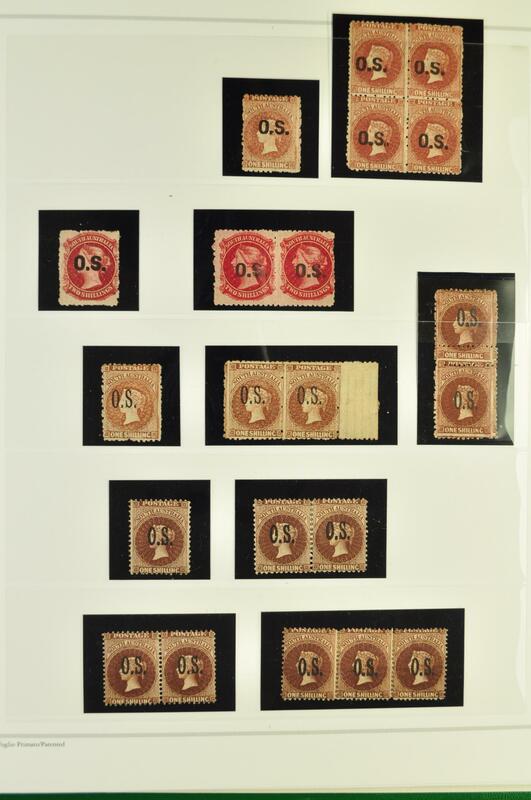 10 block of nine, 2 d. orange-red in a block of nine, 1882 ½ d. on 1 d. pair, 1891/96 2 d. block of four and a pair with one stamp 'No. 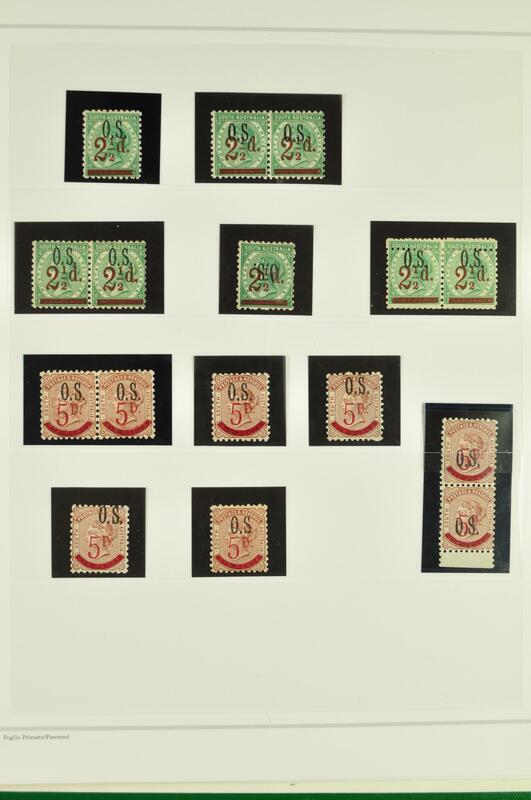 Stop' variety, 1891/99 bantam ½ d. brown in a block of four, 2½ d. on 4 d. deep green in a pair with additional row of horizontal perforations etc. 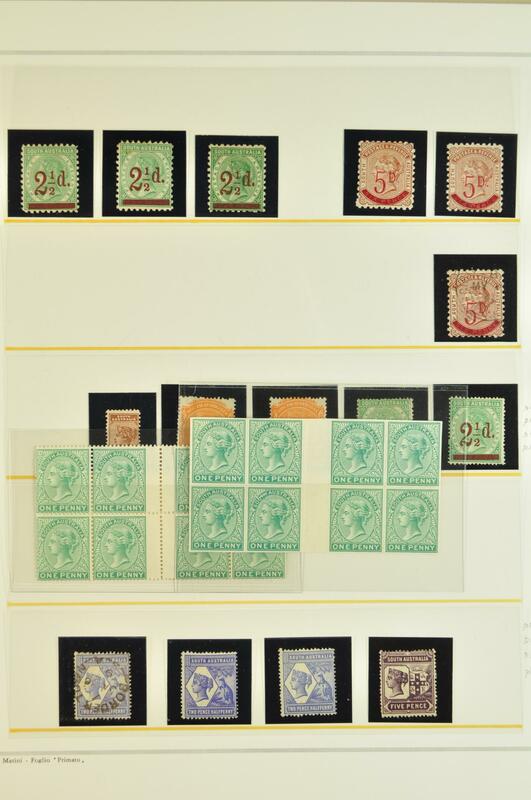 A highly catalogued collection largely in premium quality throughout (210 items). 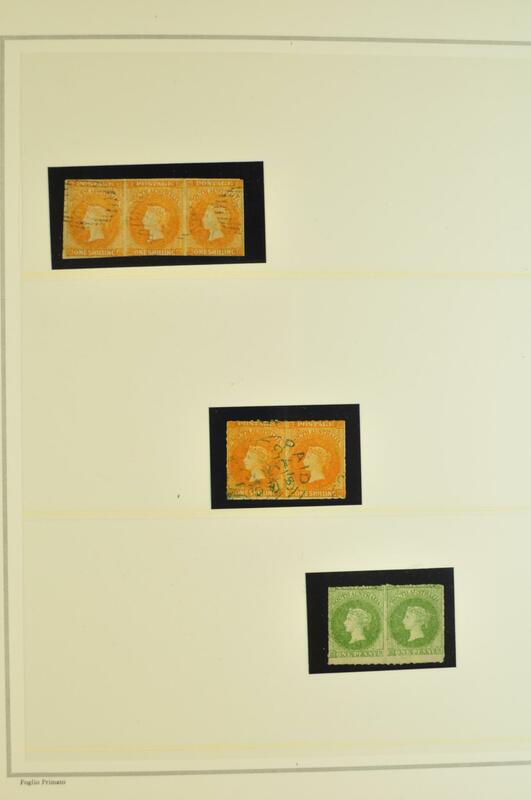 1856/1906: Collection with 1856 2 d. red used (3), 1858 2 d. orange-red in a used strip of three and three single examples, 1858 rouletted 1 d. green pairs used (2), 2 d. red in a used strip of three, 6 d. slate in a used pair and 1 s. orange in used pairs (3) and a strip of three, 1860/69 second rouletted issue 1 d. green in an unused pair, 1867/70 perf. 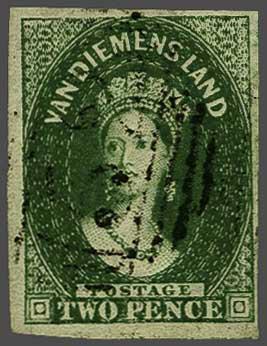 x rouletted 1 d. green unused (6, incl. 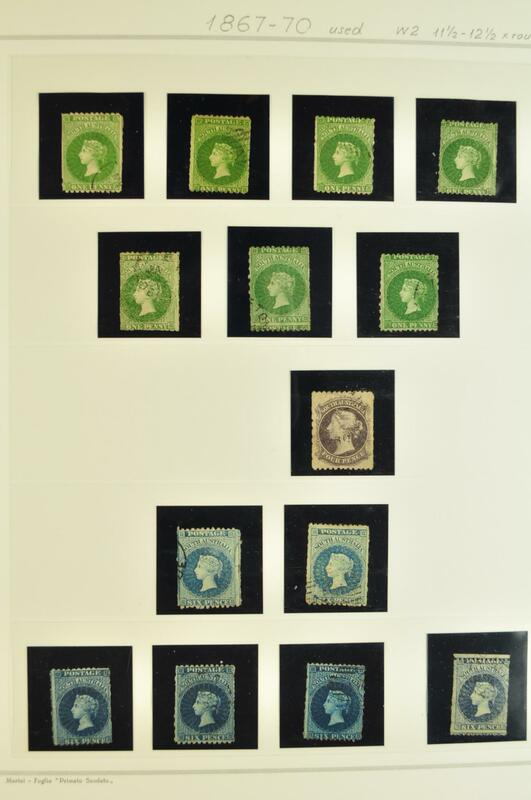 a pair) and used (7), 4 d. dull violet used, 6 d. blue used (6), 1 s. brown used (5); 1870/71 1 d. green used (11 incl. 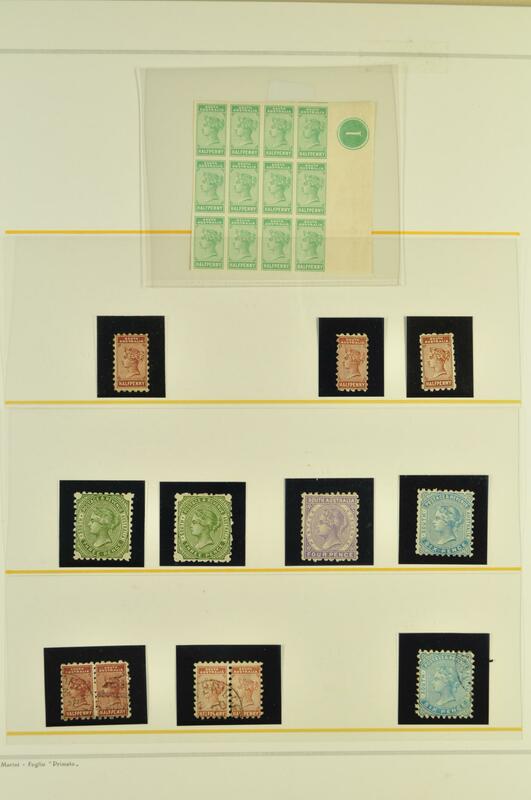 a trimmed cover with two singles), 3 d. on 4 d. in red used (3), 3 d. on 4 d. bright ultramarine unused and used (8), 4 d. unused (2), 6 d. blue unused and used (4), 1 s. chesnut unused and two used pairs; 1870/73 1 d. green unused (4), 4 d. lilac unused (2) and used (5), 2 s. carmine unused and used; 1876/1900 with 3 d. on 4 d. unused (4) and used (4), 4 d. mauve (shades) unused (7) and used (8), 6 d. blue unused (3) and used (5), 8 d. on 9 d. unused (7) and used (9, one with double print variety), 9 d. rose-lilac unused (18 incl. 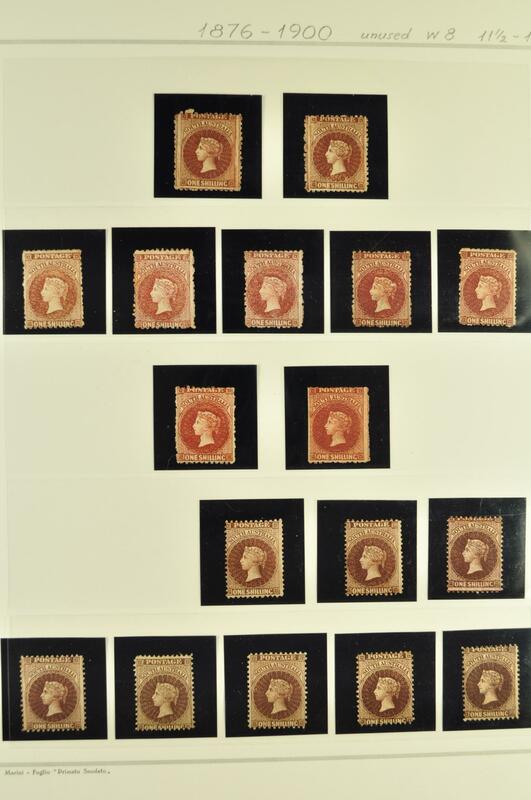 a block of nine) and used (10), 1 s. brown (shades) unused (17) and used (20), 2 s. carmine unused (9) and used (20, incl. 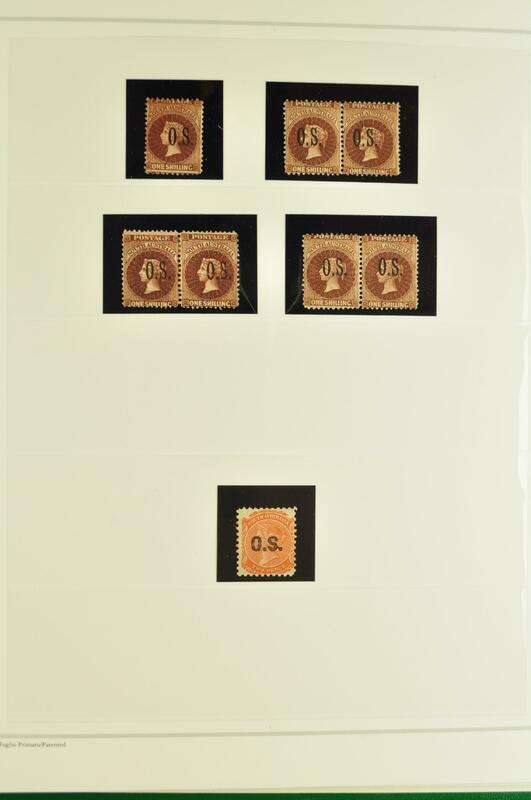 a block of six), 1879 6 d. perf. 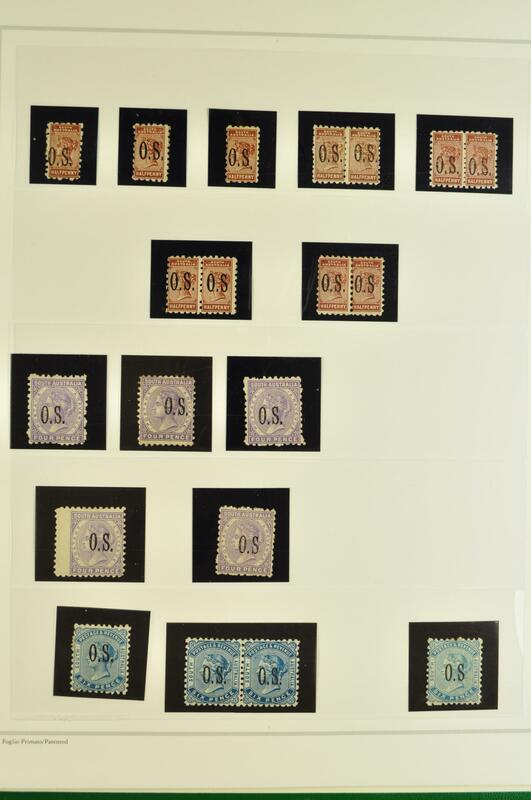 10 unused and used (5); 1879/87 4 d. unused (17 incl. 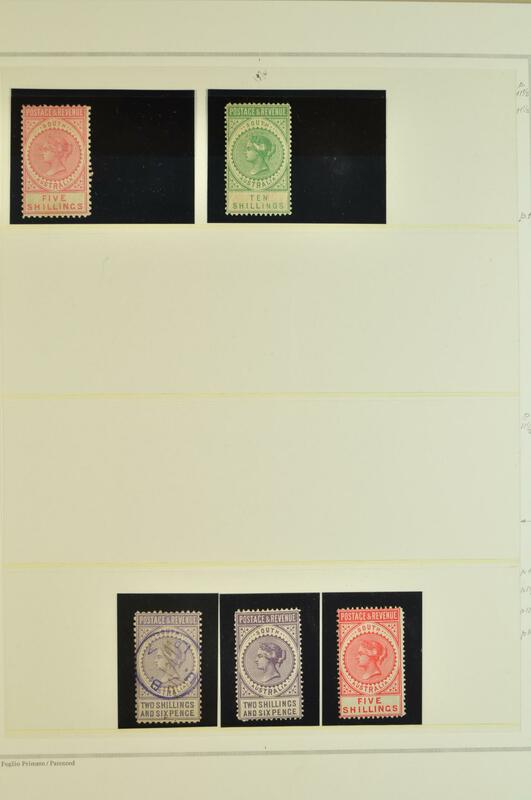 a block of four) and used (17 incl. 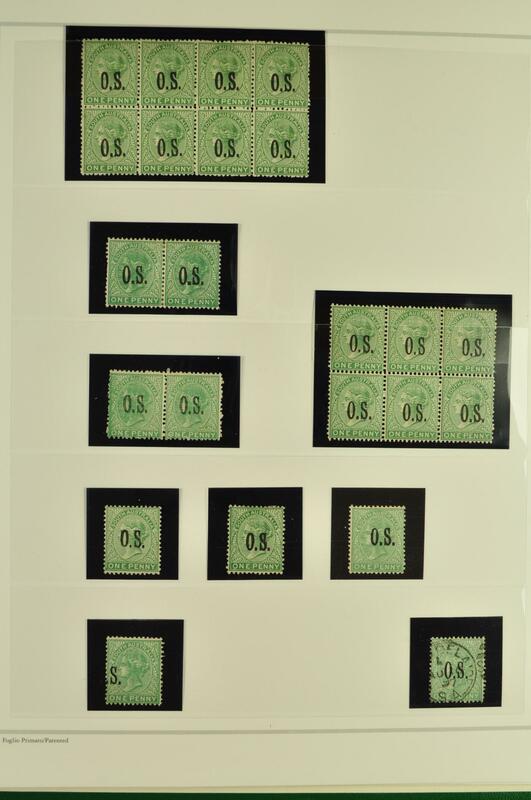 a double print), 6 d. unused (14) and used (17) 1 s. unused (4) and used (6), 2 s. unused (7) and used (9); Government reprints overprinted in black (24 stamps); 1886/96 2 s. 6 d., 5 s. (2) and 10 s. unused and a SPECIMEN set to £ 20; 1891 2½ d. on 4 d. in a pane of 60 stamps with two stamps showing missing Fraction Bar variety etc. 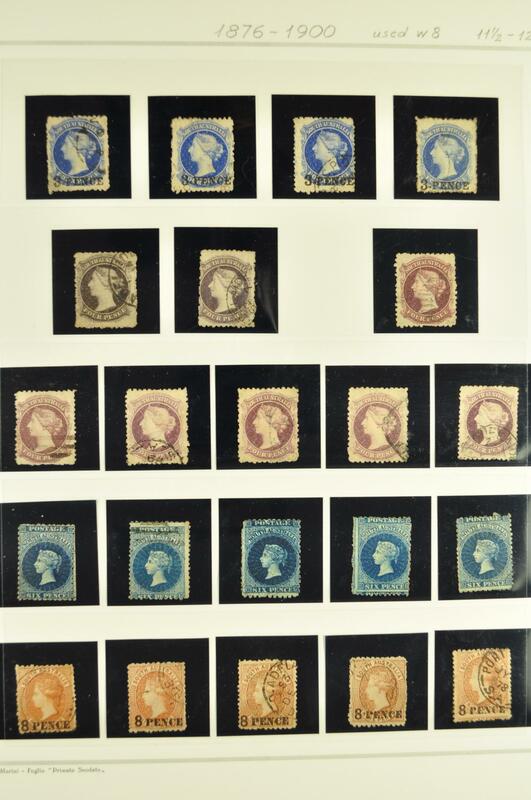 A generally fine lot with much to attract the specialist (400+ items). 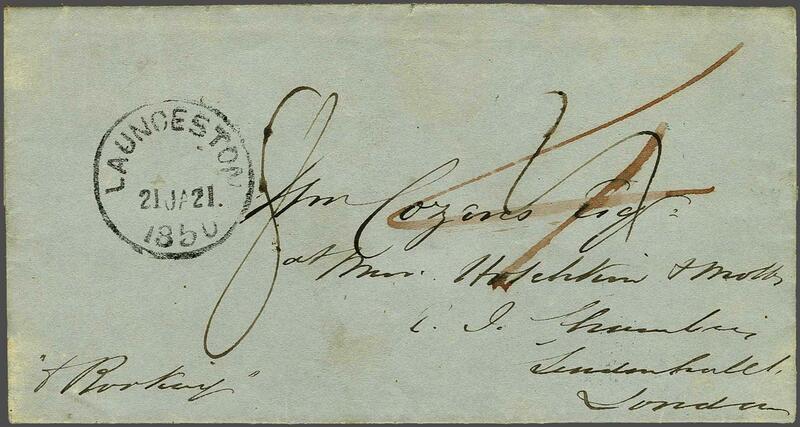 1850: Entire letter from Launceston to London, struck with LAUNCESTON despatch cds (Jan 21) in black and rated '4' (pence) prepaid in red manuscript. 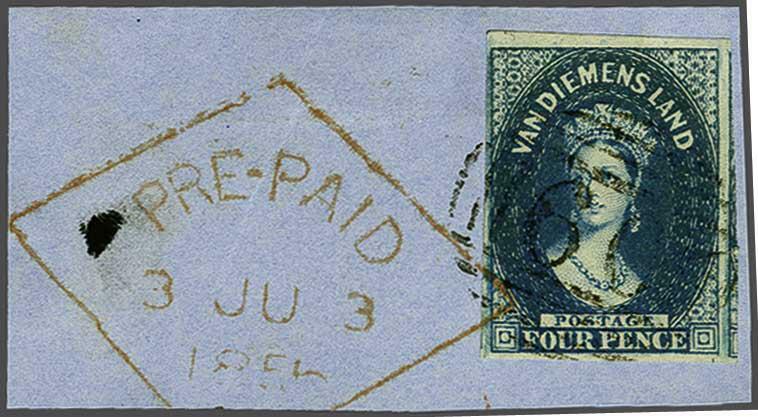 Reverse with step-type FALMOUTH / SHIP LETTER in blue and charged '8' (pence) for this service. 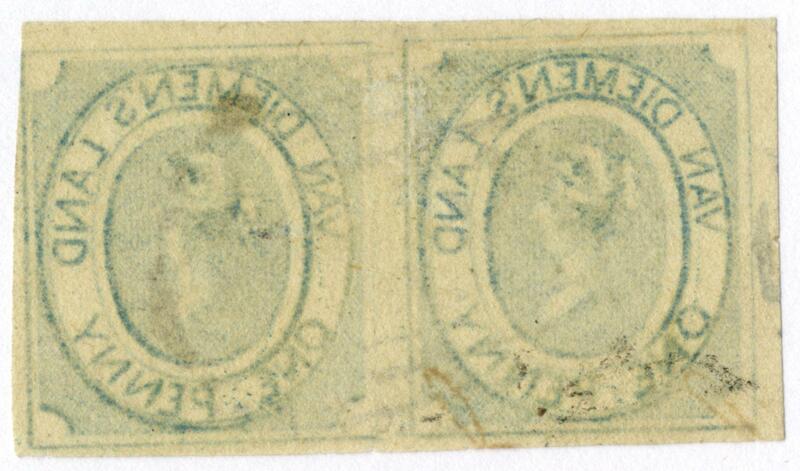 First Issue on medium soft yellowish paper 1853 (Nov 1): 1 d. blue, a used horizontal pair, good even margins on left hand stamp, close but clear at upper right, slight marginal thin at top, lightly cancelled in black. An attractive pair Gi = £ 3'000. 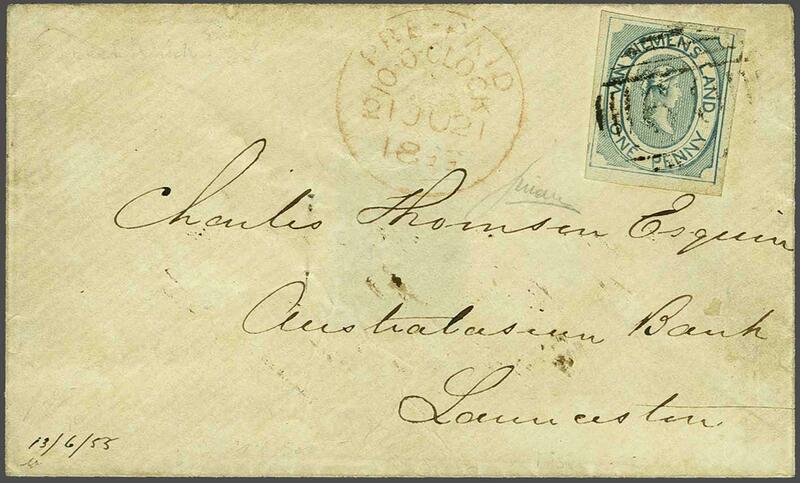 First Issue on thin hard white paper 1853 (Nov 1): 1 d. pale blue, a very fine used example of good colour, ample to large margins all round, used on small 1855 envelope addressed locally, tied by "60" numeral obliterator of Launceston in black. Circular 'PRE-PAID / 10.O'CLOCK' datestamp in red at left (June 21, with year date showing '55' inverted). 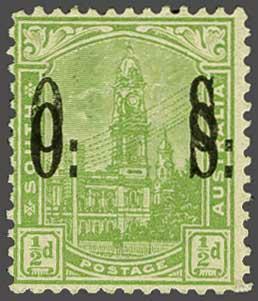 Seal removed from reverse and a couple of minor spike holes (addressed to the Australian Bank) but a fine and very rare Town Post cover. Signed H. Köhler, Friedl. Fine Engraving 1853 (Nov 1): 4 d. bright red-orange, Plate 1, position 7, early-intermediate impression, imperforate on medium hard wove paper, a brilliant unused example with ample to large even margins all round, of exceptionally bright colour, light horizontal bend of no significance and not affecting the lovely appearance in any way. 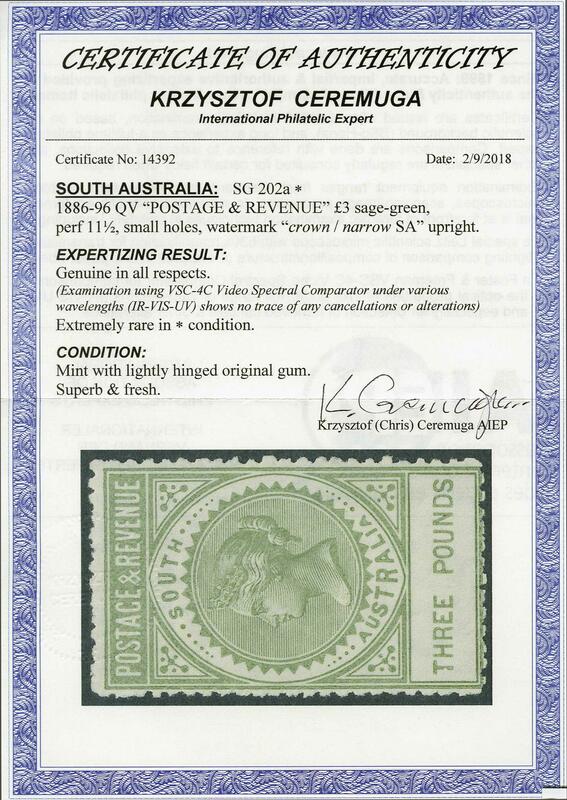 A delightful and very rare stamp. Cert. Ceremuga (2018) Gi = £ 8'500. 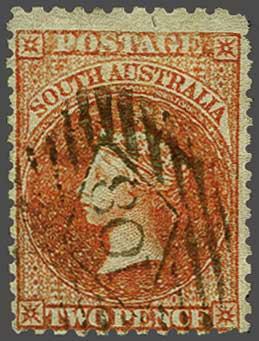 Fine Engraving 1853 (Nov 1): 4 d. bright red-orange, Plate 1, imperforate on wove paper, a very fine used example with large margins all round, of superb bright colour, neatly cancelled by "62" numeral obliterator of Hobart in black. 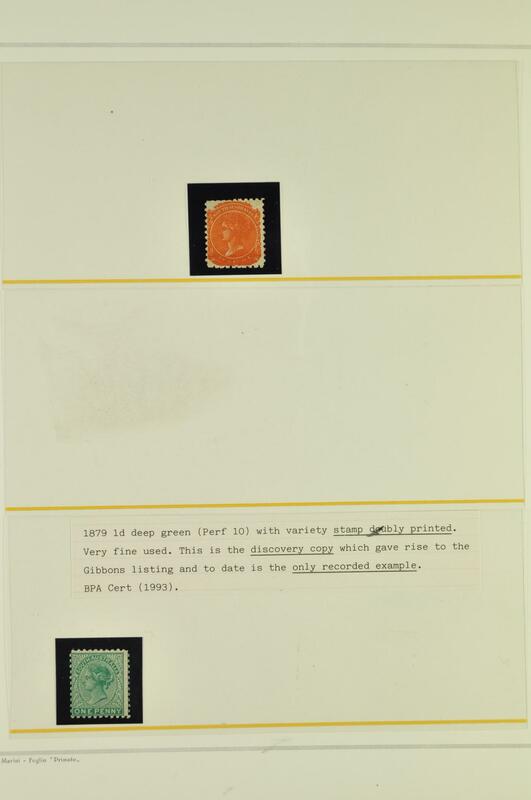 A delightful stamp Gi = £ 1'000. 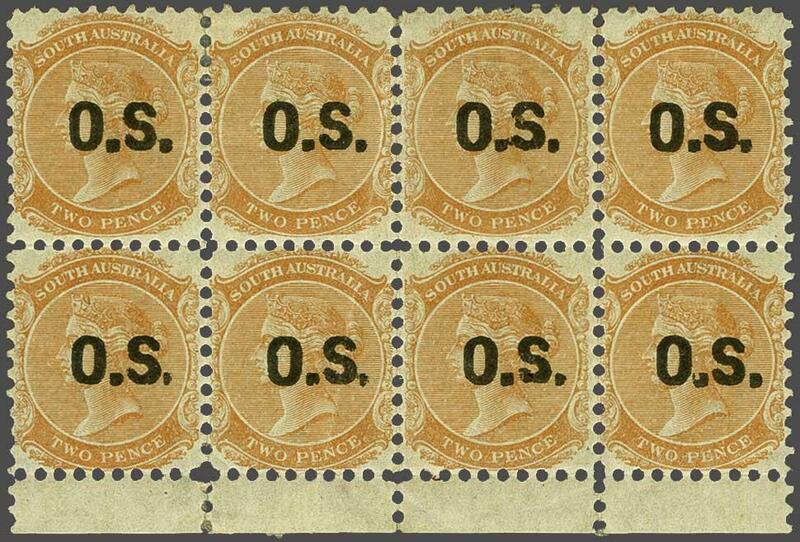 Second State of the Plate 1853 (Nov): 4 d. red-orange, a superb used pair with fine to huge margins on all sides, of excellent colour, minute thin spot between the stamps, beautifully cancelled by bold strike of "18" numeral obliterator of Campbell Town. Exceptional and most appealing multiple. Signed Holcombe Gi = £ 950+. 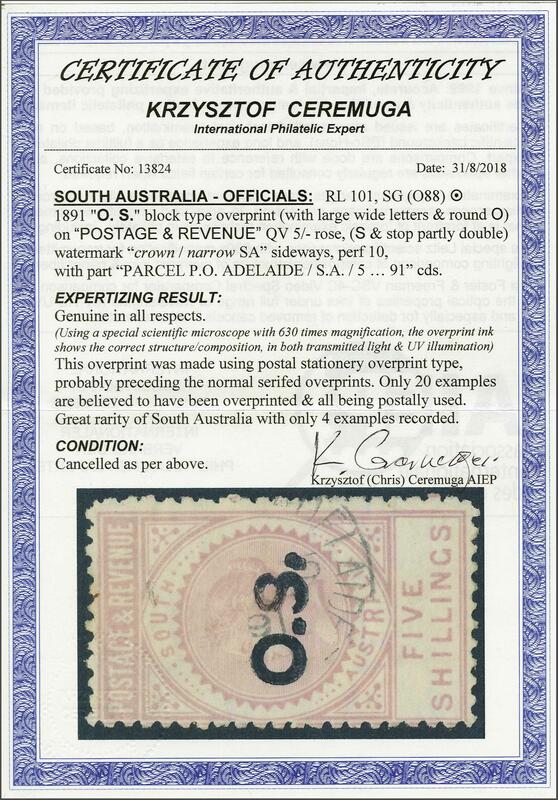 rnrnProvenance: Corinphila sale 72, September 1985, lot 7364. 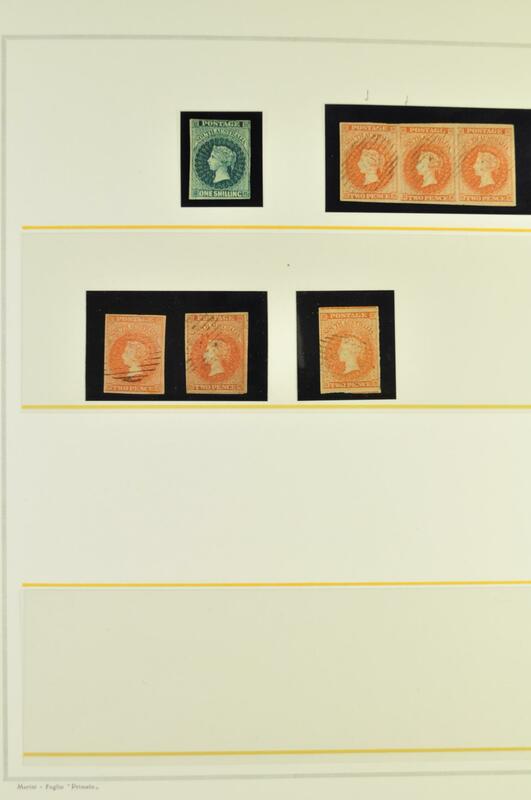 Second State of the Plate 1853 (Nov): 4 d. pale orange, a fine used example with large margins on all sides, of fine delicate colour, superbly cancelled by bold strike of "18" numeral obliterator of Campbell Town Gi = £ 450.rnrnProvenance: Corinphila sale 72, September 1985, lot 7365. 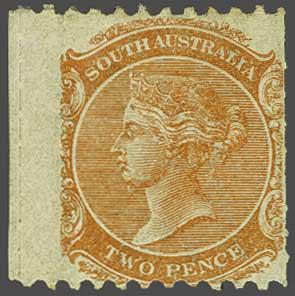 Coarse Engraving 1853 (Nov): 4 d. dull orange, Plate II, lines of background blurred, a used example with large margins all round, cancelled "Torquay 28/7/55" in manuscript ink. Rare and fine Gi = £ 425. 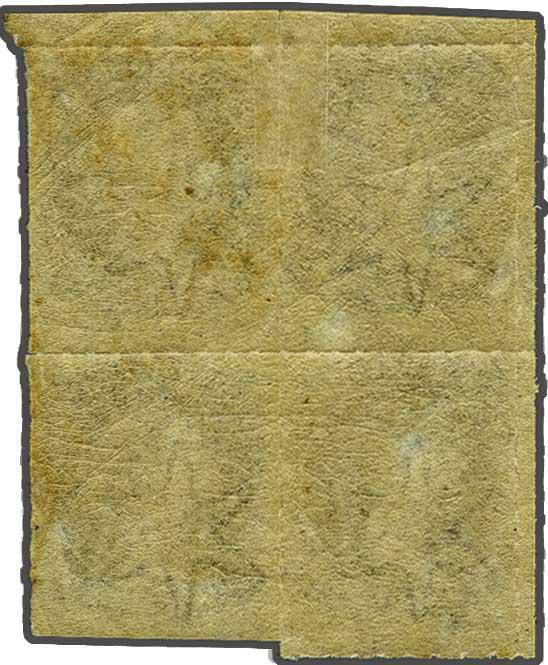 Coarse Engraving 1853 (Nov): 4 d. orange, Plate II, lines of background blurred, an exceptional used example with good to large margins all round, minor corner bend of no importance as showing full imprint from position 24 at lower right of sheet "C. W. Coard Sc. 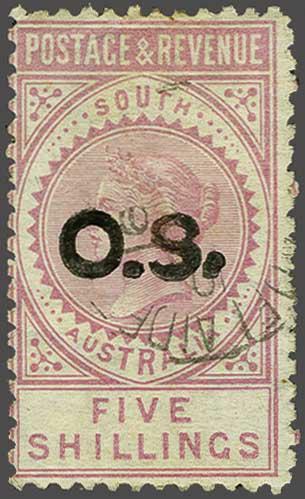 ", cancelled by fine "60" numeral obliterator of Launceston. 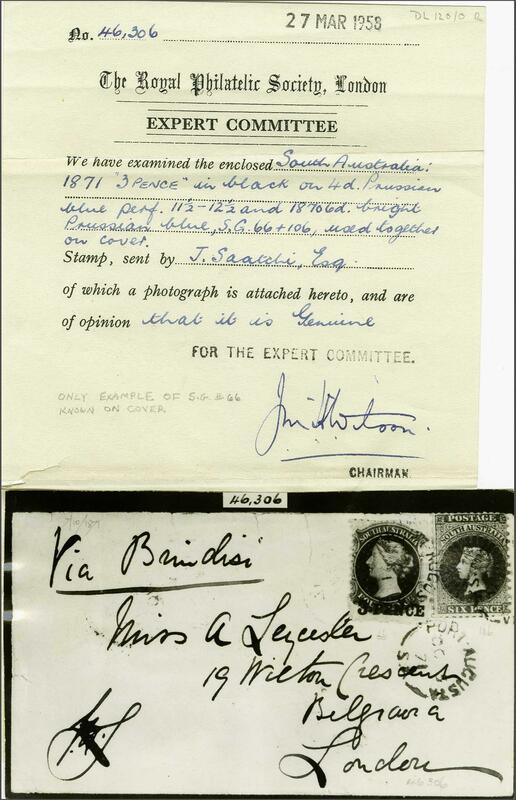 A wonderful and very rare stamp Gi = £ 425+.rnrnProvenance: Collection Louise Boyd Dale & Alfred Lichtenstein, Harmers, London 14 May 1990, lot 177. 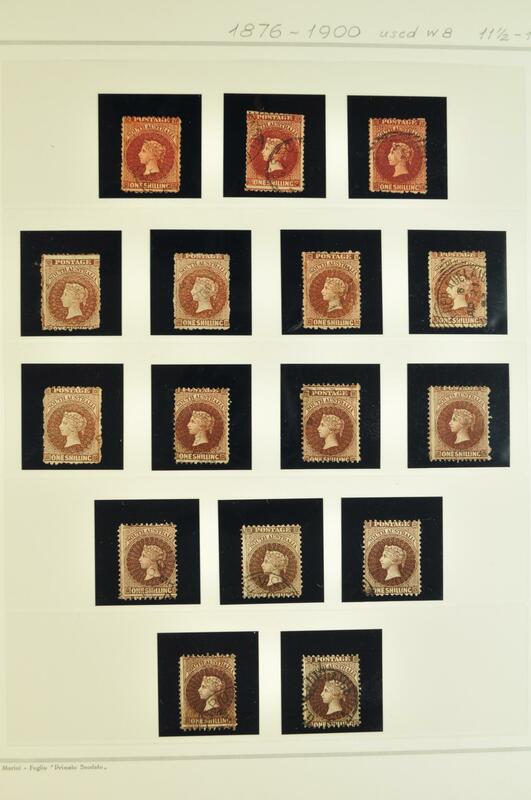 Coarse Engraving 1853 (Nov): 4 d. dull orange, Plate II, lines of background blurred, a used example with even margins all round, cancelled by "59" numeral obliterator of Launceston in black Gi = £ 375. 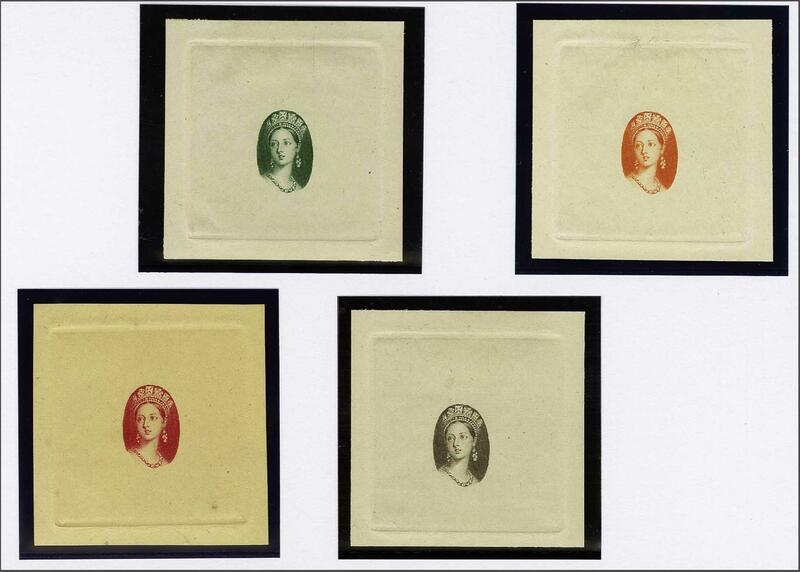 Chalon Head Issues, London Printings 1854: Perkins Bacon Humphrys head-plate Die, reprinted impressions (4) of the head-plate only, inset on wove paper, in brown on cream, carmine on yellowish, green on white and orange on white. A charming group. 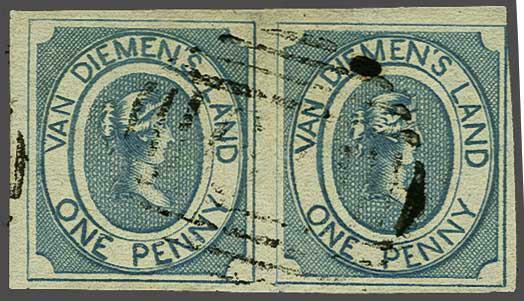 Chalon Head Issues, London Printings 1854: Perkins Bacon Die Proof for the rejected / unfinished Transfer 1 d. Die, printed in steel-blue on soft surfaced white card, 46 x 88 mm., without 'Van Diemens Land' at top. For similar examples in black and vermilion see Sebastian Earl lots 2086 and 2087. A rare and beautiful Proof. 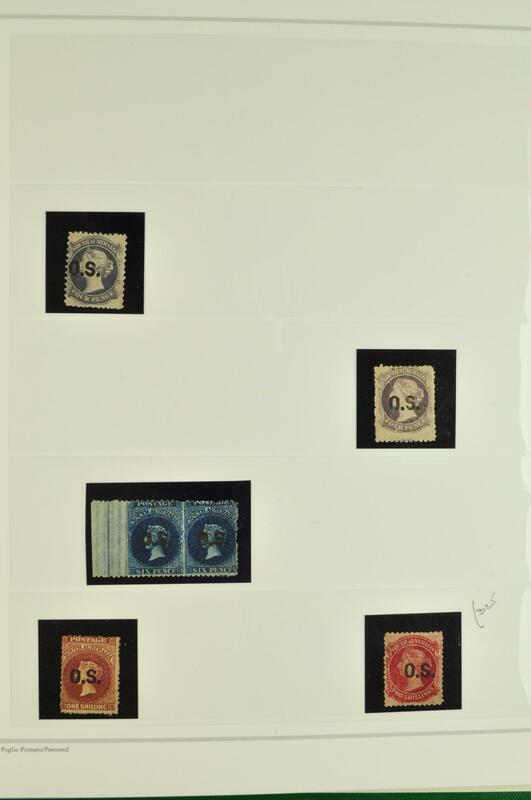 Chalon Head Issues, London Printings 1855 (Sept 16): 1 d. carmine, wmk. 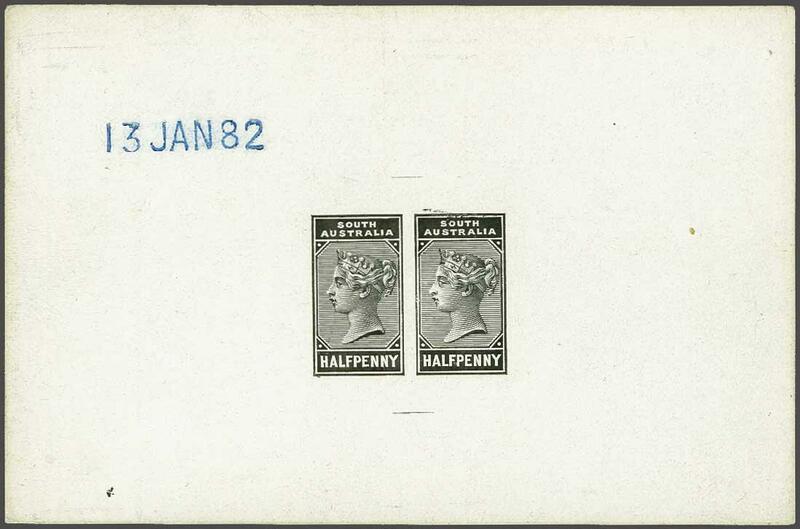 Large Star, imperforate, an unused example of outstanding fresh colour, good even margins all round, unused without gum. Superb and rare. Signed Holcombe. Cert. 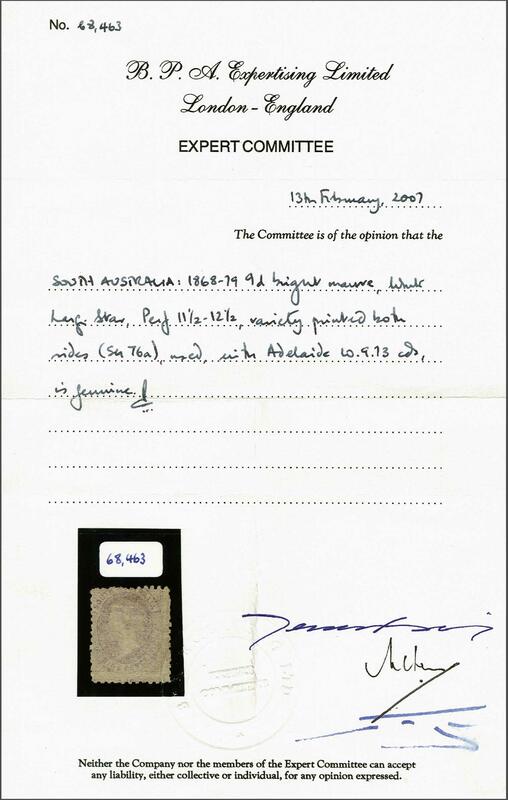 RPSL (1972) Gi = £ 10'000. 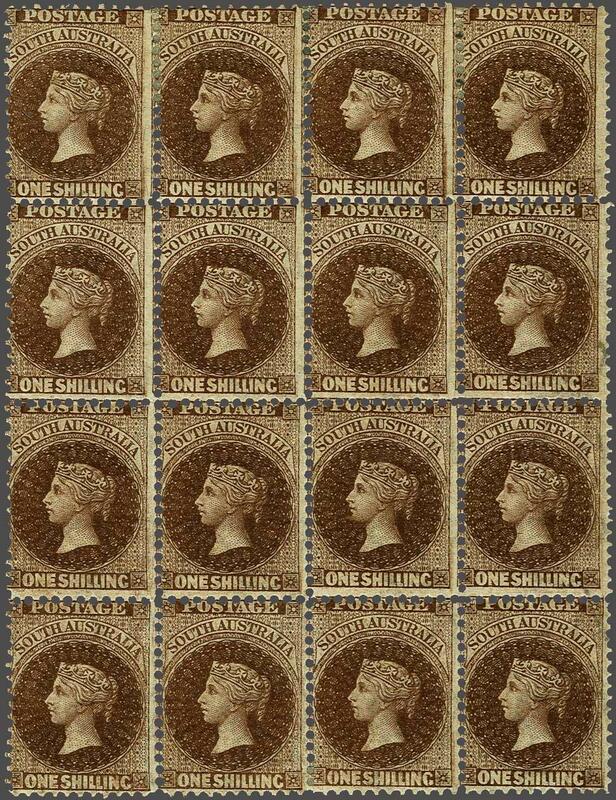 Chalon Head Issues, London Printings 1854: Perkins Bacon 2 d. value, the Master Die Proof in black on India on thick card, 30 x 34 mm., superb Proof of gorgeous execution and extremely rare.rnrnProvenance: Spink, 9 Nov 2006, lot 2206. 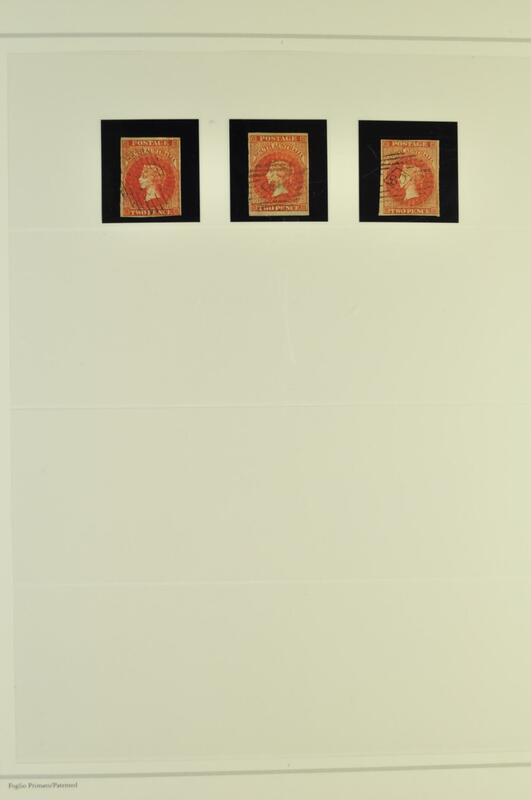 Chalon Head Issues, London Printings 1854: Perkins Bacon Plate Proofs for the 2 d. value, imperforate horizontal pairs (3), printed in black on poor quality medium wove paper, one with vertical pre-printing paper-fold, another with prominent re-entry on TWO PENCE. A fine group. 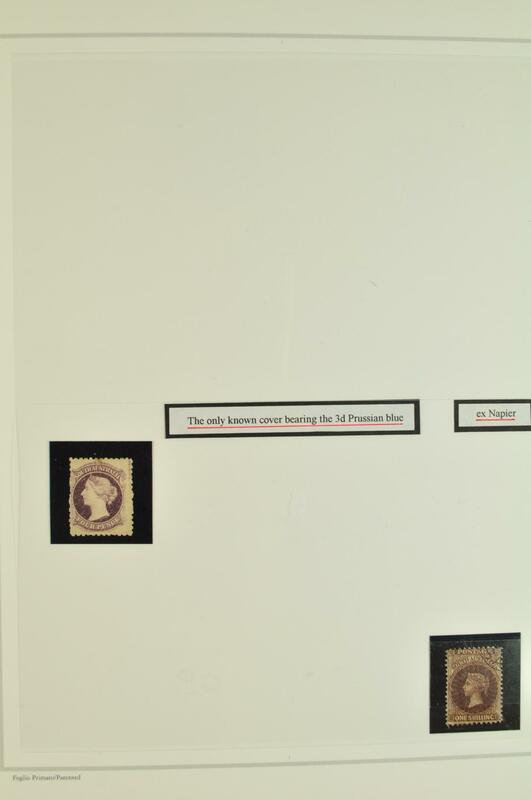 Chalon Head Issues, London Printings 1854: Perkins Bacon Plate Proof for the 2 d. value, imperforate block of four, printed in black on poor quality medium wove paper. 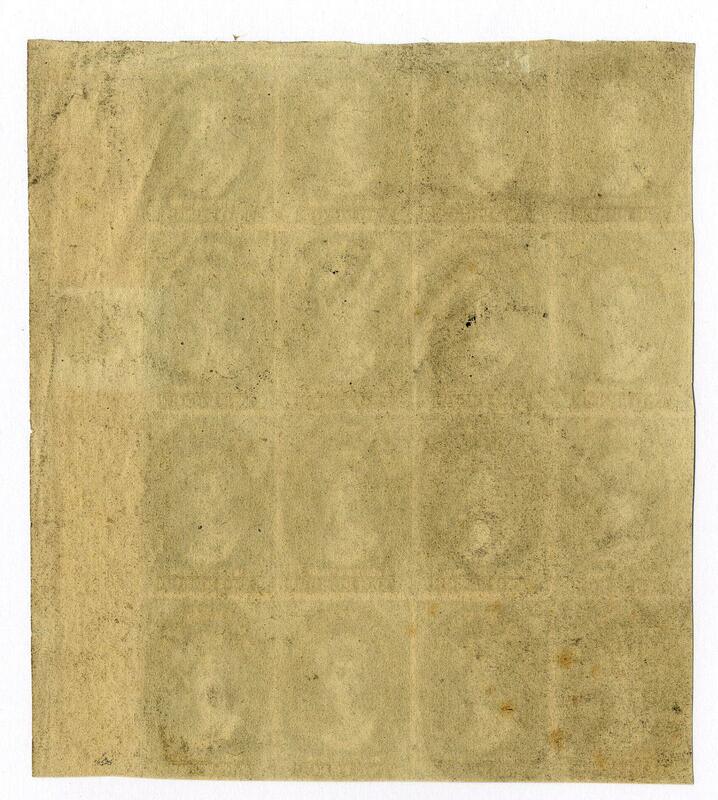 Chalon Head Issues, London Printings 1854: Perkins Bacon Plate Proofs for the 2 d. value, imperforate block of sixteen, marginal from right of sheet, printed in black on poor quality medium wove paper. Fresh and fine, a delightful multiple. 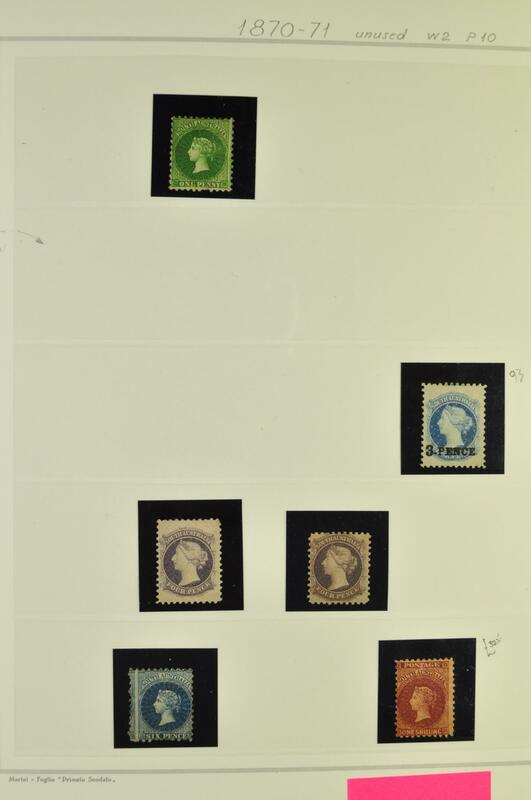 Chalon Head Issues, London Printings 1855 (Sept 16): 2 d. green, wmk. 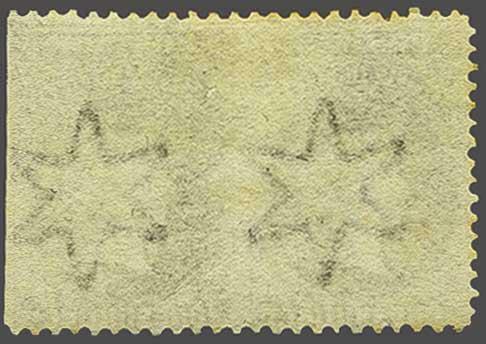 Large Star, imperforate, a fine used example of excellent appearance with good to large margins all round, corner crease unapparent on face, cancelled by "52" numeral obliterator of Ross in black Gi = £ 450. 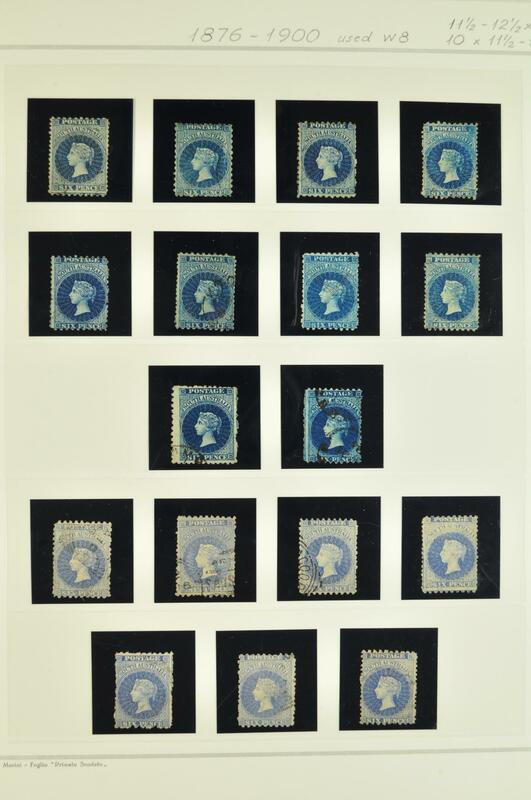 Chalon Head Issues, London Printings 1855 (Aug 17): 4 d. deep blue, wmk. 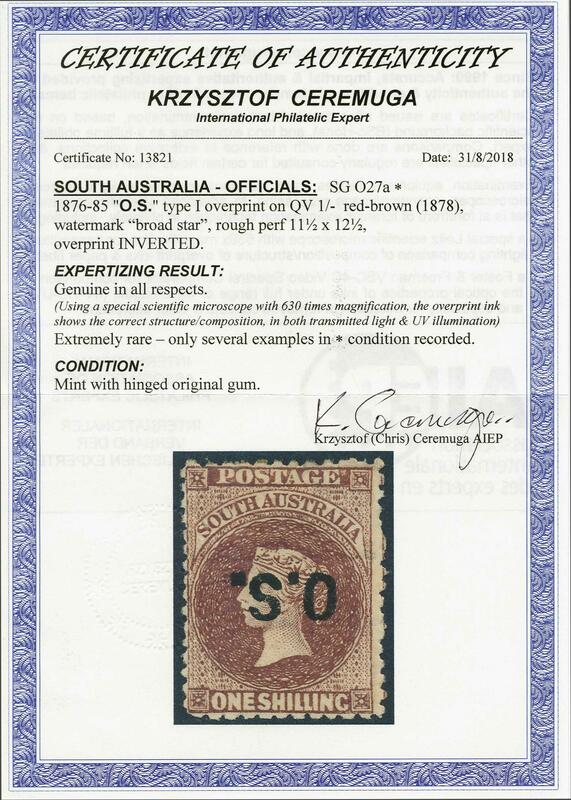 Large Star, imperforate, a very fine used example with large margins on all sides and portion of adjoining stamp at right, neatly tied to small piece by "60" numeral obliterator of Launceston and by diamond 'Pre-Paid' datestamp in red. Slight hole in piece but a delightful stamp Gi = £130. 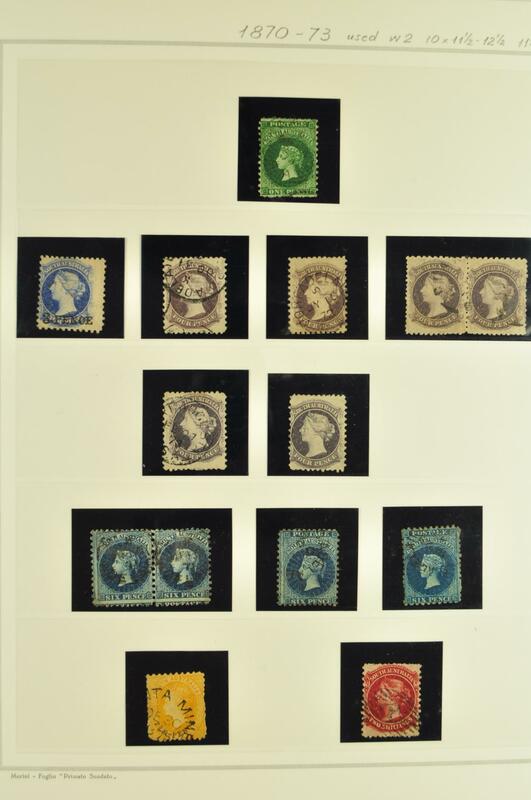 Chalon Head Issues, London Printings 1855 (Aug 17): 4 d. blue, wmk. 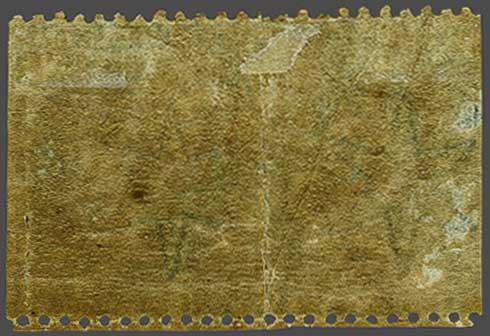 Large Star, imperforate, an attractive horizontal strip of three used on 1856 cover to London at double rate endorsed 'pr. 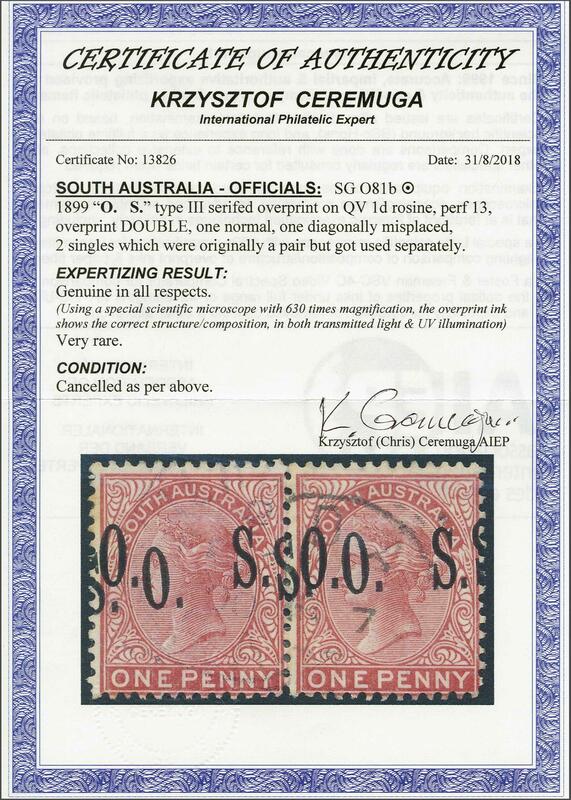 Sardinian', the adhesives with margins touched to huge, tied by "60" numeral obliterators of Hobart in black, and by diamond POST-OFFICE / LAUNCESTON / Crown datestamp (June 21) in red and London arrival cds (Oct 14). A fine and most attractive cover. 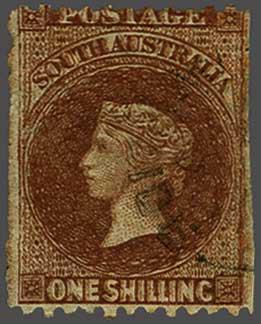 Chalon Head Issues, Local Printings 1856 (April): 1 d. pale brick-red, no wmk., imperforate, a superb used example with large margins all round, of fine delicate colour, lightly cancelled by "64" numeral obliterator of Hobart in black. 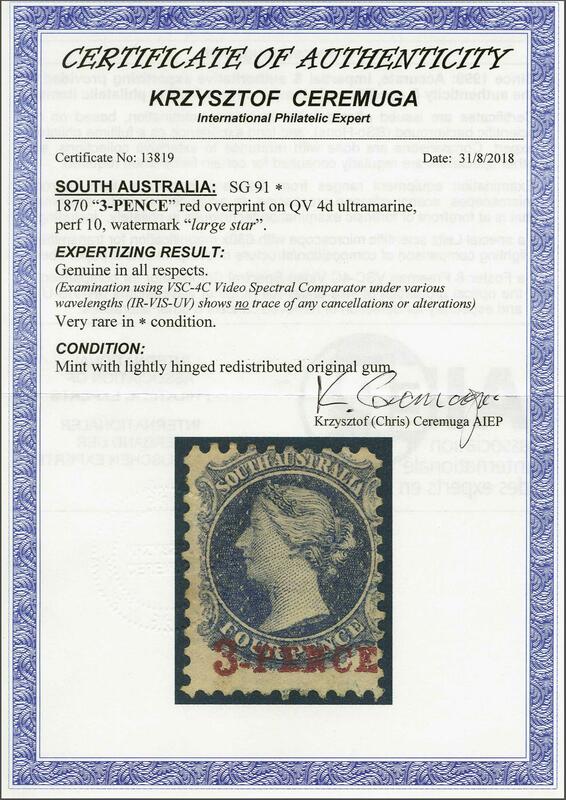 A rare and fine stamp. Signed Roumet Gi = £ 650. Chalon Head Issues, London Printings 1858: Perkins Bacon Die Proof, reprinted from the rejected Die of the 6 d. value without inscriptions, the background to the head-plate differs from that of the issued Die, the central oval being carefully inserted but the gaps to the eight sided frame have not been completed. 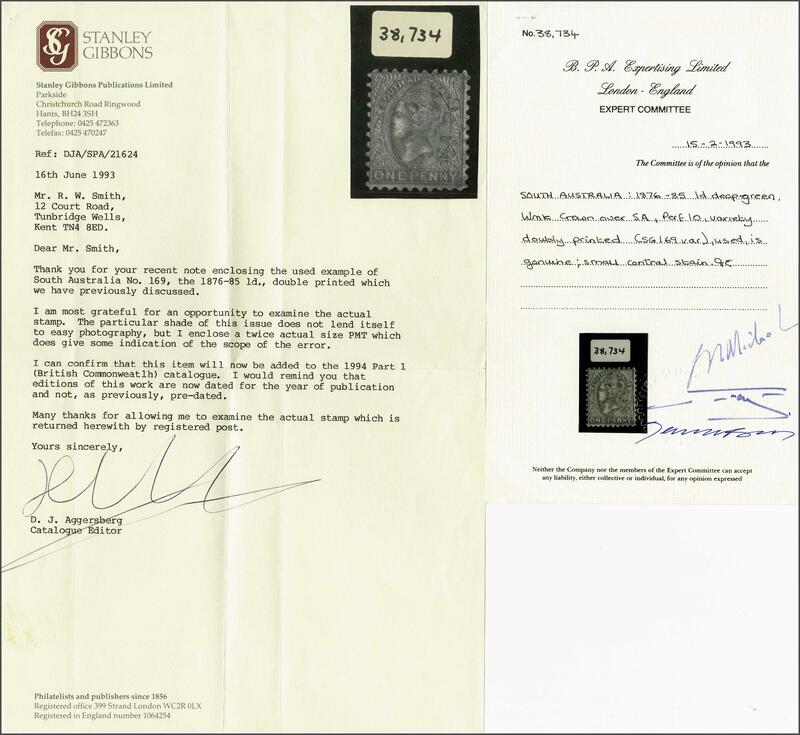 Rare and beautiful Proof.rnrnProvenance: Collection Sebastian Earl, RL, Geneva, 25 April 1980, lot 2212.